After about 4 years of starting to get to grips with managing and trying to restore the meadows around our cottage home, (initially a sadly fairly low priority for us in the long list of jobs to do when you take on a derelict property), I thought it would be helpful to group any postings that I’ve written on the subject of our meadows in one place, in chronological order to save ferreting around through all my previous blog posts. So that’s the purpose of this page. 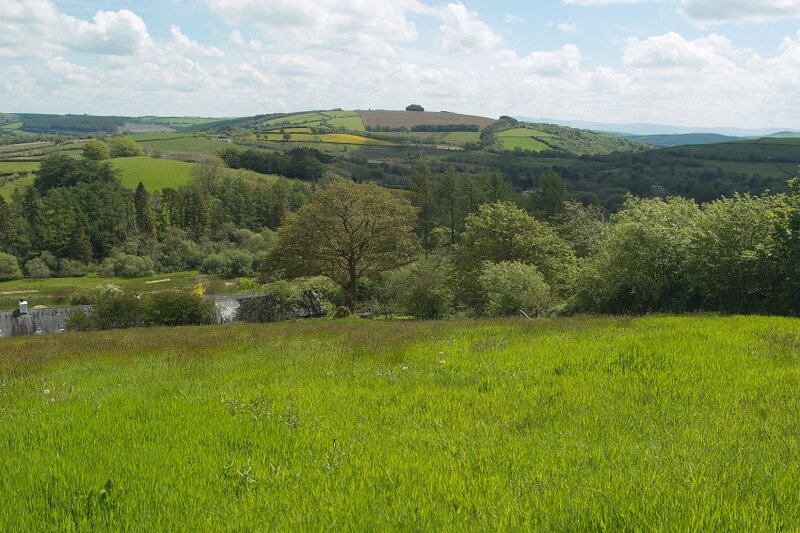 As of May 2015, I volunteered to set up and run a website for the fledgling Carmarthenshire Meadows Group, so now many of the posts I and others write about this subject can be found by clicking here. 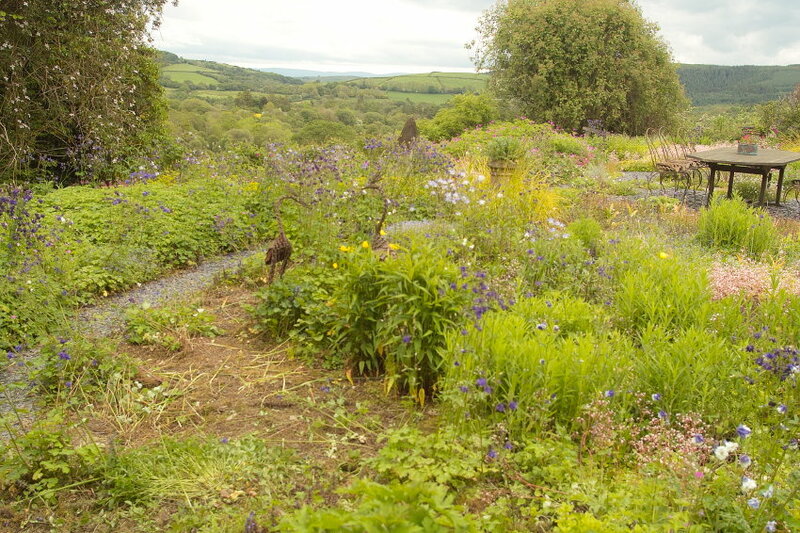 I’ll eventually preface it with a subfolder showing all the flowers and grasses which I’ve found are now growing on these 11 acres. Starting in this year 2015. I’m sure species diversity will increase with time, but these are the plants available to our small flock of Tor Ddu sheep to graze on. 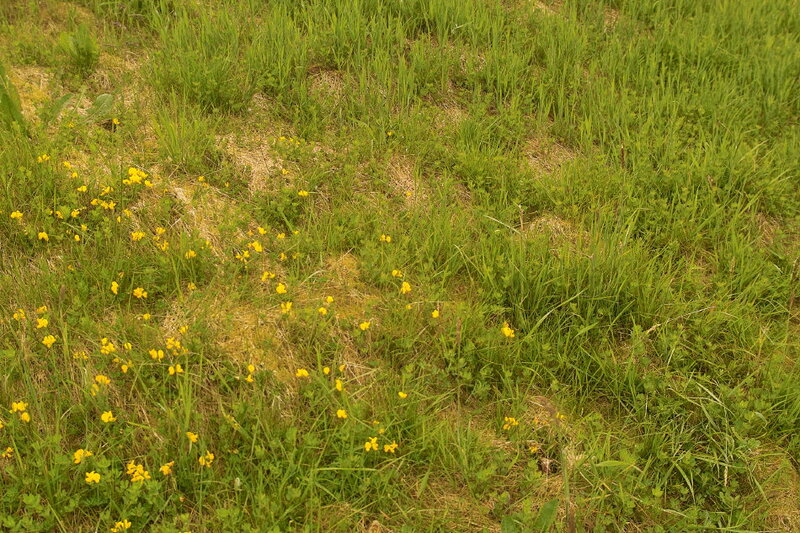 Compare this with a typical modern pasture field. What does any other lamb or meat we eat feed on? 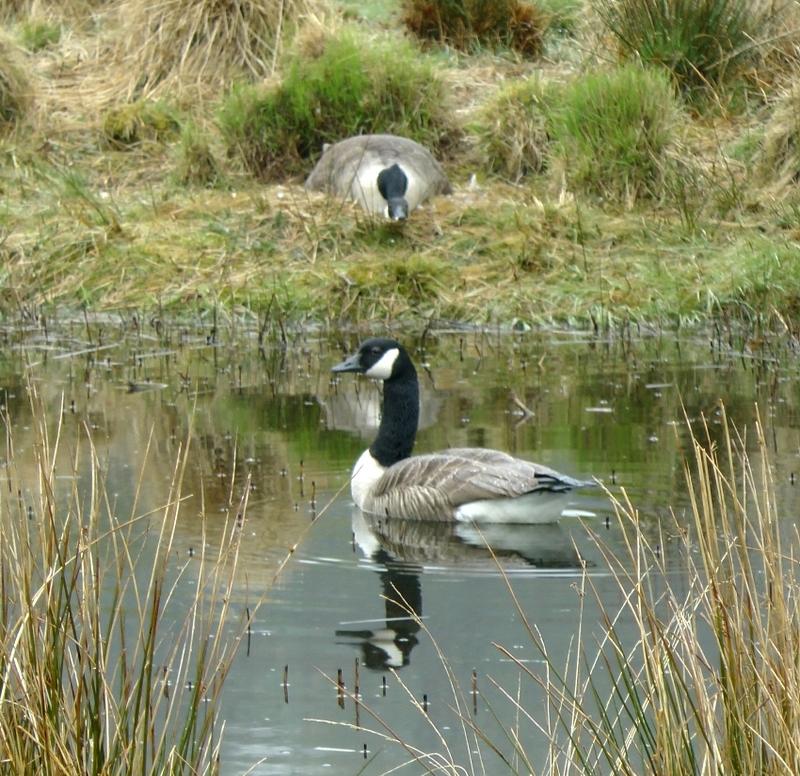 And what about the wider diversity of life which also makes a home in this small patch of upland Wales? 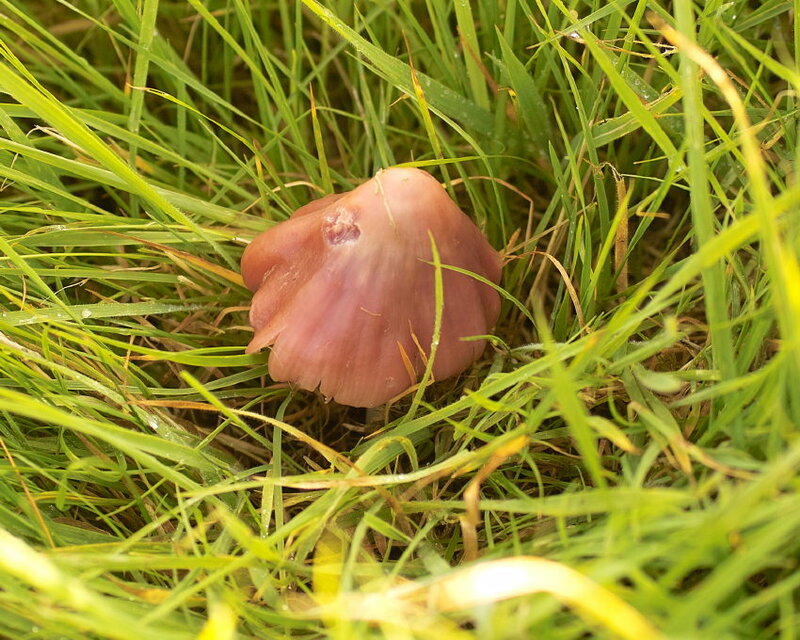 Pounding the High Meadow path in drizzle meant I spotted these quite large ( 5 to 6 cm) pinkish brown Waxcap mushrooms…. 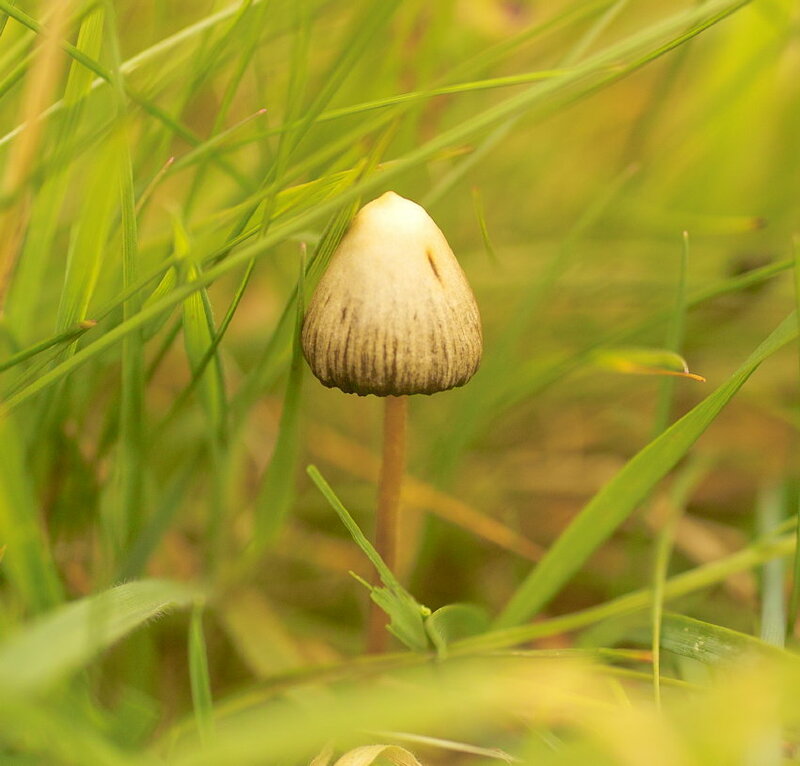 And as I consulted my excellent Roger Phillips authored ‘Mushrooms and Other Fungi of Great Britain and Europe’ to identify this large species, the page fell open on Page 62, and there it was, Hygrocybe calyptriformis( calyptraeformis). The appropriately named Pink Waxcap. And even more interestingly, since there were perhaps a dozen of these mushrooms within a few yards of the meadow path, it’s listed as a rare mushroom. 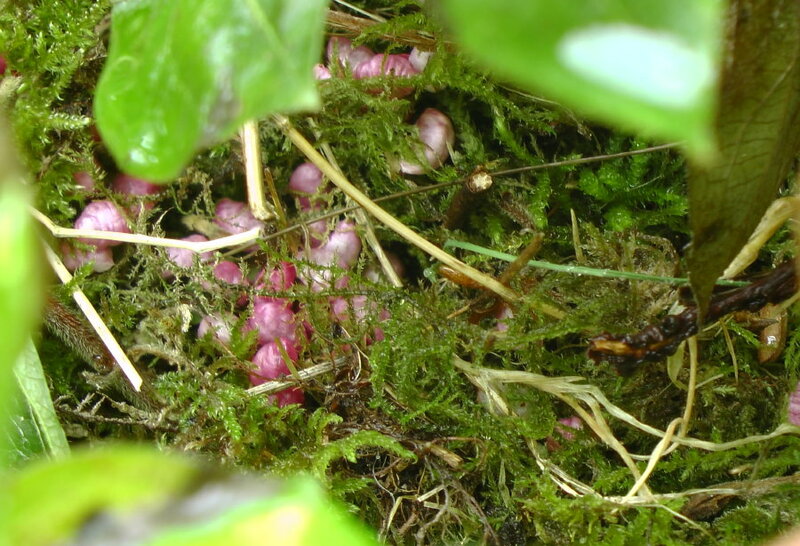 In fact so rare that it features as one of the few Red Data Book mushroom species in the UK, and it’s been given a place in Biodiversity Action Plans for the UK. 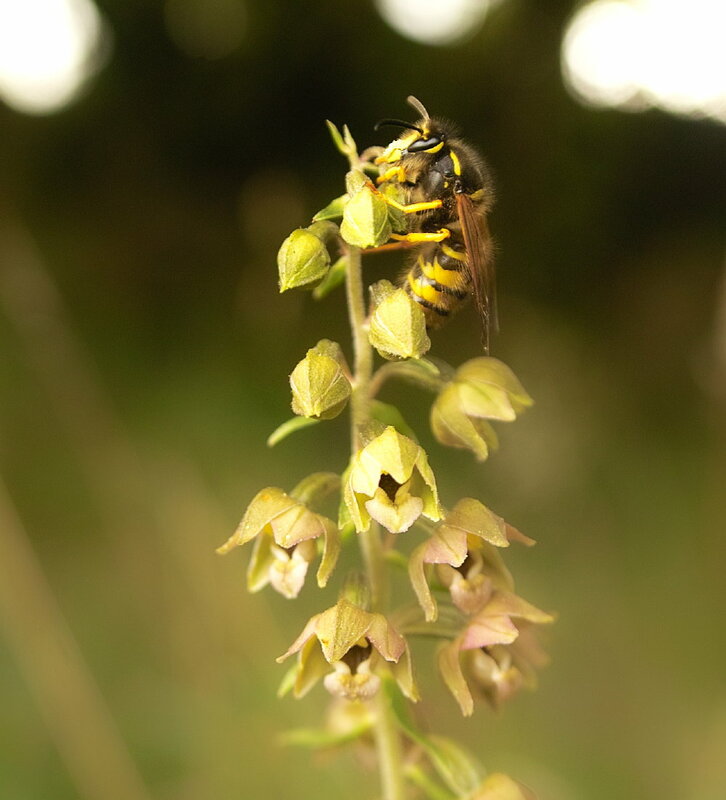 If you’re interested in more on this species, click here for what seems to be a very comprehensive 27 page review of it and its distribution, produced by Plantlife. 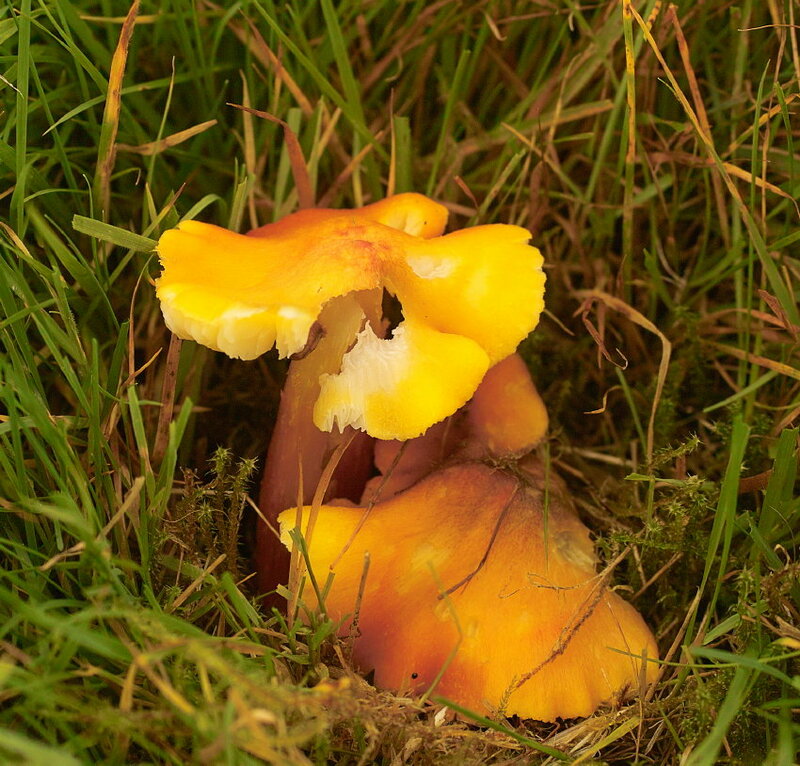 More mushrooms have popped up in the garden as autumnal temperatures and rainfall stimulate fruiting, including a rare Yellow Waxcap probably Hygrocybe subglobispora, in the High Meadow, a short distance from all the Red Data Book Pink Waxcaps mentioned in the last post….. 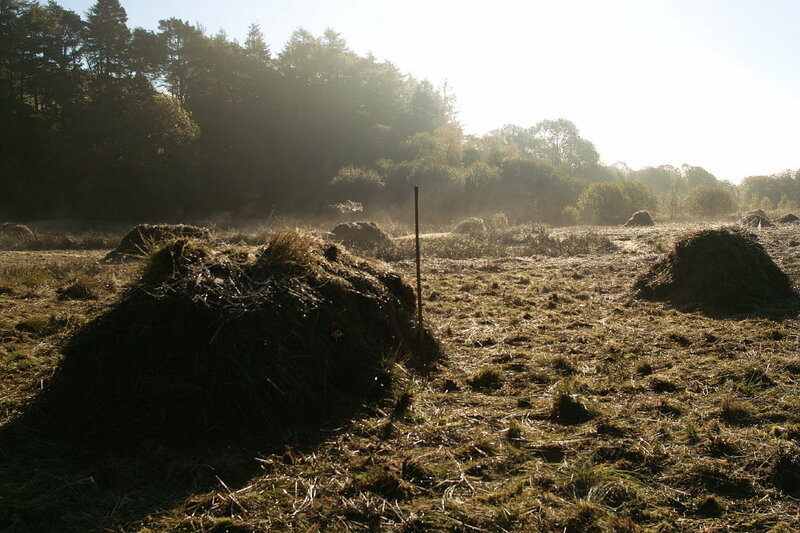 Most people in the UK will know that over the last few decades nearly 98% of permanent hay meadows have been ploughed up and lost to more intensive agriculture. 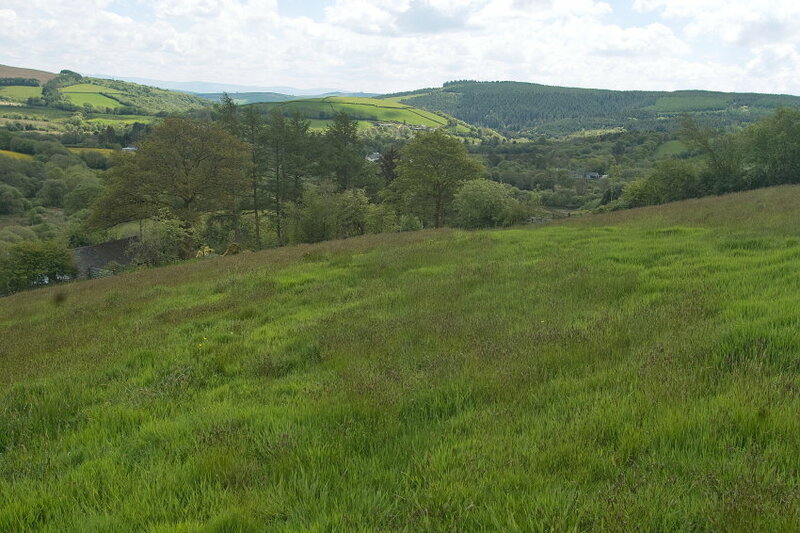 We’re incredibly lucky to have a network of small traditional hay meadows in the ‘cwm’ or valleys that Gelli looks out onto. 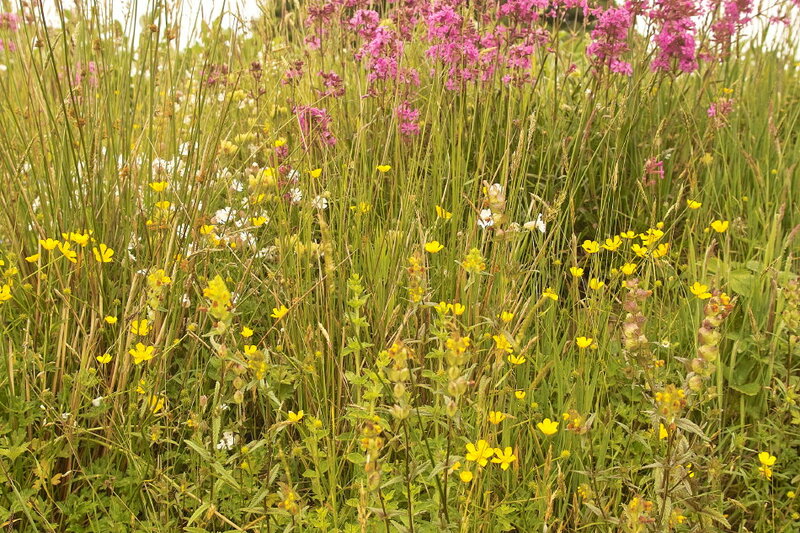 These may not produce the weight of crop that a resown, heavily fertilised modern ley will, but the diversity of plants and sheer numbers of flowers that an old hay meadow contains is astounding. 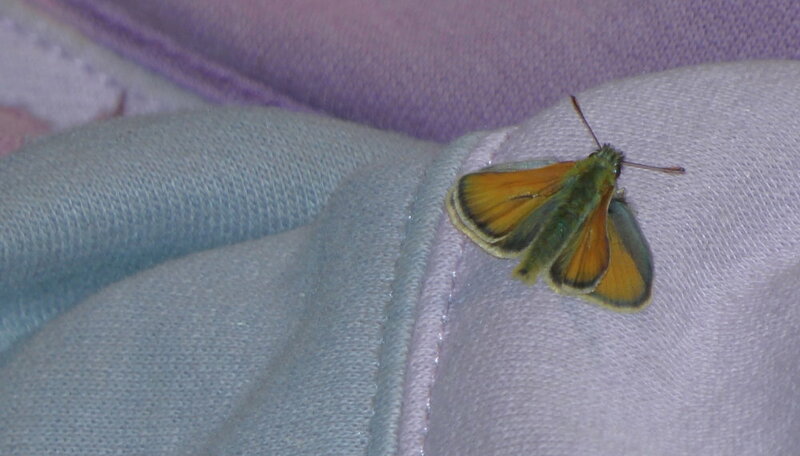 And it’s associated huge insect population. 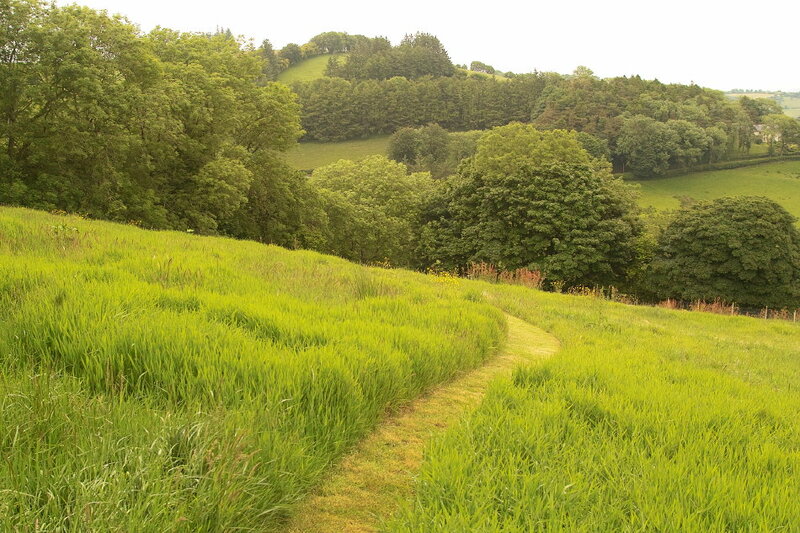 Our neighbour’s adjacent hay meadow (above) has reached this glorious state, over the last 20 years, simply by lack of fertiliser application, late hay cutting, and short grazing over the winter months. I can’t say for certain whether Yellow Rattle was even sown into this field, or whether it has arrived on its own, but its now a dominant feature. 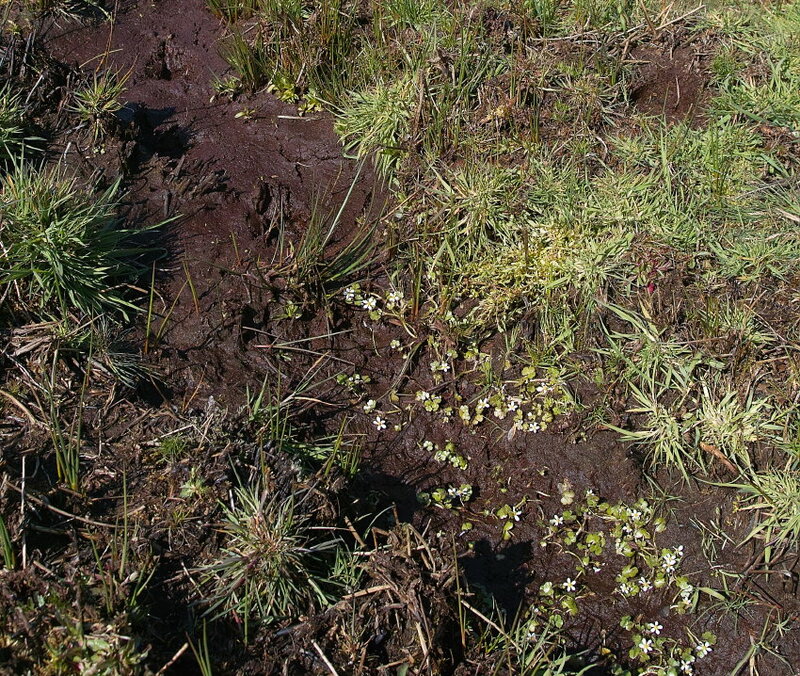 This hemi-parasitic plant has been recognised for some time as being a key element in restoring grassland plant diversity by weakening the growth of some of the more powerful native grasses. 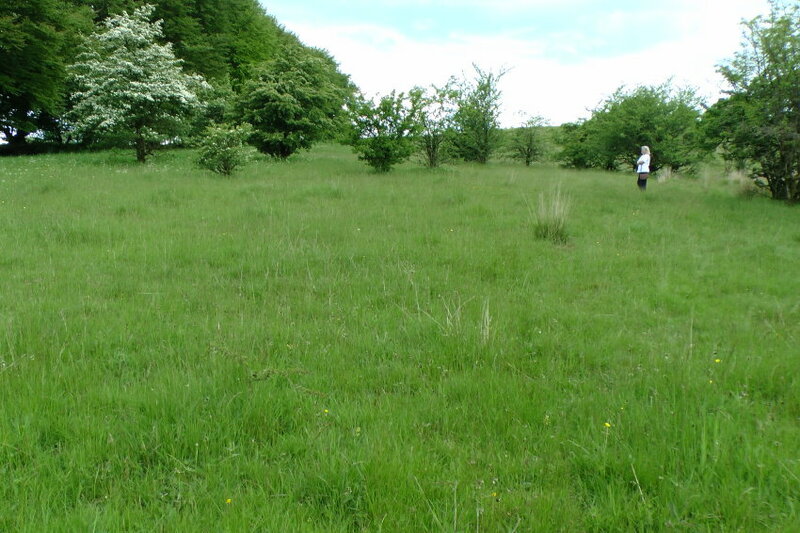 One of the last areas where we would like to create an impact at Gelli is indeed our native meadows. None have been ploughed for decades, or received any artificial fertiliser during our time at Gelli (as far as we know!) but certainly not for the last 7 years. Until we acquired our own sheep last year, we were limited by our ability to control grazing strategies. 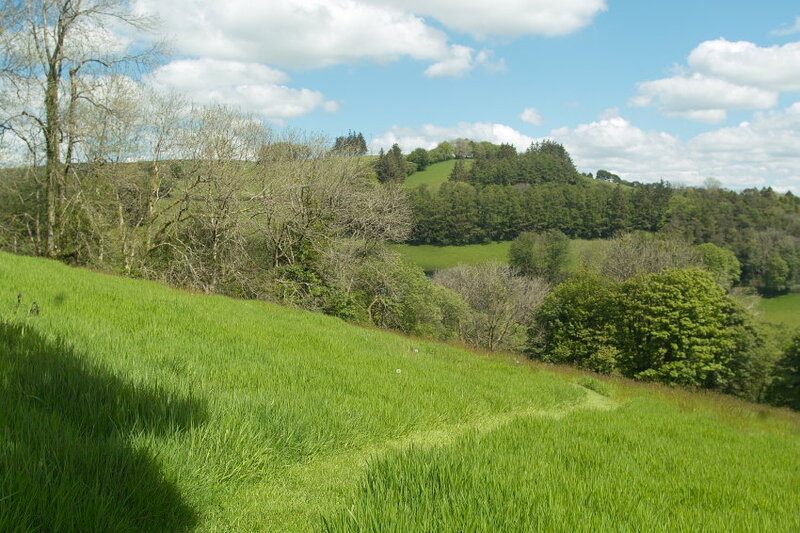 Starting with a just few sheep meant that last year our High Meadow was under-grazed, and although we manually removed a hay crop from perhaps 15% of the field, the majority of the pasture was left ungrazed until autumn. Our sheep then made very little impact on these lengthy areas over the winter and early spring. 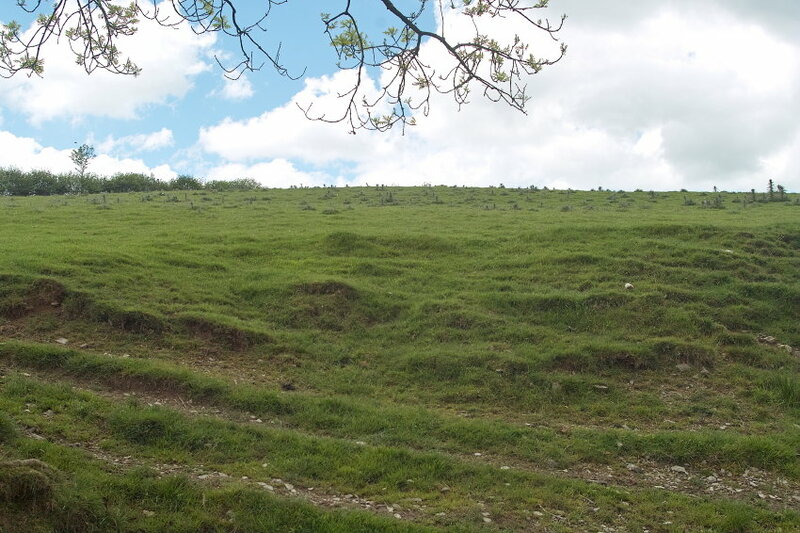 The result has been a fascinating patchwork of appearance by this summer – the areas cut for hay last year are already showing small numbers of Creeping and Meadow Buttercup, Sheep Sorrel, and Dandelions and restrained grass growth. 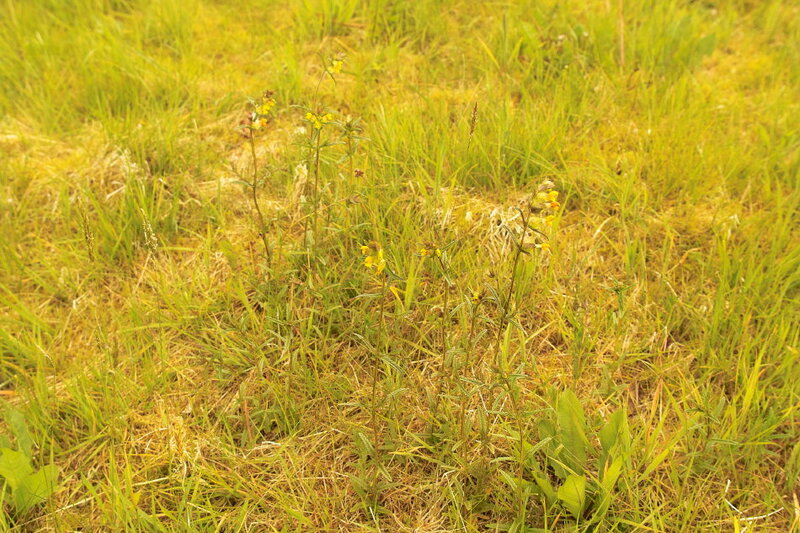 A very few Yellow Rattle plants have germinated in a couple of places from a few seed sown last autumn. 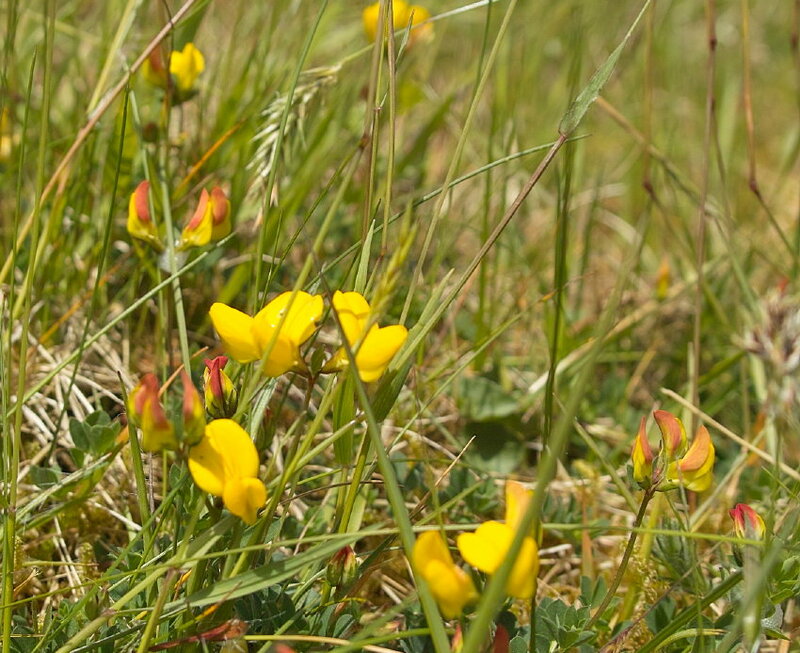 There are quite large patches where scattered seed of Birdsfoot Trefoil, Lotus corniculatus, sown just 2 years ago, seems to have already established in an almost monocultural slab, although with different flowering times throughout its population. And a few areas of Lesser Stitchwort, Germander Speedwell, Pink and White clovers and even the odd plant of Whorled Caraway, which I discovered is a nationally rare native, but has been selected as the county flower for Carmarthenshire. 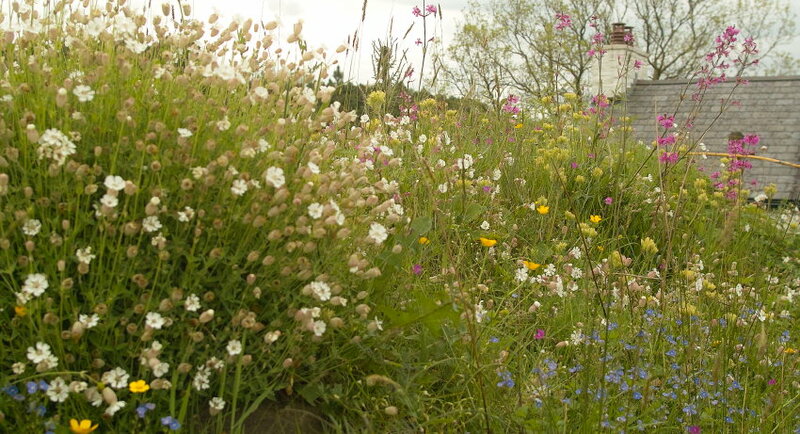 What has caused this huge variation in how this single, barely 1 acre, meadow looks this year? 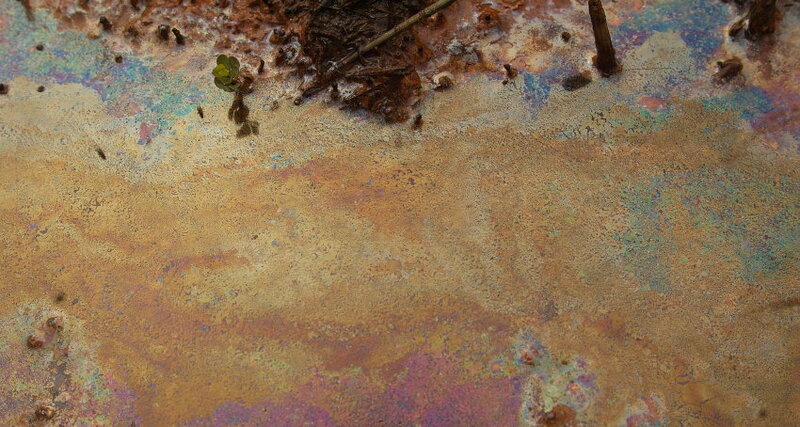 Is it the result of inorganic variations beneath the soil surface? 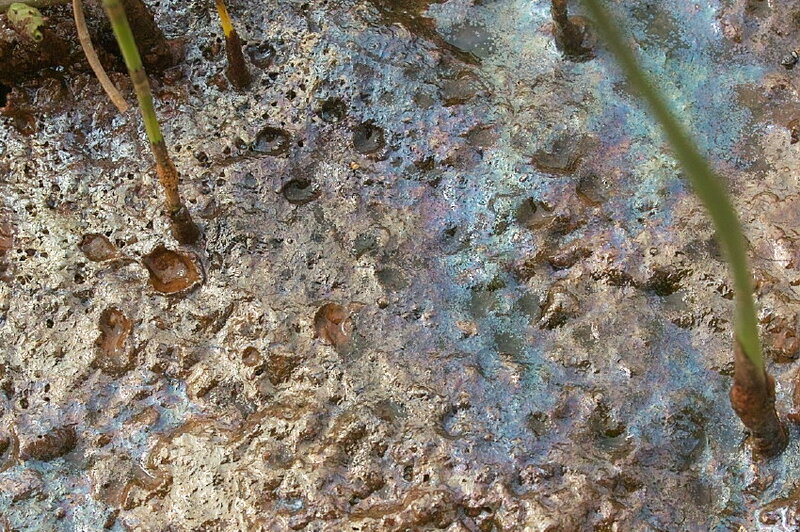 Or are invisible fungal networks or some other organic factors involved? 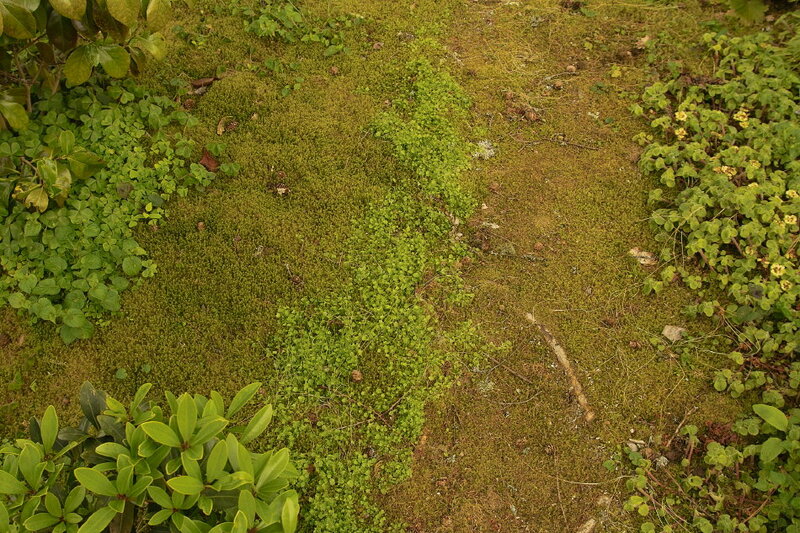 I’ve often wondered how several plants which we grow in the garden (particularly natives) will move in a drifting, and sometimes expanding ring, fashion away from their initial location which they vacate completely within just a few years? 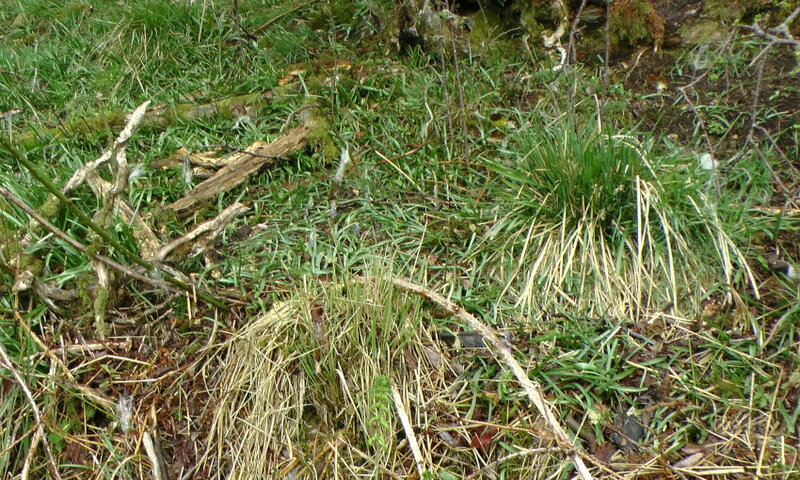 …(The central green band is of native Ivy-leaved Bellflower, Wahlenbergia hederacea, in our mossy copse, which has relocated from an original few scraps at the left margin of the image to this central strip. None remains in the original location. 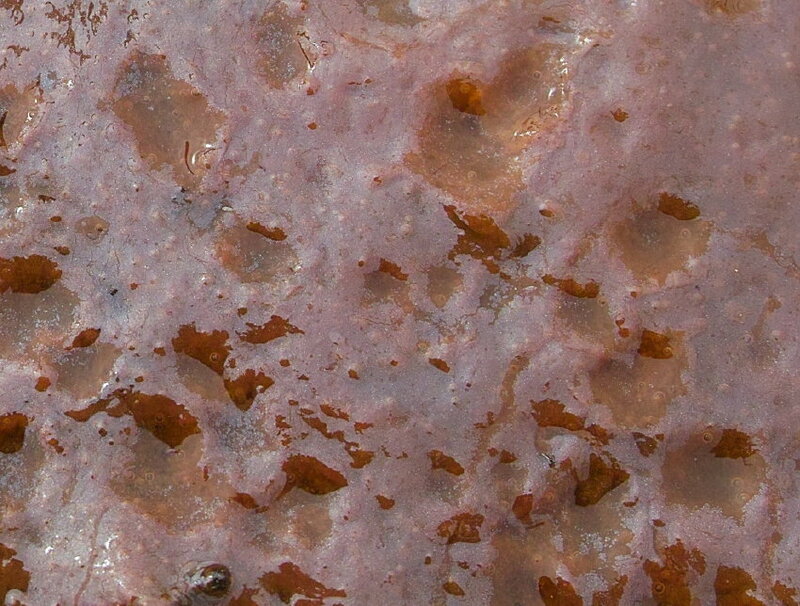 I fear that it will die out as it meets the slightly more vigorous non native Chrysoplenium davidianum, stage right). Are the same processes at work here? Expect it to take 10 years! Actually I reckon our recent lack of fertiliser use gives us a head start, and hope that 5 years will see a huge change. 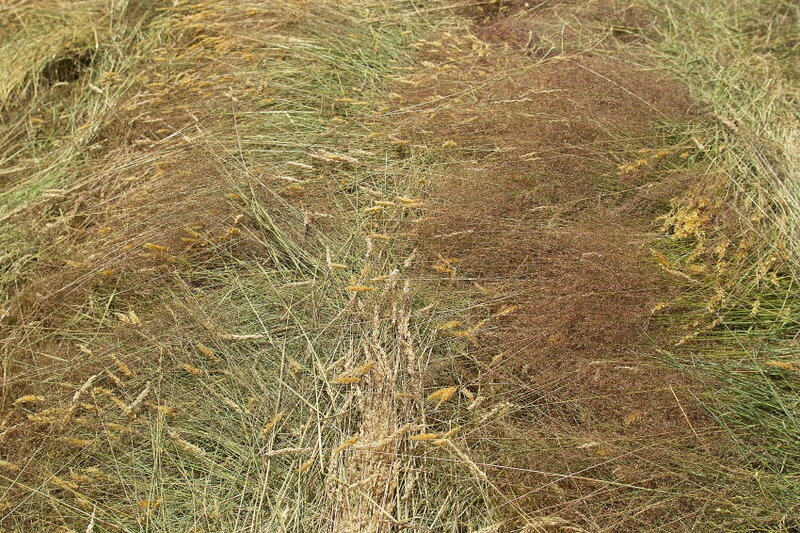 The weight of rattle seed sown in a finite area initially had a big effect on the number of rattle plants growing in the first 3 years, but by year 4, the natural seed production in situ had ironed out these differences. 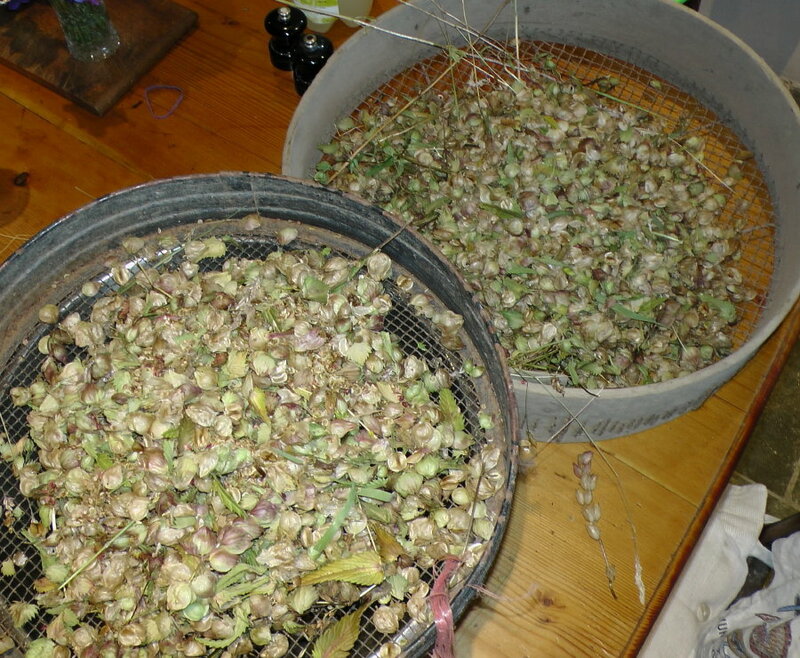 Fresh seed from this year’s harvest must be sown in the autumn, since it has poor long term viability and needs autumn chilling to germinate. 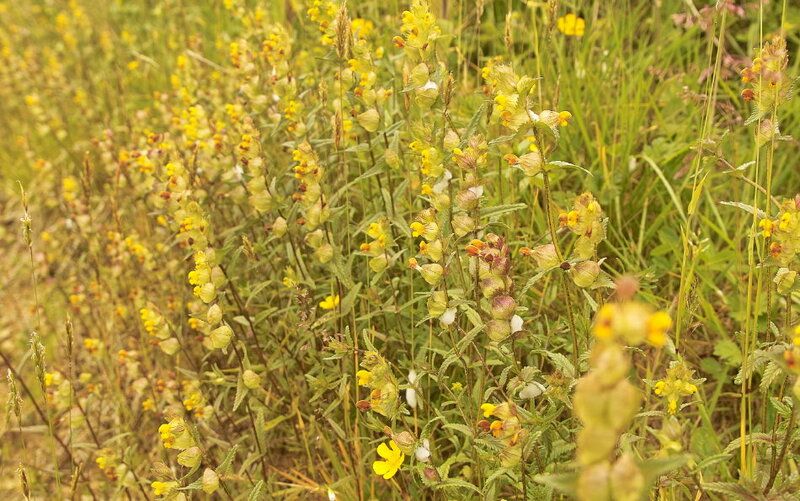 Until the Yellow rattle has started to weaken natural grass growth, sowing other flowers or ‘forbs’ is not likely to be very successful (although my Birdsfoot Trefoil experience seems to contradict this). Cutting for hay in late July seems to be the optimum time. 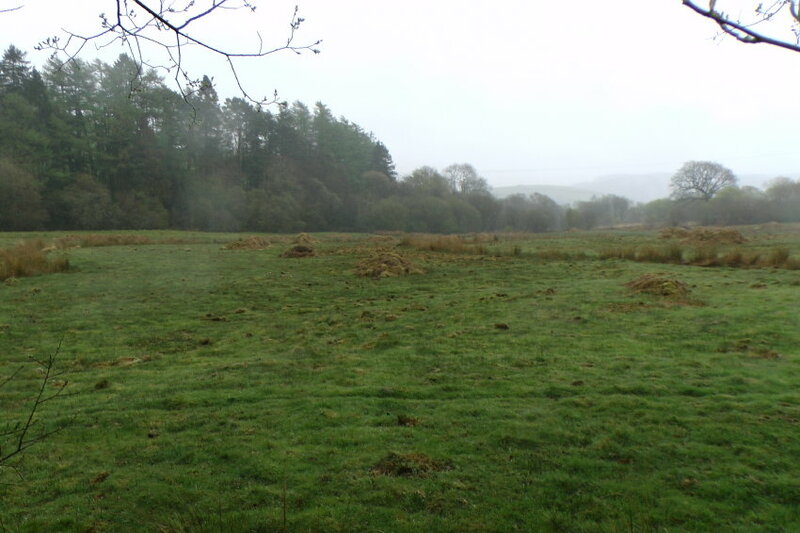 This is fortunately the usual ideal time in our upland meadows, (weather permitting) since growth is often slower earlier in the year than in lowland areas. 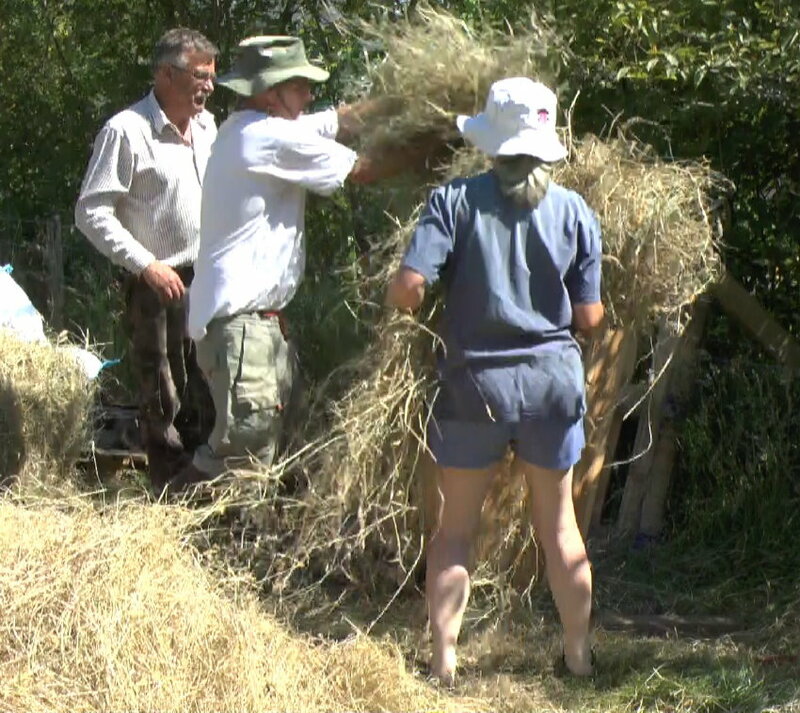 Normal hay making procedures will result in natural spreading of both Yellow Rattle and other forb seed around the pasture. 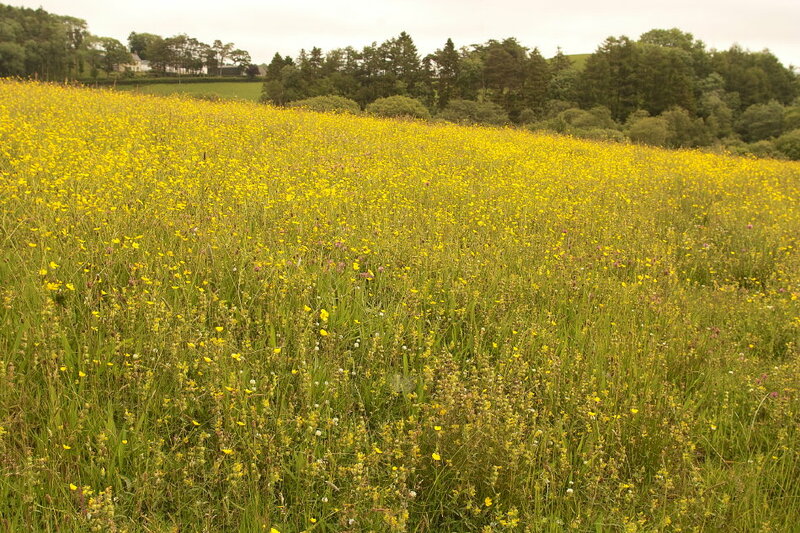 Of course the current trend for silage or haylage completely eliminates the opportunity for Yellow Rattle, and other meadow flowers to have flowered and seeded before being cut down, and is another reason for the lack of diversity in modern pasture fields. 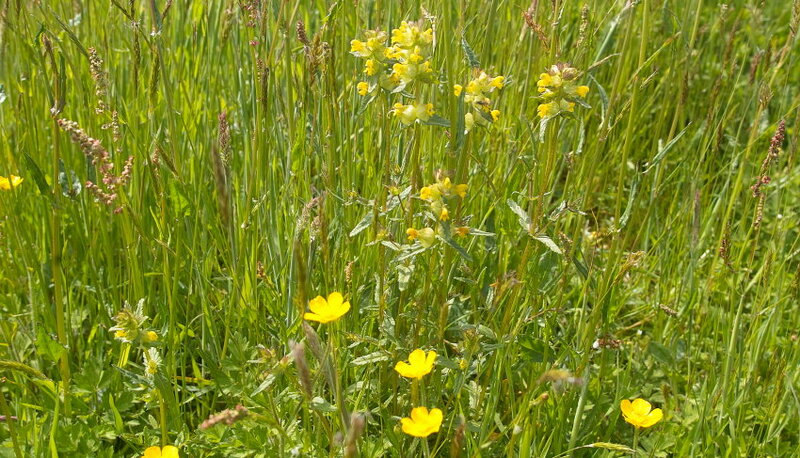 Short grazing of the pasture in late autumn and early spring is really important – this allows a short height of grass growth for when the annual Yellow Rattle has to germinate, and grow through other plants, and trampling by stock in the autumn helps to push seed into the ground. A short cut approach discussed in one of the papers above, would be to spray off all existing grass with glyphosate, but given our distrust of this omnipotent chemical, is not an option we’d consider. 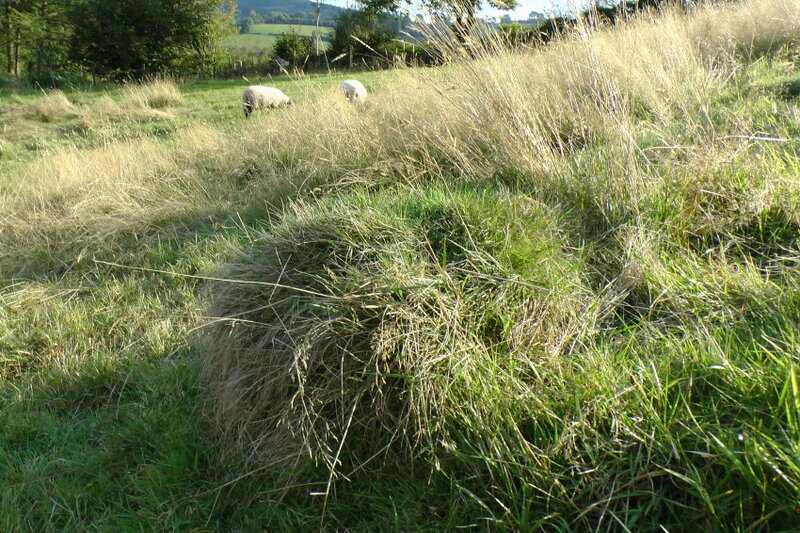 However I’m hopeful that some areas of the meadow where the previous year’s rank grass seems to have effectively killed off most of the permanent grass, simply by flopping onto it over winter, provides an opportunity to sow into terrain not dissimilar to a weed killed field, albeit with a healthy mossy soil covering. 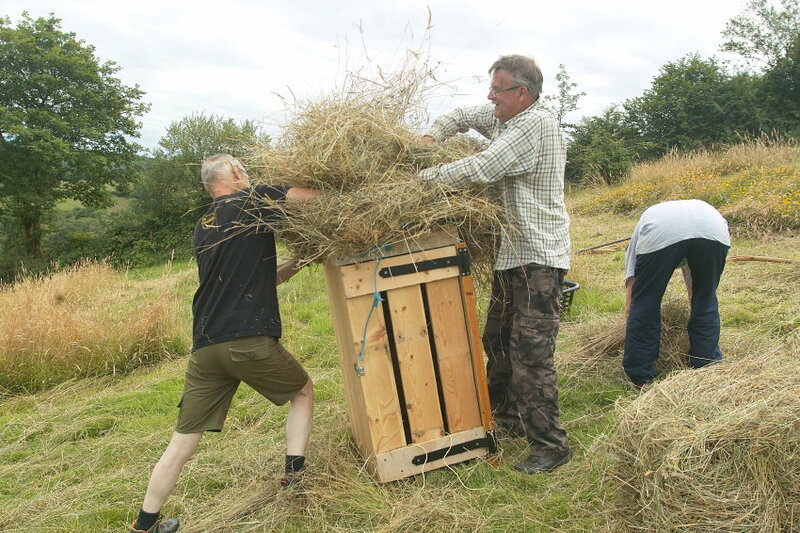 Shortly after my last post we’d began our tedious manual small scale hay making on our steeply sloping field by strimming off selected areas of our this hay/wild flower meadow. 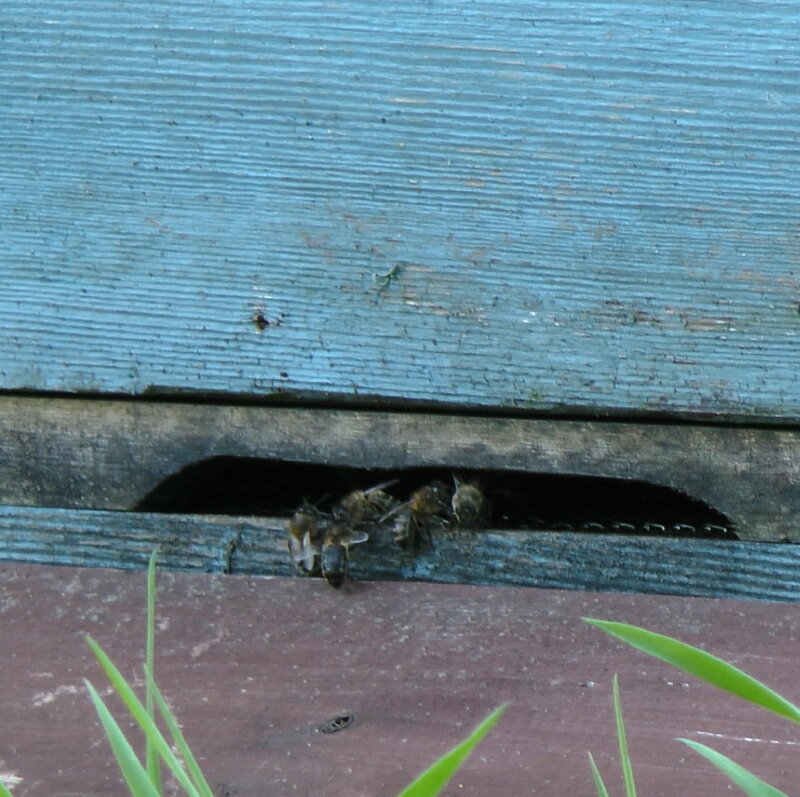 I reckoned strimming around the empty bee hive might be a good idea as well since the developing heatwave may have triggered a swarm nearby. 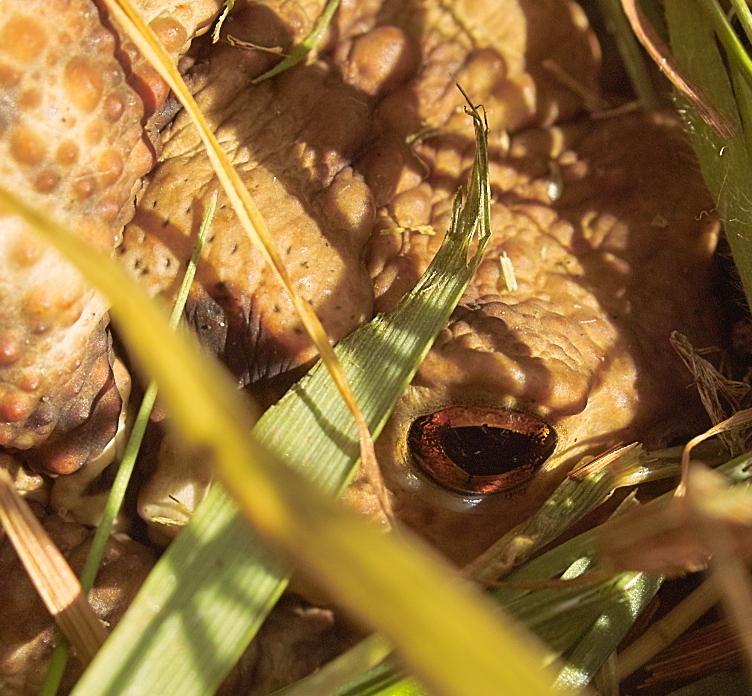 Indeed we’d both seen and heard a mini swarm fly overhead and down our track, a couple of days earlier. So 2 days later I got quite excited when Fiona noticed a few bees exploring the hive entrance at dusk… A day later and the numbers had increased, and another day saw tens of bees around the entrance in the mid day heat, which by now was regularly hitting the high ‘ 20’s degrees C… By dusk, activity seemed to have ceased, and keen to see whether anything was happening inside I carefully lifted the top super off the hive (after first pressing an ear to the flaky paint of the exterior for any sound of significant bee activity. None was detected)… To my surprise there were perhaps 50 or 60 bees pressed in between a couple of the combs. But this confirmed my suspicions that all this activity wasn’t real scouting for a new home, but simply exploiting and robbing the residual honey stores left by the previous, long deceased, inhabitants. A later visit from Andy, the bee keeper, confirmed this. 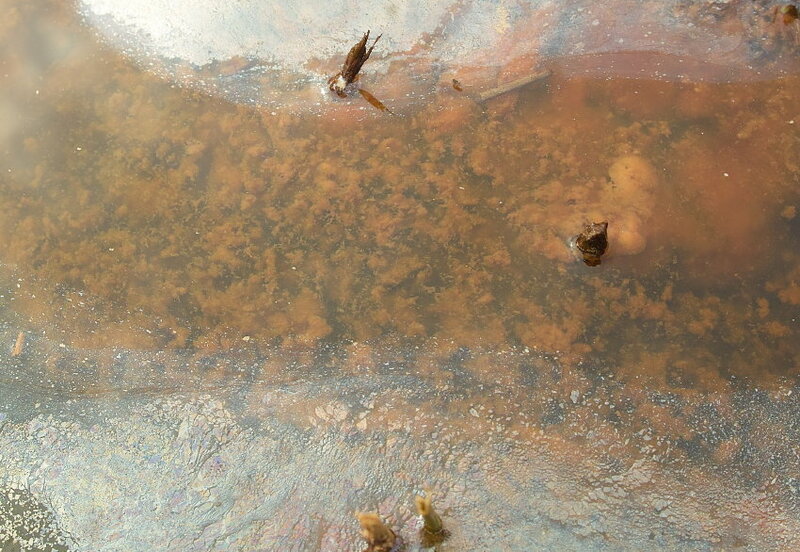 Within 2 days the honey had presumably been cleared and no more bees were seen around the hive. 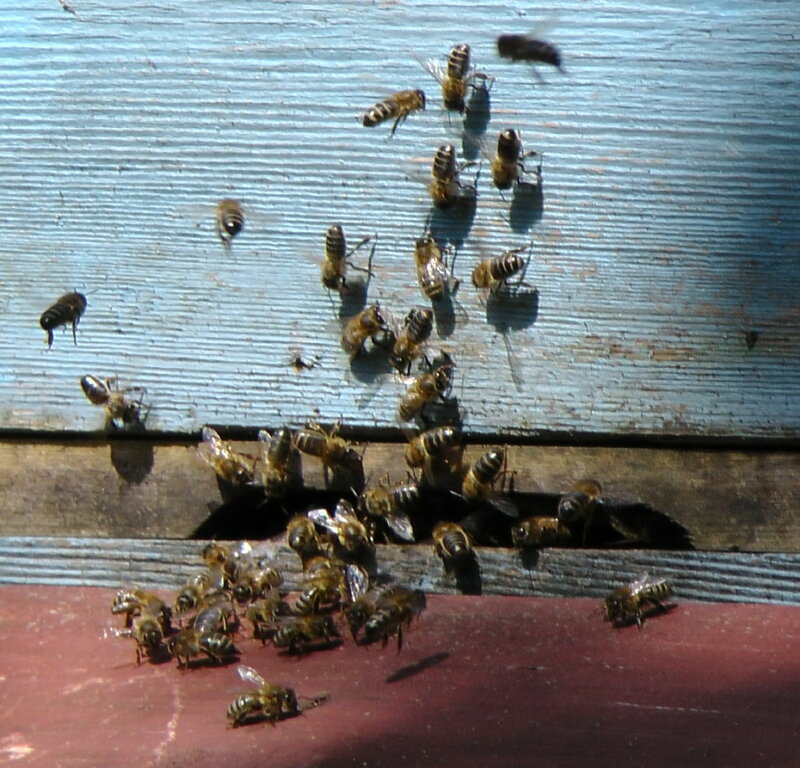 Of course I do wonder if bees are capable of sensing death in a hive like this, and perhaps giving it a wide berth as a potential new home? This would be a sensible adaptive trait, in view of the evident vulnerability of the hive’s current position during the unusual freeze drying Easterly winds of the previous spring. A Sauron like, divorced, suspended, fiery globe. Watching. Wide Open. 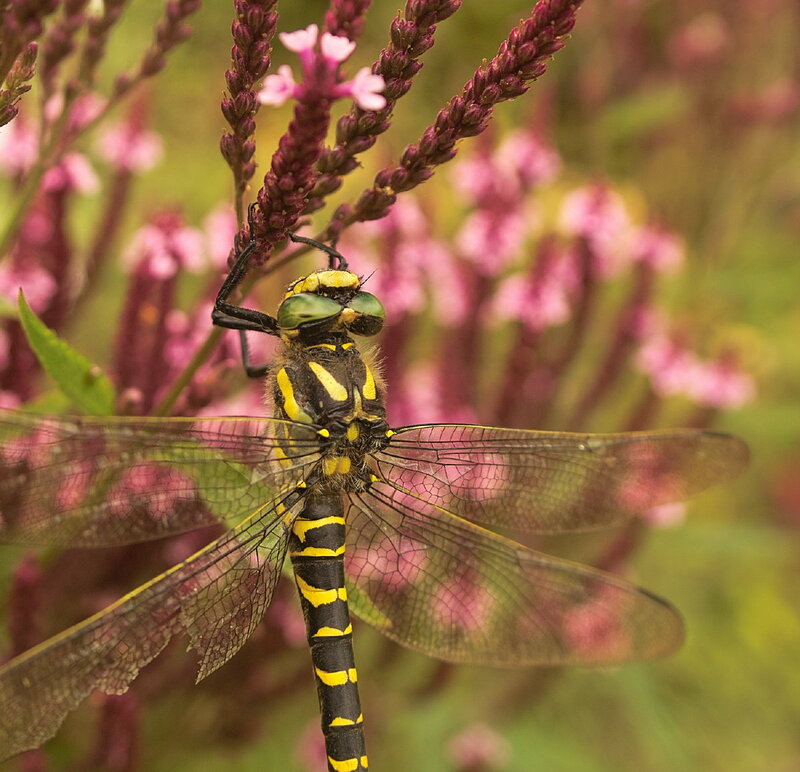 And just today in the tyre garden, an immobile Golden Ringed Dragonfly hanging out on the Verbena hastata flowers. … What was the predator? 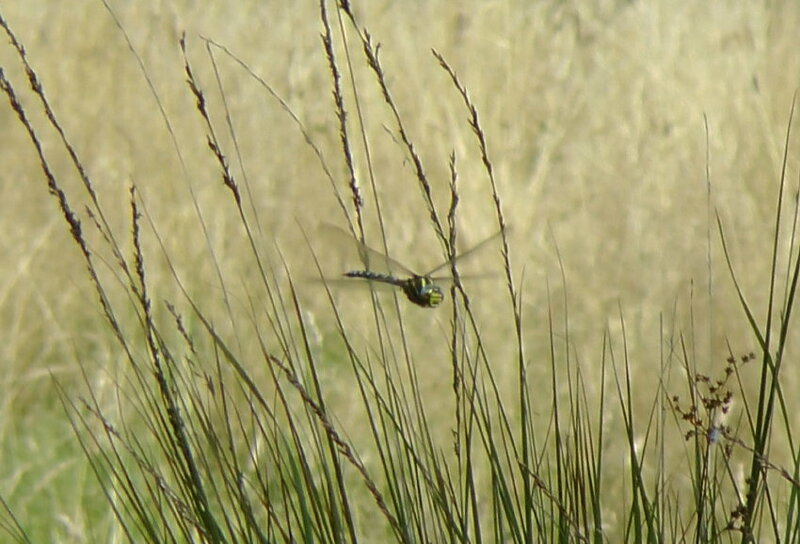 And did the likely dogfight exhaust the wounded Dragonfly, which was resting to recuperate? 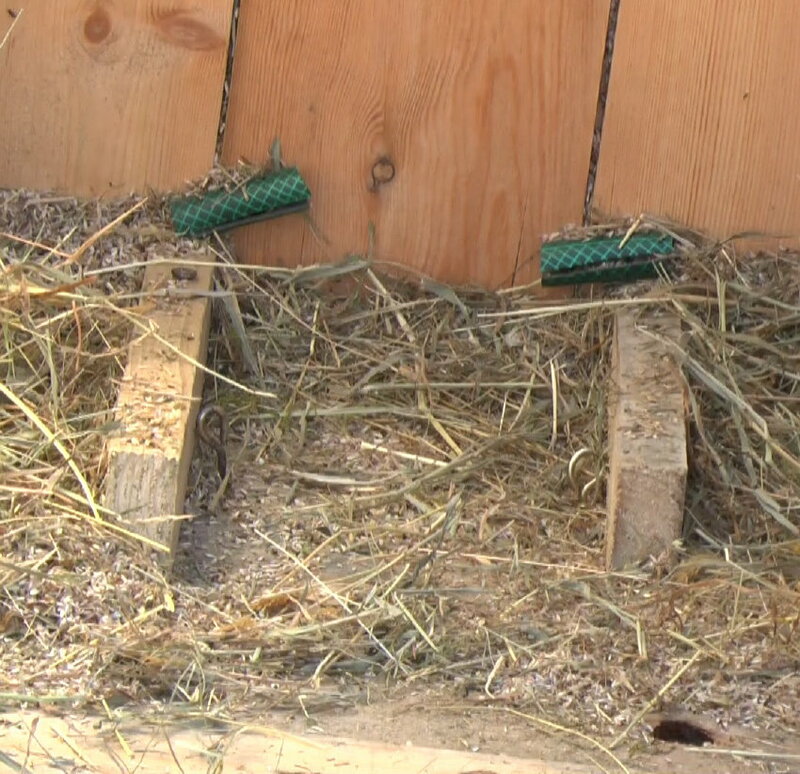 But this PDF document also explains how adult foxes can easily scale 6 foot fences or walls. Which brings me back to my own use of human male urine as a scent mark deterrent of both rabbits and foxes around the garden and poultry enclosures. 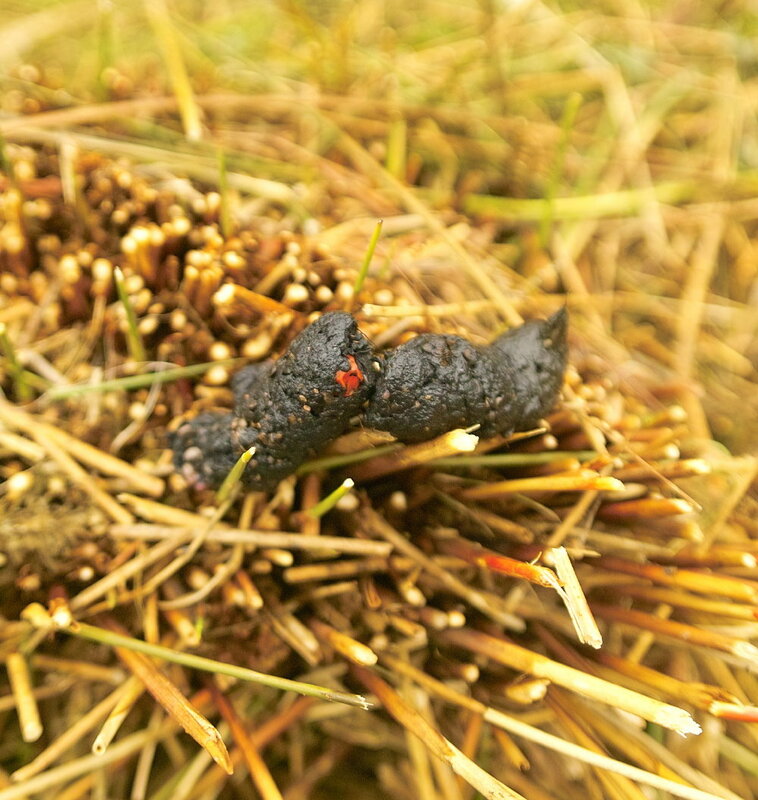 I’d had a spell where I was uncertain whether it was really working – at least as far as the rabbits were concerned – scrapes had been appearing again together with droppings on several of our mossy copse paths earlier in the spring. Then a penny dropped. (Sorry). 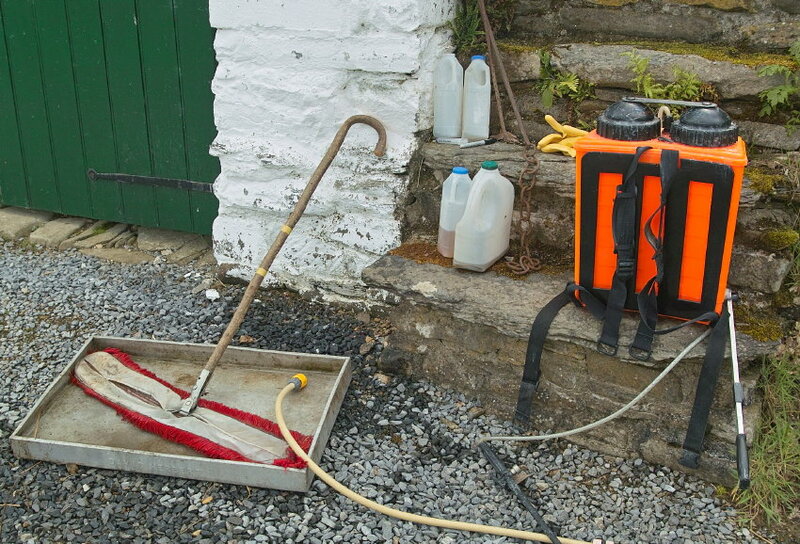 Having read that foxes have 12 different postures for depositing urine, with females just squatting, I figured that my pee should be directed from the watering can not just onto the ground, but higher up – as though deposited by a more dominant predator. 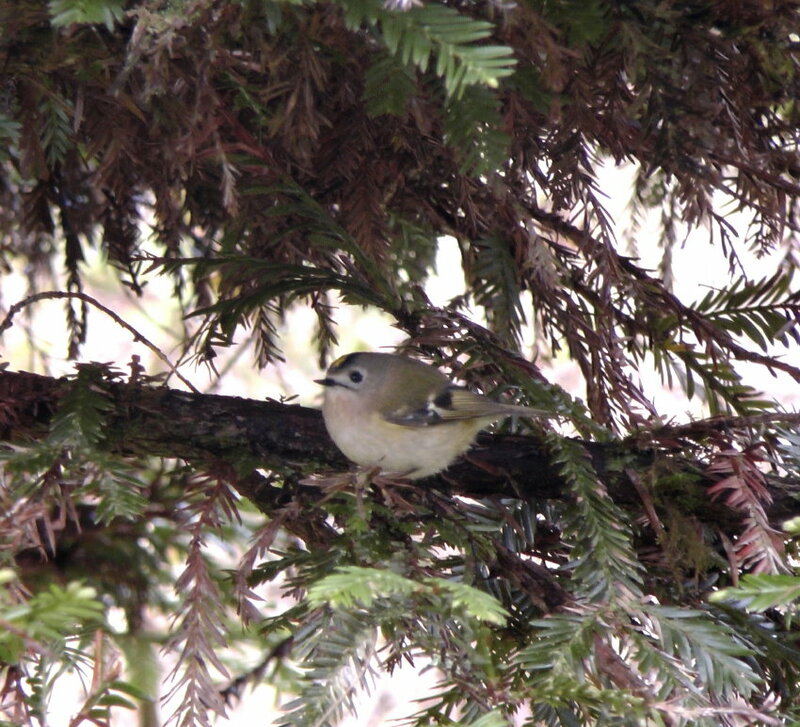 Moreover, if it was placed reasonably regularly and on the leeward sides of mature trees or fence posts, then it stood a much better chance of persisting in our wet climate. Since adopting this modified marking routine, at roughly weekly intervals in late spring, evidence of any rabbit activity in the garden had reduced to almost zero. Co incidence? 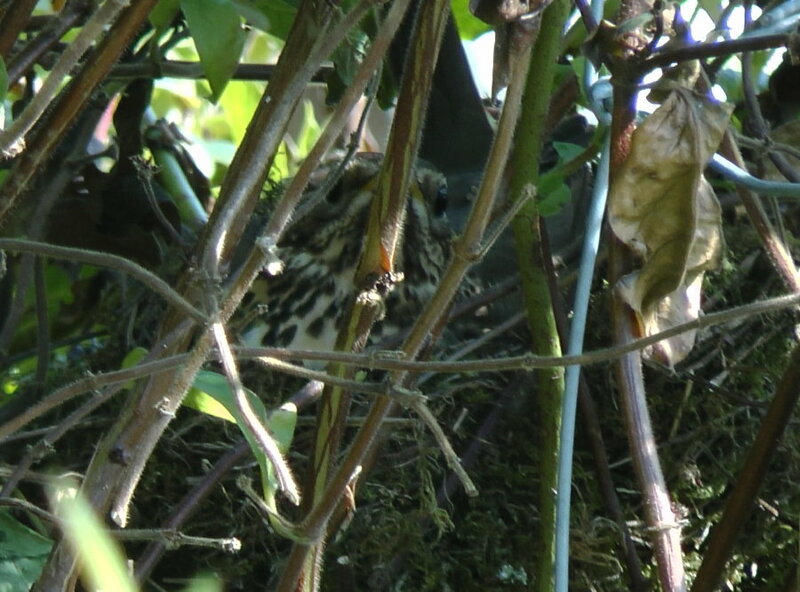 Well one can never be certain, but in spite of this apparent success at deterring these garden nuisances, a week ago just before dusk I came across a recently killed mature rabbit lying between 2 of our Rhododendron shrubs with the left side of its head missing, but otherwise a superficially unmarked carcase. Intrigued as to what had killed it, I was distracted by another garden finding, but remembered it a couple of hours later, just after dark, so thought I’d nip out and get an image for the blog. 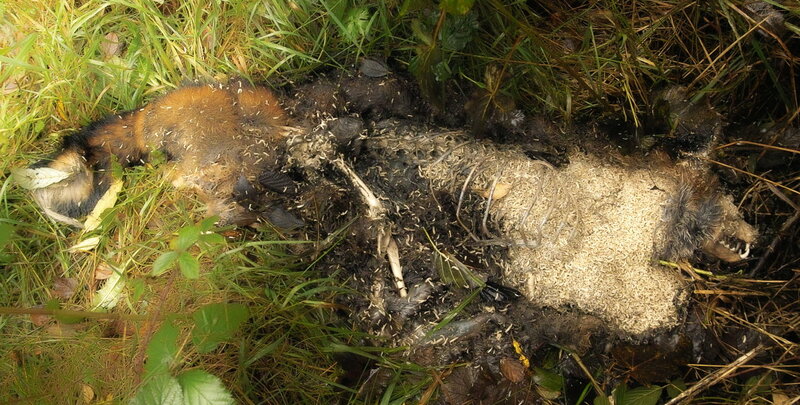 I didn’t even take a torch, since I knew where to find the body, and reckoned that the infra red pre flash and exposure light beam from the camera would be sufficient to focus the shot on the carcase. But the body had vanished! I couldn’t see any trace in the dim red glow. 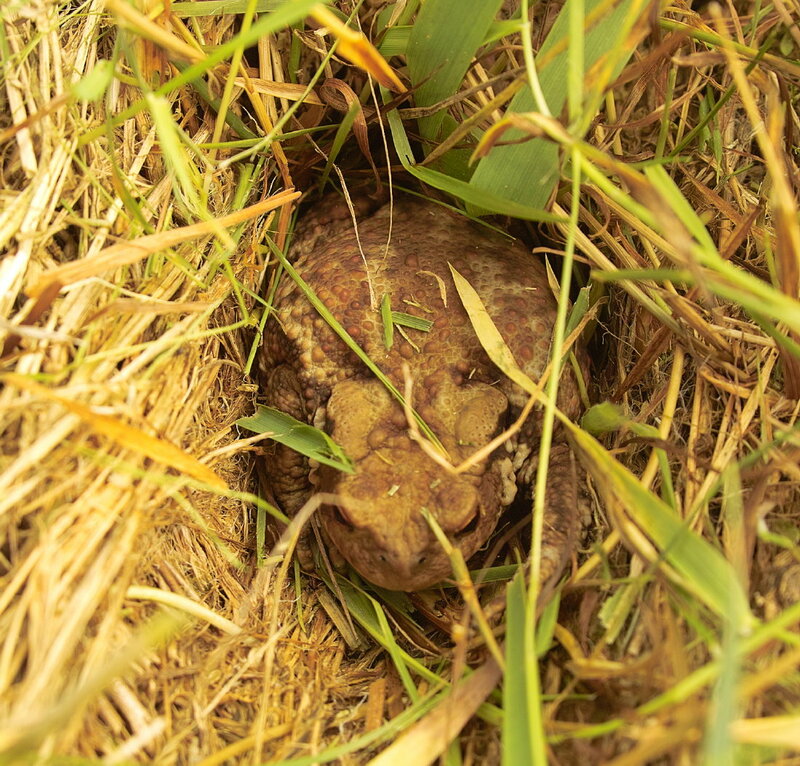 I returned with a torch to search for traces at the spot where the bodyhad been, and then realised that it was still there, but had been covered with leaves and debris, and by now most of its head had been eaten… But what could have been responsible? A fox? 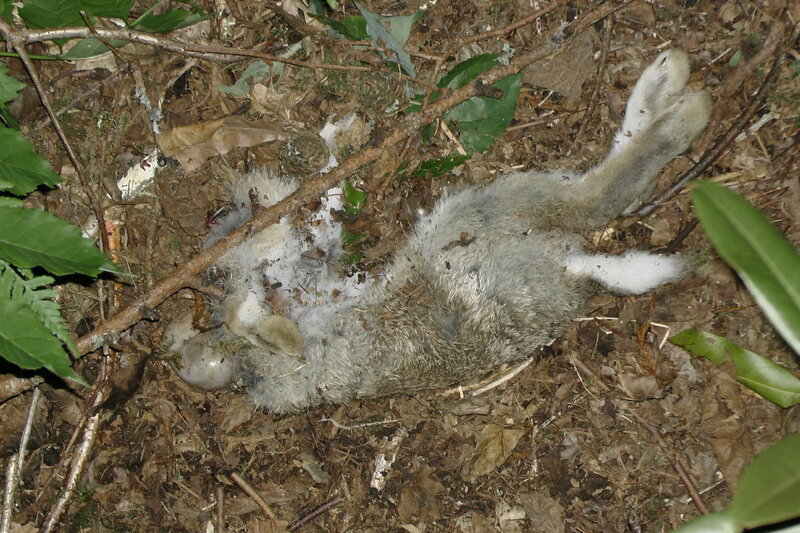 I then found a great on line guide to ‘Livestock and Animal Predation Identification’. You can click here for the full link, which covers foxes, badgers, weasels, and many other potential British predators, but being of North American origin, also includes Bobcats, Lynx and Mountain Lions. (There is a record here of a single mountain lion having been documented as killing 192 ewes in a single night, so I’m glad that we don’t have any of those around!) 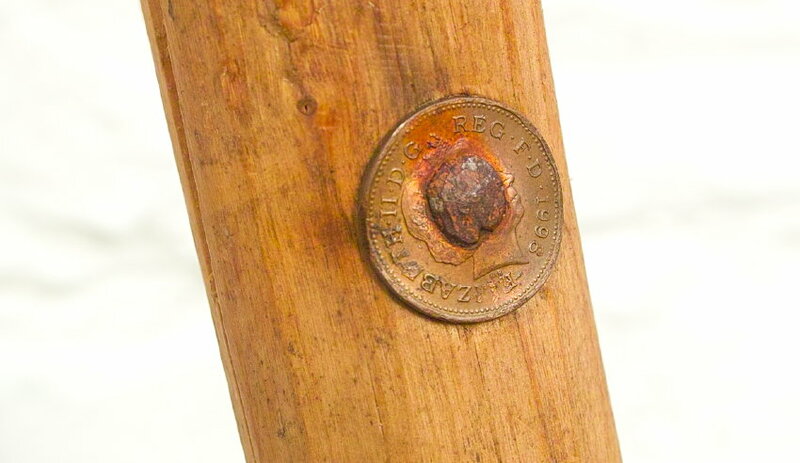 There are some really sensible guidelines about what signs to look for around the carcase – where wounds are, what has been consumed, teeth marks and sizes, or scratch wounds, etc. all of which I’d missed doing until it was too late, i.e. 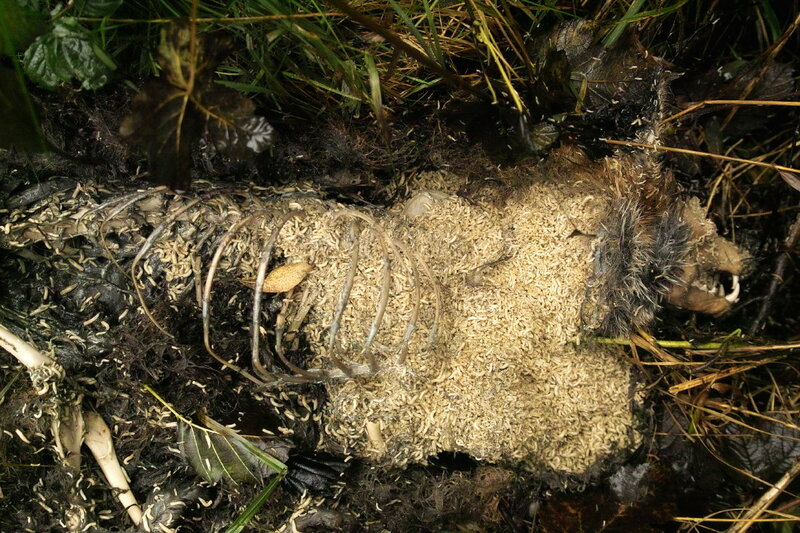 the body had disappeared completely. 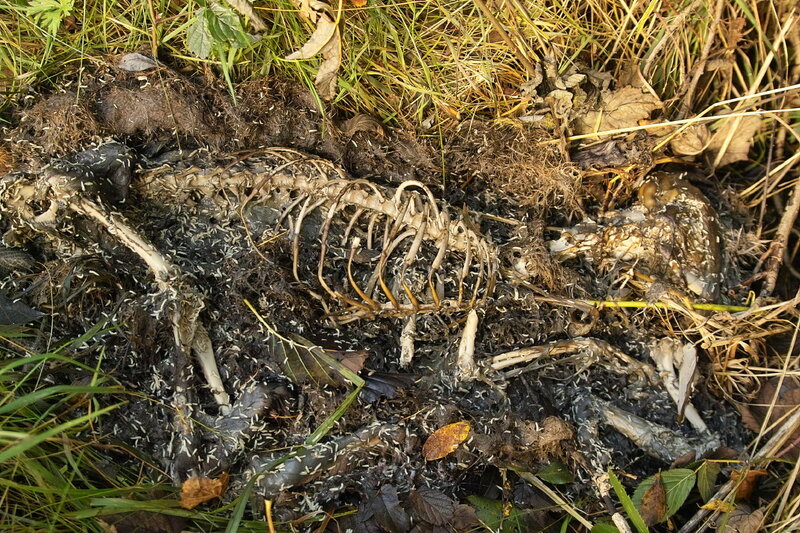 But the covering of the carcase with leaves gets mentioned in the section on Bobcats and Lynx, though isn’t included in the section on domestic cat predation. 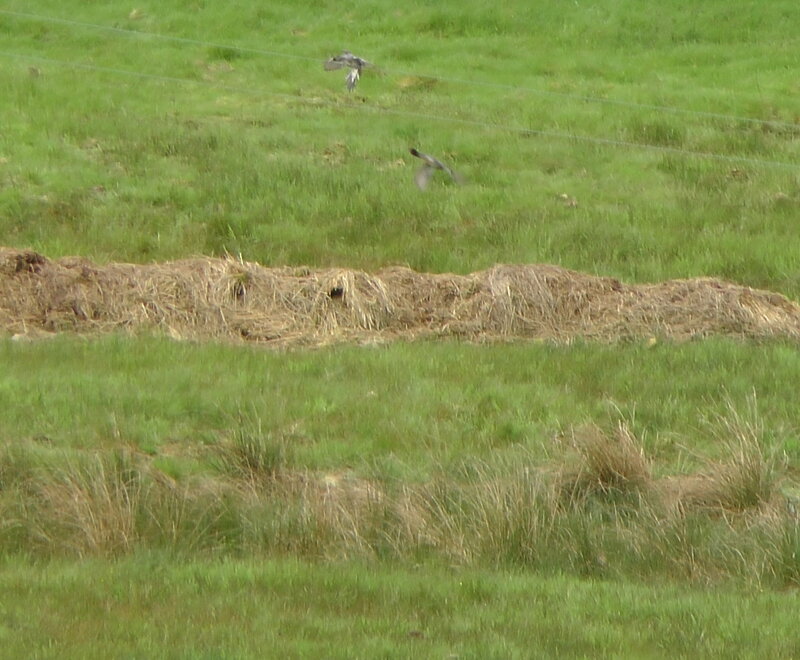 The ‘cat’ will then return to the site later for a further meal from its kill. 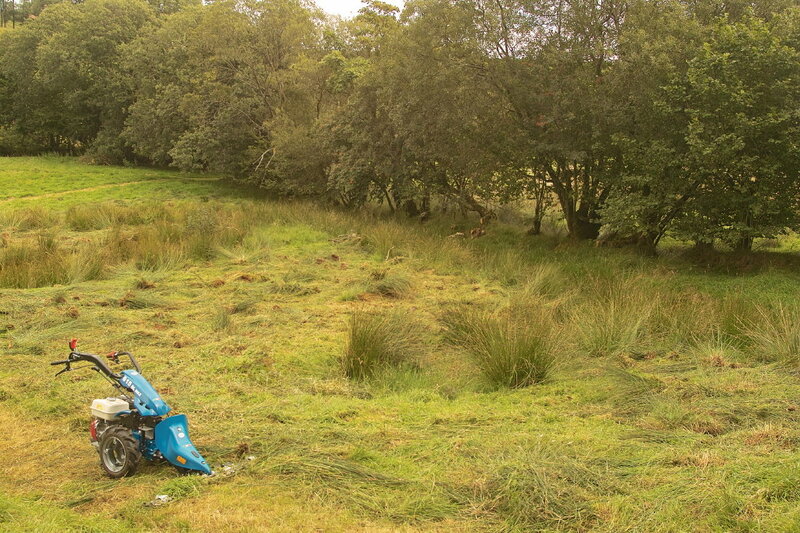 Almost every day for the last 6 weeks has seen us both on rush clearing duties in our lower meadows. 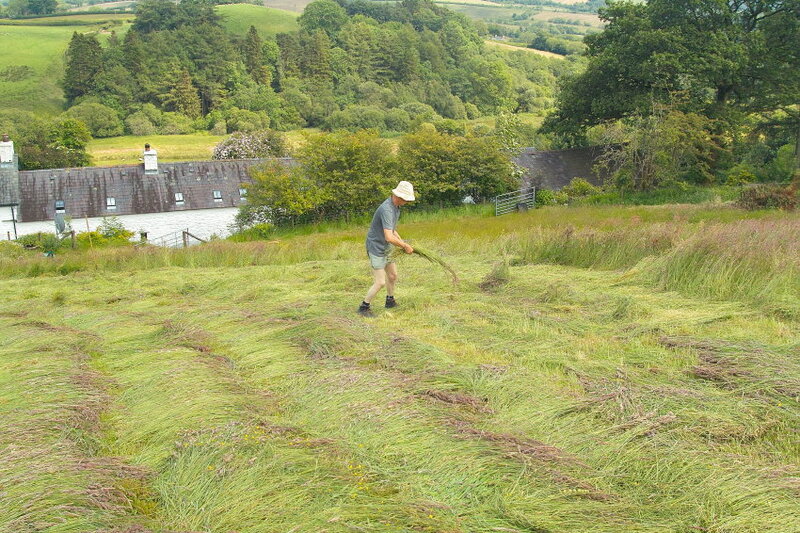 The prolonged drier weather this year enabled me to cut almost all of the meadow. 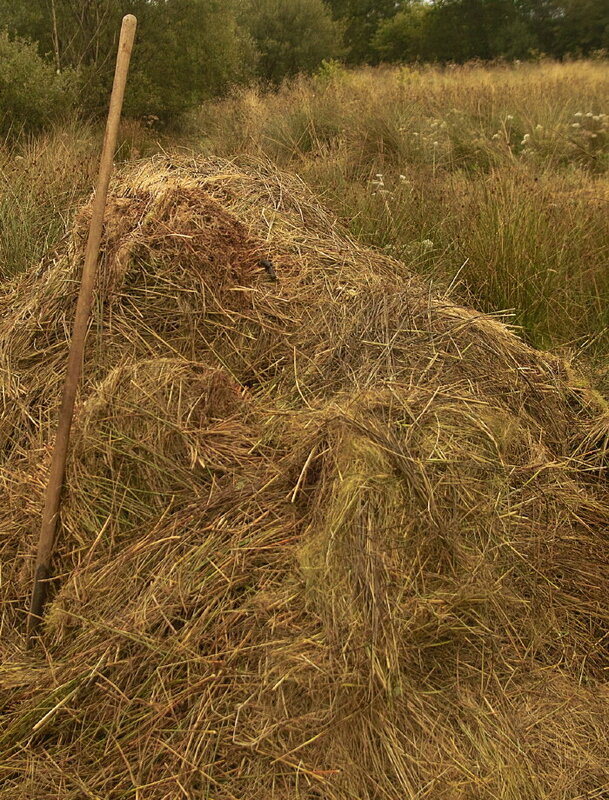 Clearing what will inevitably be just the first cut of rushes has taken much longer. But this pitchforking turns out to be very healthy all over body exercise, and has had the added benefit of getting us both down into the field earlier in the day than we’d normally manage. And so on a couple of occasions I’ve caught sight of a fox exploring to the North of our Upper field. 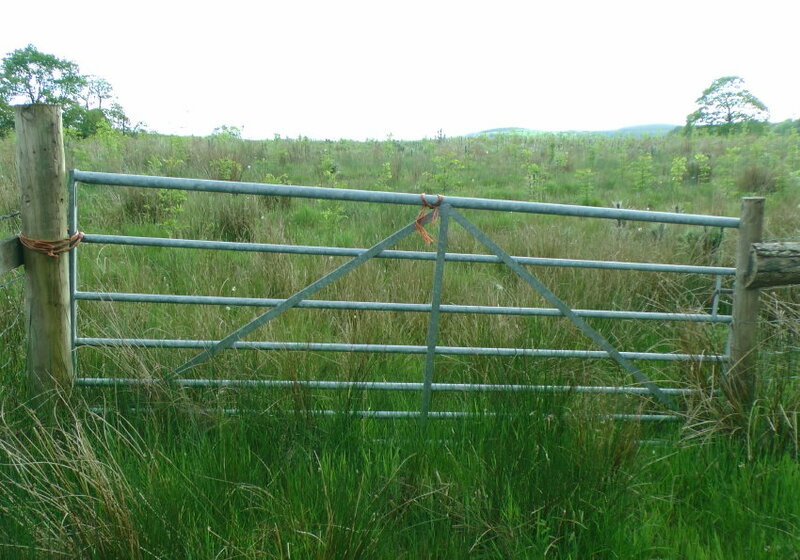 I’m guessing that I was downwind at the time, and it didn’t hear the distinctive sound of the metal gate’s latch being worked as I arrived on site. Both mornings were clear and bright, and one couldn’t help but be impressed by the richness of its distinctive brown/rust black pelt. 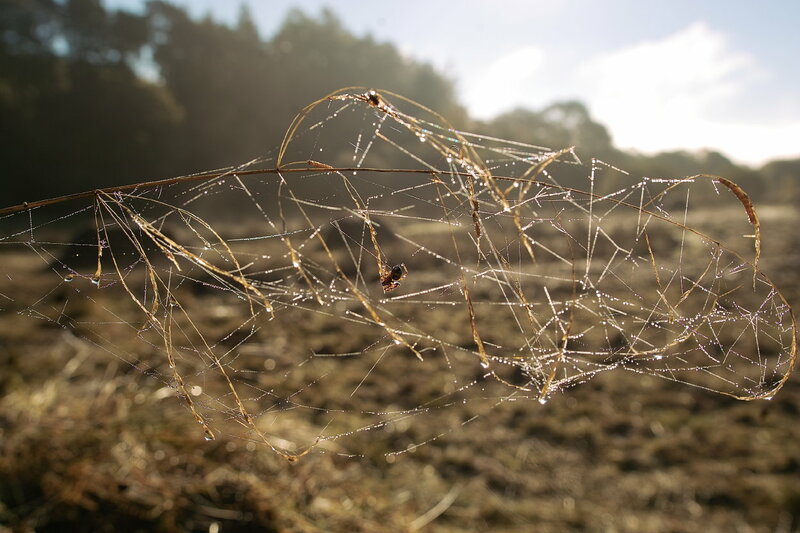 But I didn’t have my camera to hand and so instead share an image of a wonderful spider’s web net created around a single Stipa stem overhanging from the top of one of the many rush piles which now snake across the fields, like some giant reptilian form. 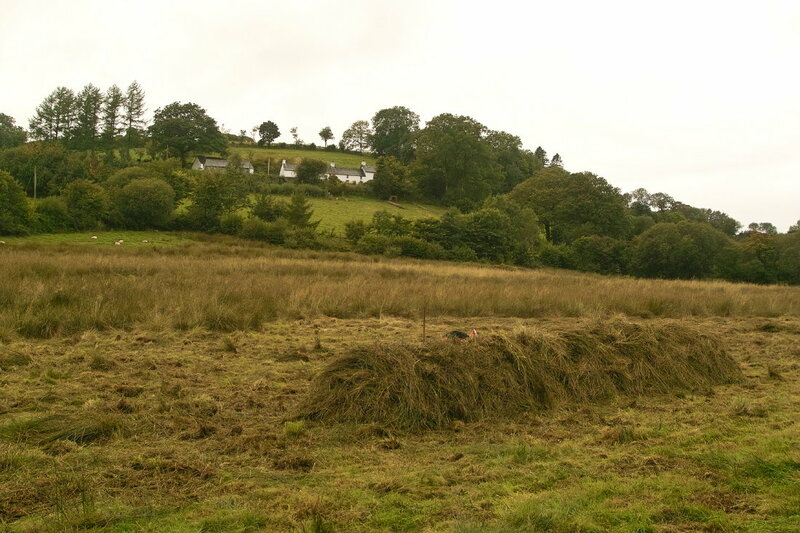 As the first rain of over 2 weeks arrived I’d just managed to complete another topping of the rushes in our 2 lower fields, in a fraction of the time it took us last autumn. Already they are looking more like meadows than rush forests, but such continued effort behind the BCS power scythe has left the body pummelled and in need of some therapeutic keyboard recuperation… … The cleared fields and a powerful LED torch meant that the other night I shone the beam from our Magic Terrace garden into the lower (then sheep-less) field to be met with 2 pairs of reflective eyes following my moves. Worried about lamb predation by foxes, I moved down into this field, and the ever watchful eyes backed off, before slinking out of the field to the South. Just as well, since our twin lambs had chosen this moment to escape the watchful protection of mum and get themselves stuck between the double fencing of the hedge boundary. With so much to look at in the garden over the last fortnight, why devote most of an overdue post to meadow management thoughts? 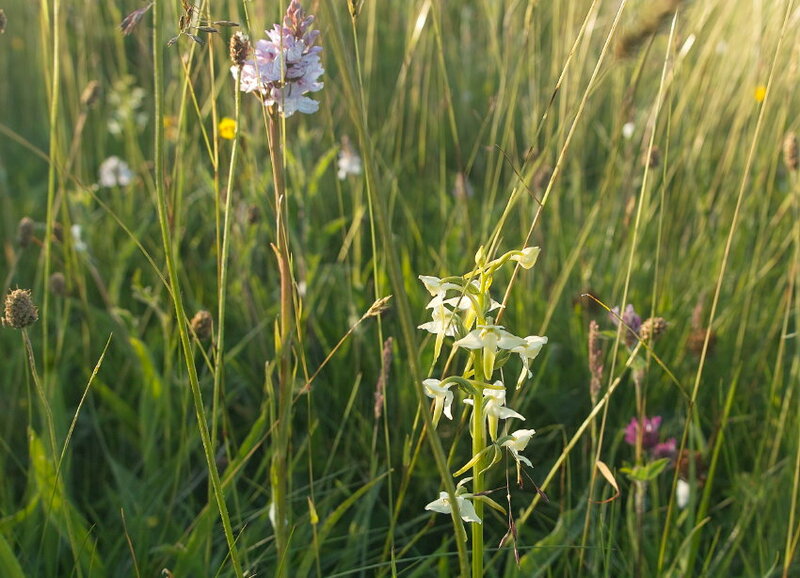 Simply because it’s difficult to rival the beauty and diversity of a traditional hay meadow, and they’re increasingly rare habitats both nationally and globally. 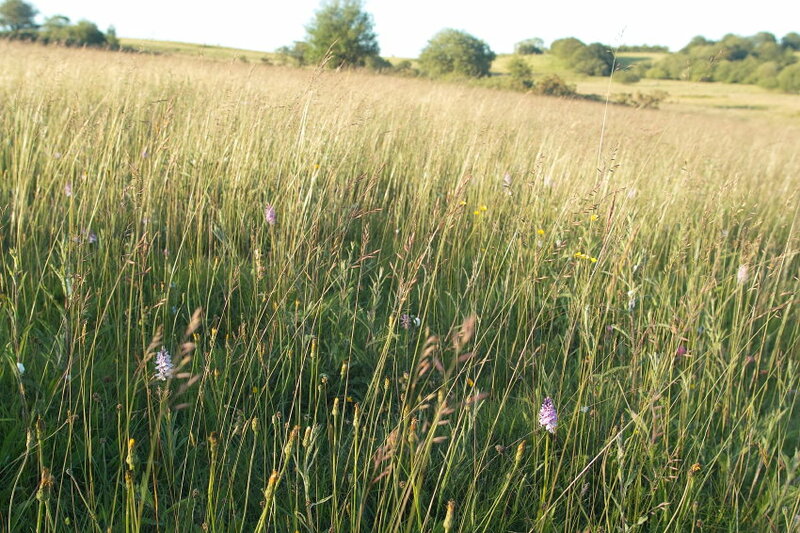 If you read this outside the UK, do let me know whether your country still has any of this type of managed grassland with flowers. 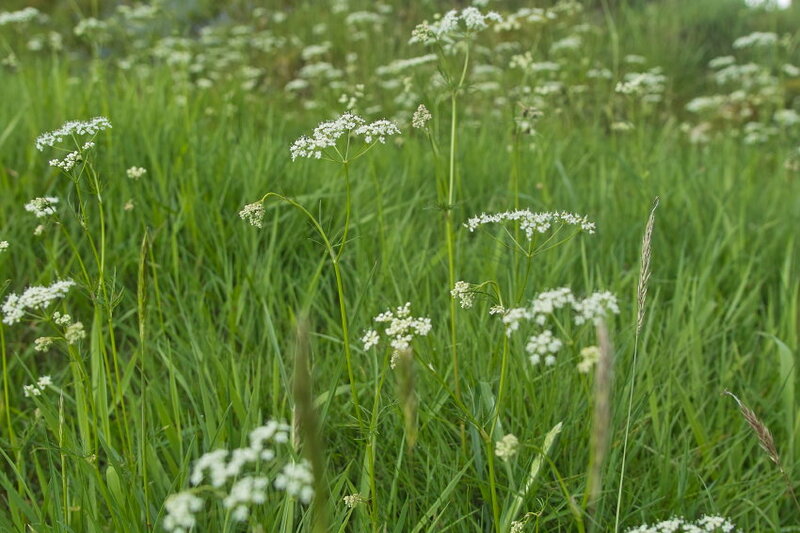 It’s tempting to think that they’re a marvel of nature, and in a way they are, but more specifically their very distinctive flora depends upon the long term interaction between man and larger grazing animals providing just the right growing conditions for a diverse range of grasses and other flowering plants to blend together. 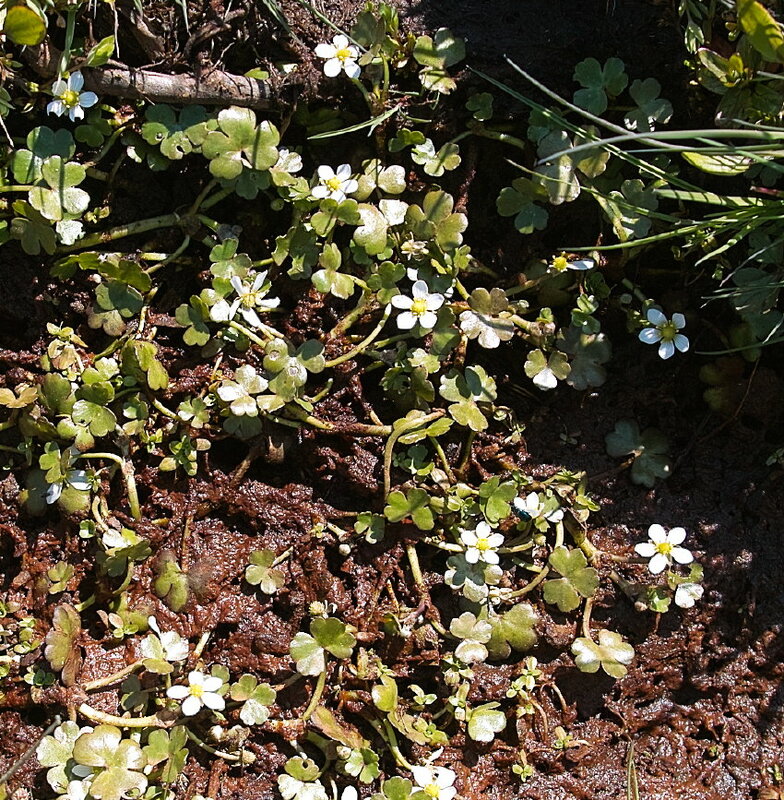 As I started writing this morning, I’ve just received a post from Christine at Croft Garden on the natural delights of machair, which is a variant of this concept found in coastal areas – particularly North West Scotland. 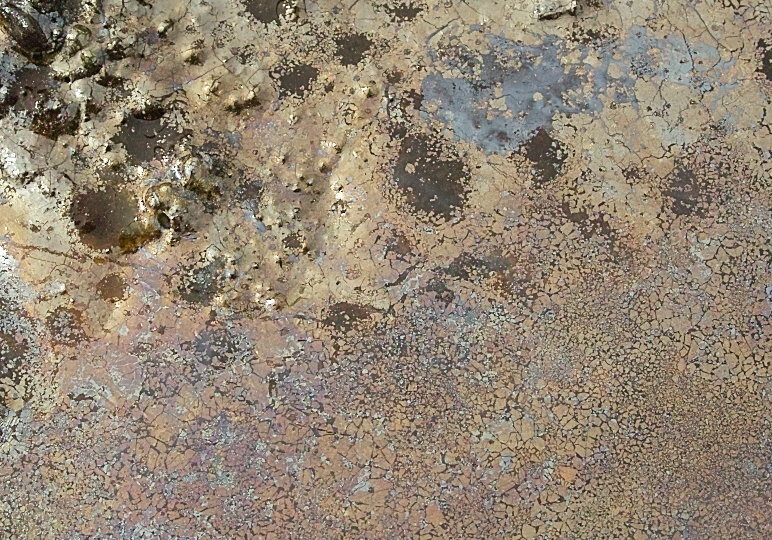 Click here for the link to this wonderful piece. But before this I’d recently read of the centuries old traditions of hay meadows and their management in the Transylvania region of Romania. There is a beautiful evocative article from The National Geographic (by presumably the same Adam Nicolson who was brought up by Vita Sackville West and father Nigel Nicolson at the iconic Sissinghurst garden in East Sussex, and is married to British wildflower champion Sarah Raven) which you can read by clicking here. 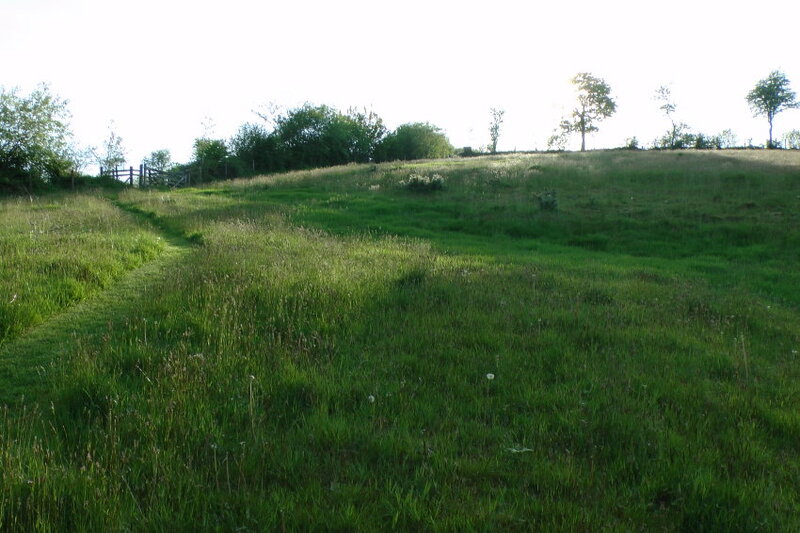 This confirms the point that without annual mowing, and removal of a hay crop after many of the flowering plants have set and dropped seed, combined with appropriate grazing, the meadows are quickly colonised by shrubby species and revert to the dominant natural plant populations of scrub and then forest within a handful of years. 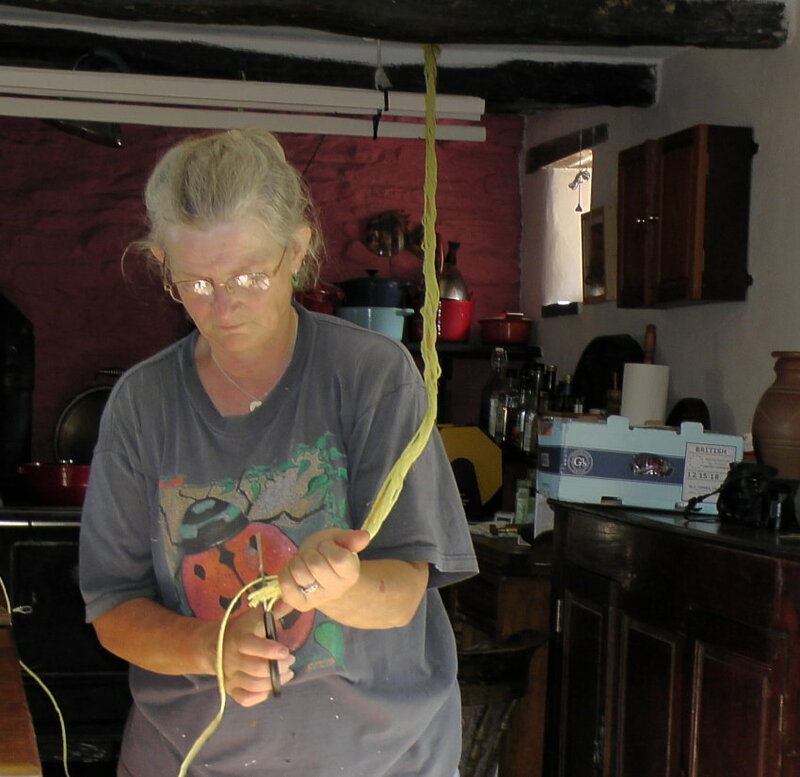 What particularly struck me about this piece was the simple, frugal existence of these, by hand, hay making Romainian small holders (most with no more than a few acres of land). 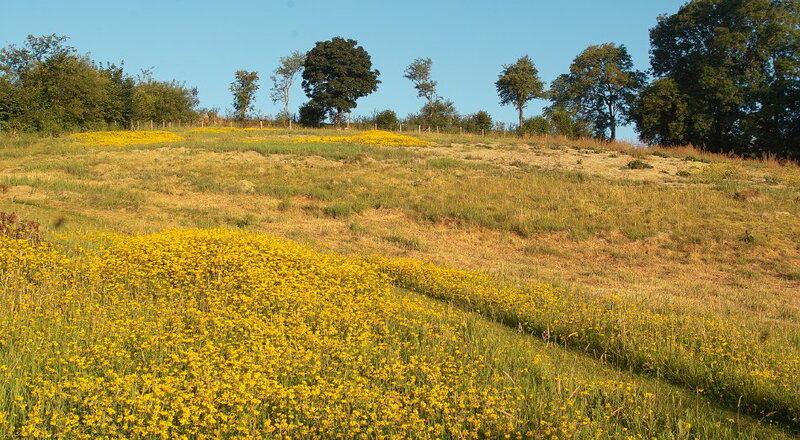 And also the awareness, knowledge and appreciation that they possess of the plant diversity in these upland meadows. 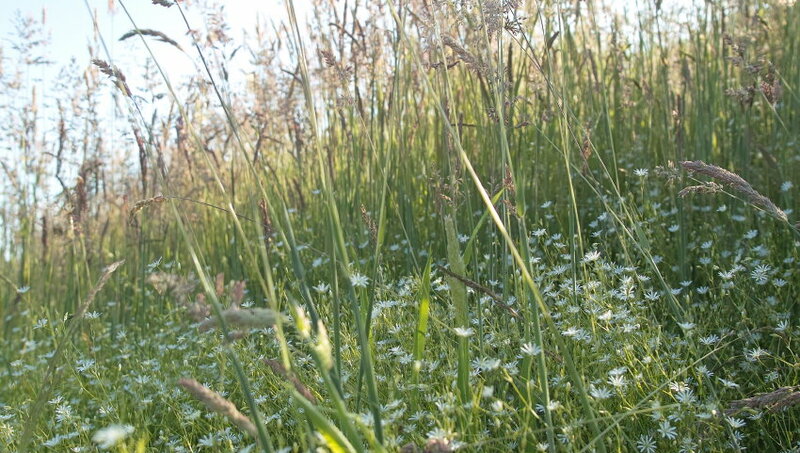 Apparently even young children can identify about 50 per cent of the nearly 150 different flower species in a typical meadow. 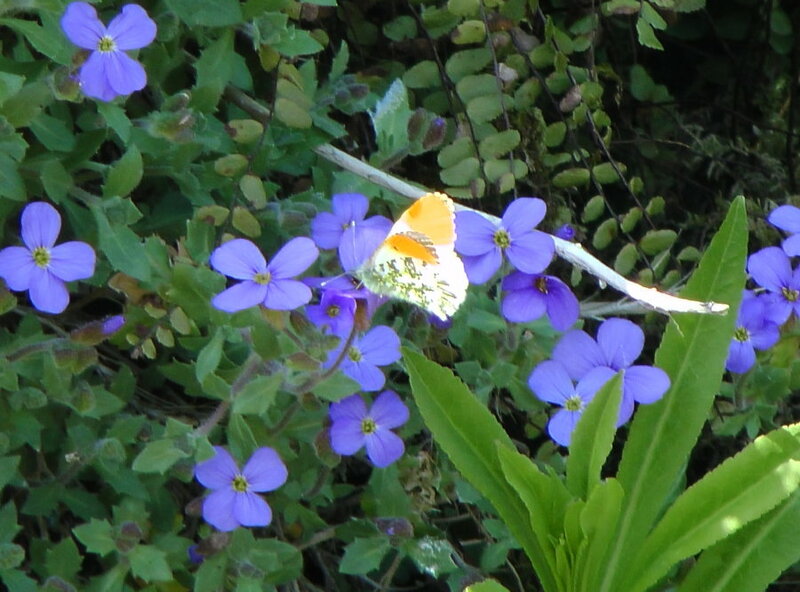 Try asking the typical Brit, young or old, to identify 10 common wildflowers, and I bet the success rate would be in single percentage figures. Does this matter? This recent human disconnect from the beauty and benefits of our native flora. Can you identify the flower below? And just now our biggest realised mistake was to allow some of the taller Geranium cultivars (unlike the short one above) in the impoverished rocky substrate of our man made Magic Terrace garden. They are simply too tall and early into vigorous growth thus swamping their shorter companions. So right now, Fiona has with huge effort been ripping them out, and we shall use the more benign Erodium manescavii as a more refined and less invasive alternative. 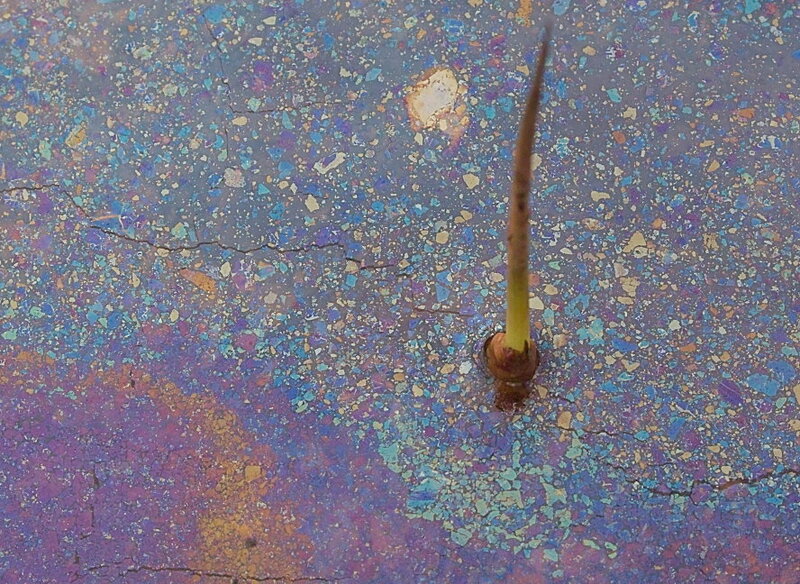 At last I’ve raised enough seedlings as replacements. The Transylvanian hay meadow flower diversity supports, not surprisingly, a hugely vibrant and diverse insect and higher animal fauna, and in large part it still exists because the terrain is too steep for reseeding and a mistrust from the farmers (and the cost) of artificial fertilisers means that many meadows have developed their own ‘natural’ floral patina over centuries of such literally hands on management, using heirloom simple wooden tools to gently shift the hay around after manual scything. 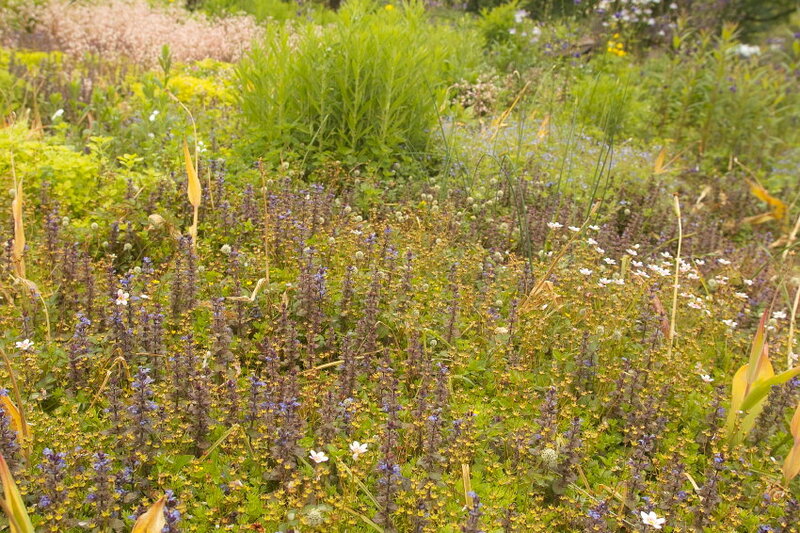 Our own future King, HRH Prince Charles, has created a little section of Transylvanian type meadow at his Highgrove garden, (click here), and is keen to help support this fragile habitat, currently under threat as the appeal of such ‘primitive and impoverished’ rural living in an increasingly progressive Romania wanes amongst the younger generation. 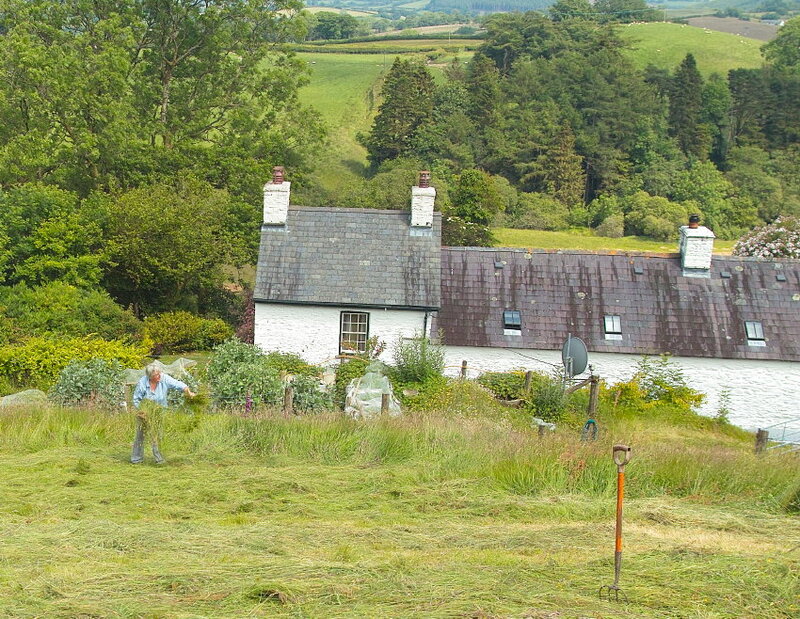 You can even book a holiday at a cottage that Prince Charles owns in the area to explore this very special environment. Click here for the link. 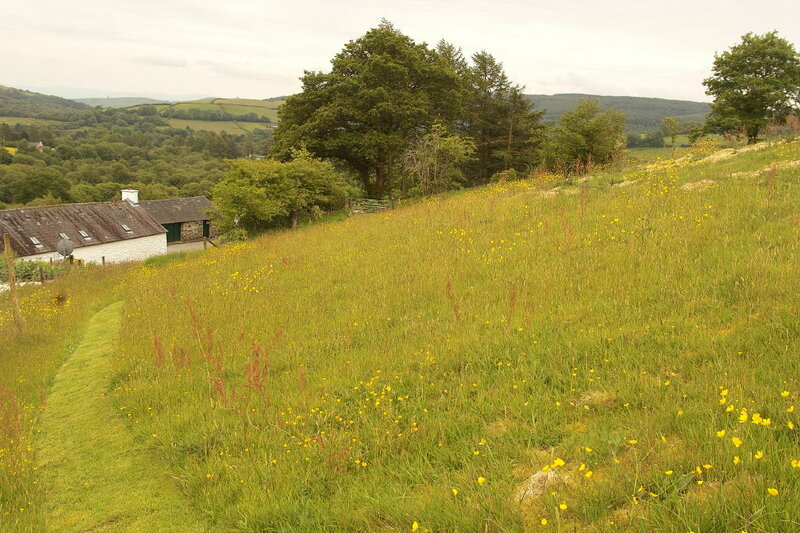 But closer to home HRH Prince Charles has also been passionate about preserving the UK’s old hay meadows. 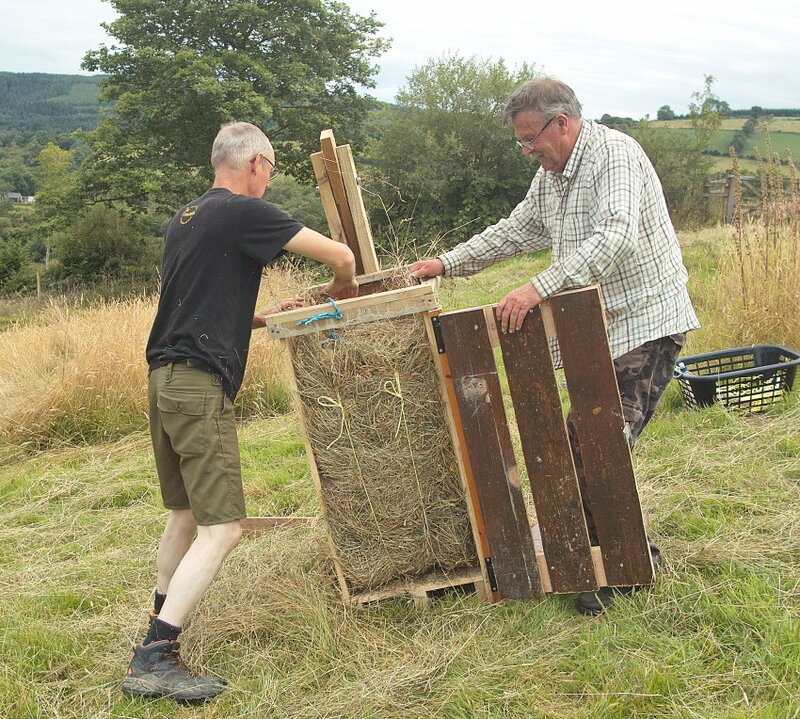 It’s often quoted that 97% of traditional hay meadows have been lost from the UK in recent years, and last year as a project to commemorate the 60th anniversary of the Queen’s coronation, he established the Coronation Meadows initiative. 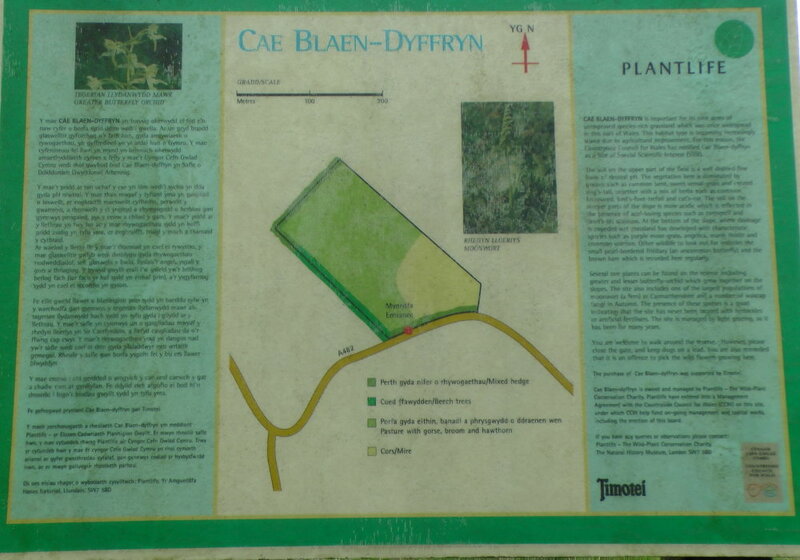 But interestingly this meadow is managed by the Plant Life charity, and its acquisition was sponsored, I notice from the information board, by Timotei shampoo. 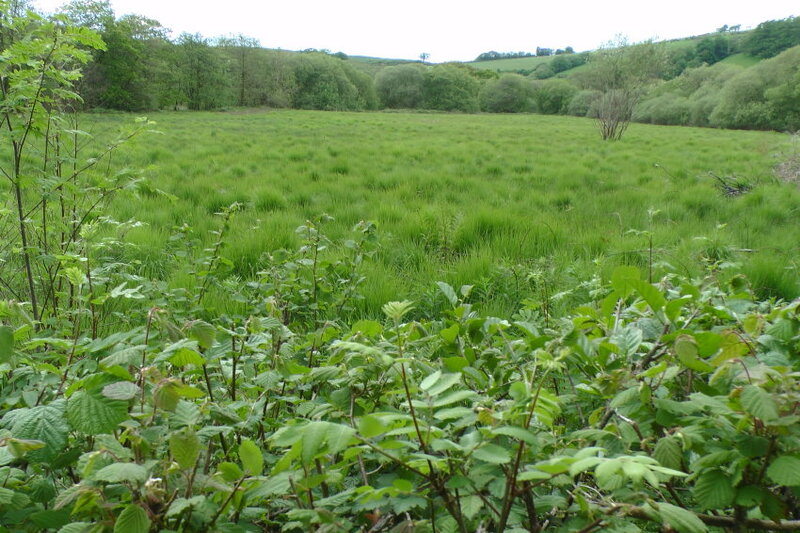 And this gives a clue as to why such meadows are now so rare that some Coronation Meadows are simply roadside verges – simply no areas of representative meadow fields remained within those county borders. It is an expensive, weather affected and labour intensive option to go the annual hay crop route, with no use of artificial fertiliser. 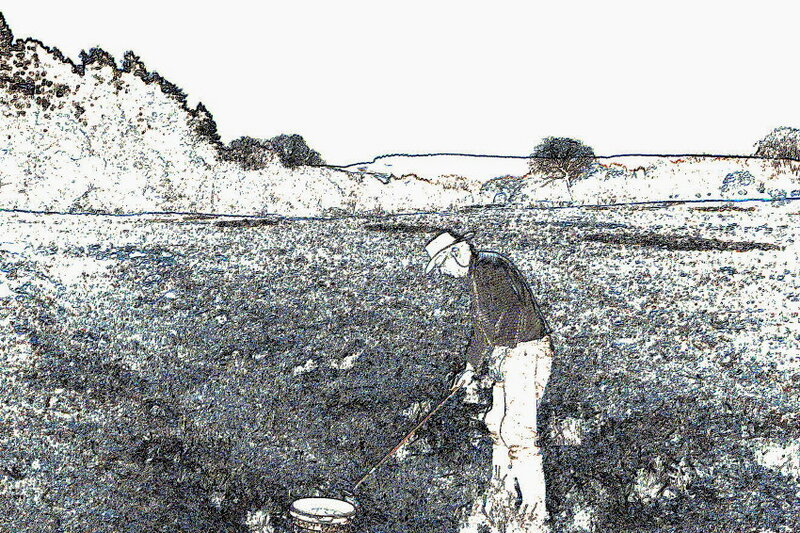 So for much commercial agriculture, the practice has been abandoned. 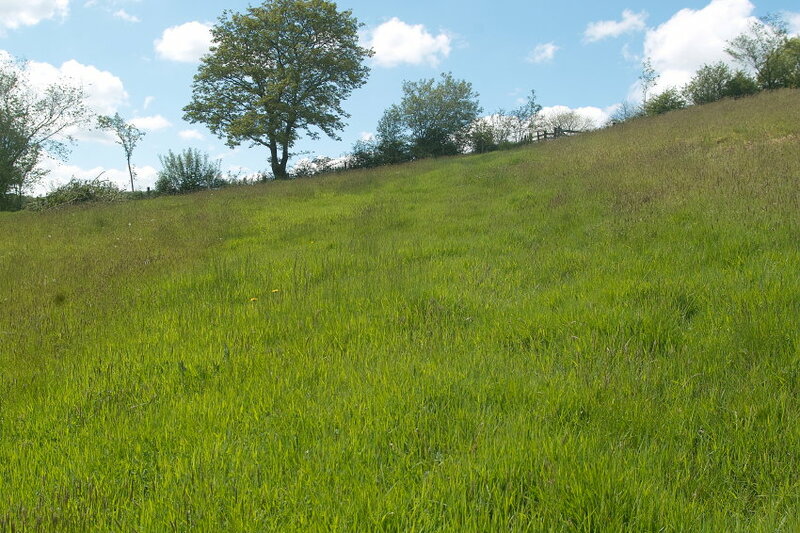 Reseeding with more vigorous and productive varieties of grass has been the norm, heavy grazing or earlier cutting for silage, and much application of artificial fertiliser. 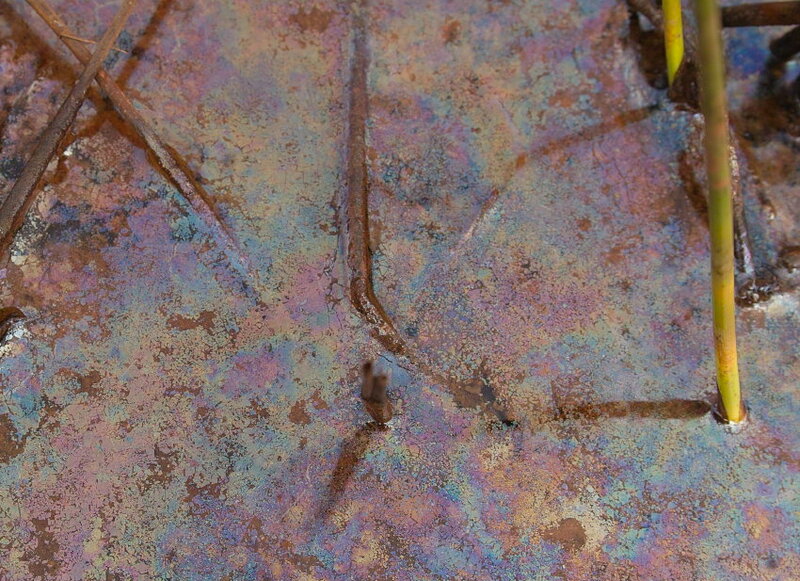 The flowers rapidly disappear, as does the dependent fauna. Forestry. 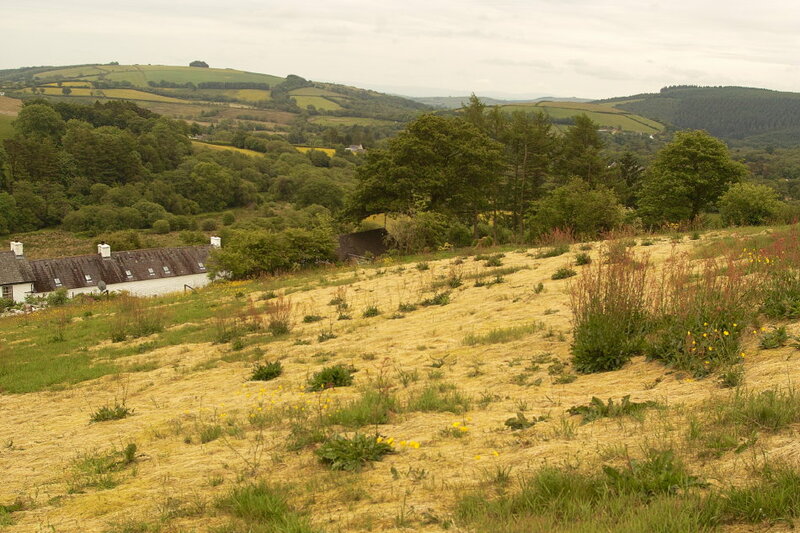 In a little known initiative, the Welsh Assembly Government has created a plan to plant 5,000 hectares of new woodland every year for the next 20 years. Read more (click here), and it appears that the aim is for such new woods to be placed on steep, and currently under-managed land. But barely a mile from us, on perfectly level, and historically meadow type pastures, the trees have gone in. 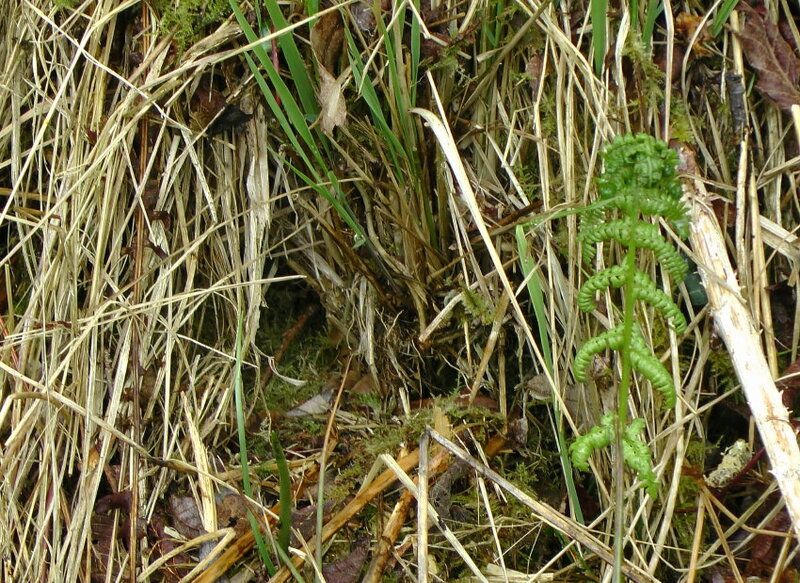 At least broad leaved species have been used. 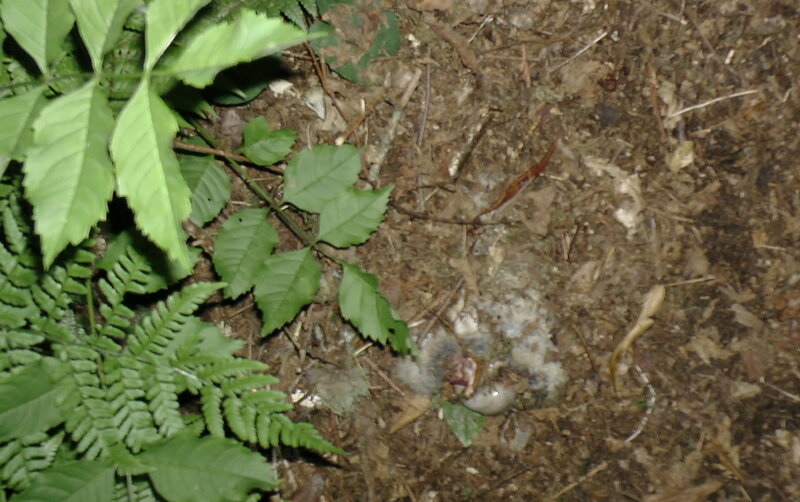 Though how well the many obvious ash seedlings will fare is open to debate. 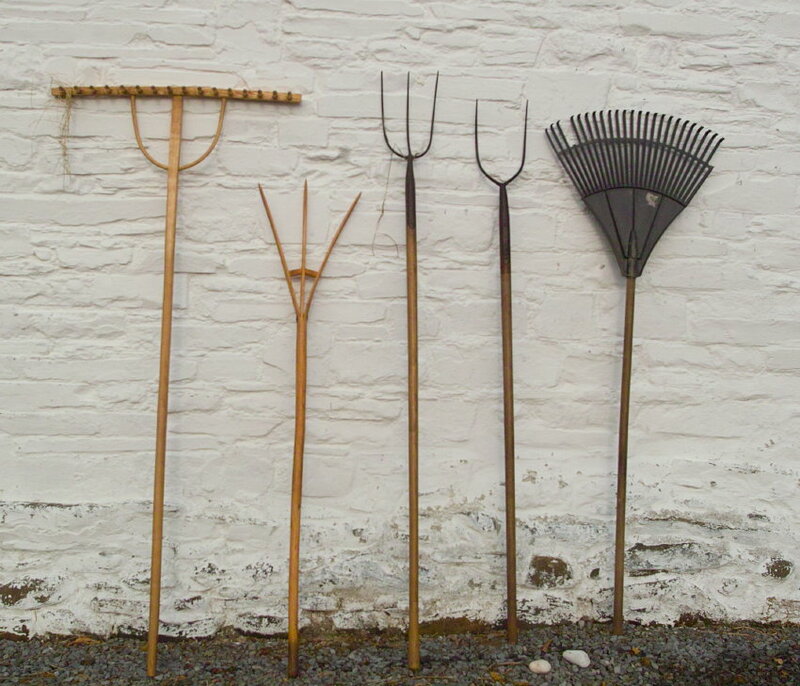 Driven, I guess, by significant grants for planting together with low management costs over many years, for some farmers this may be an economically attractive option. I understand that this particular development has been made by an absentee landlord. Which therefore probably makes perfect financialsense. 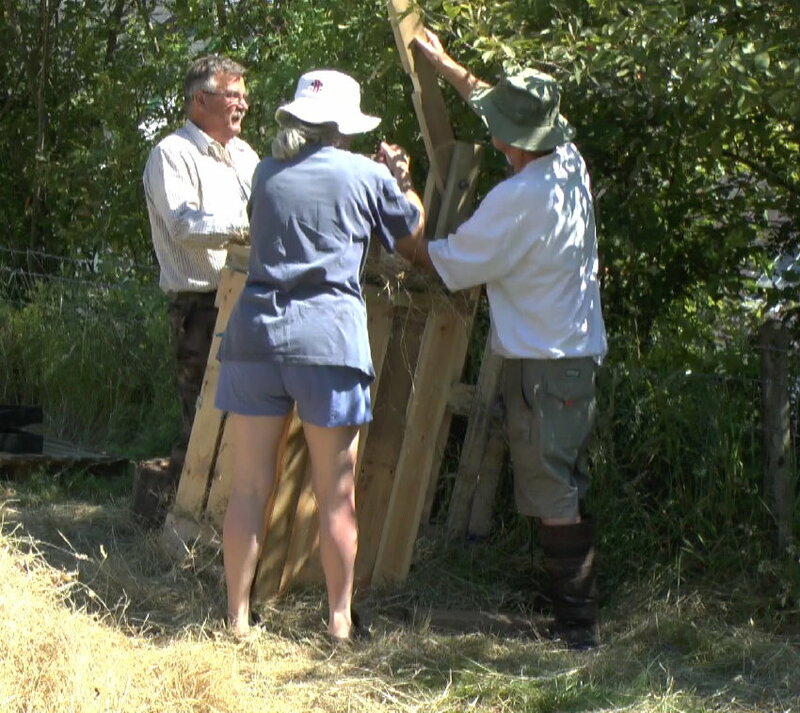 But how to save the hay meadows? 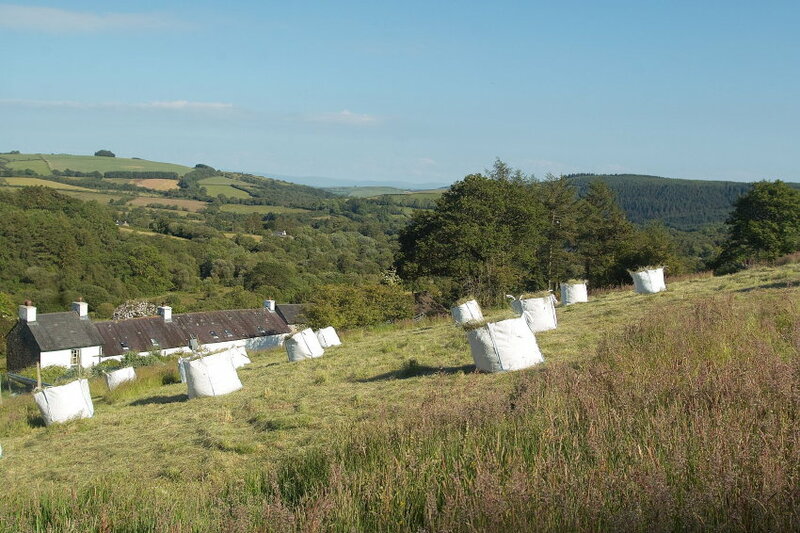 Throughout the UK, environmental stewardship schemes help to support wildlife sympathetic farming practices, but apparently only the Higher Level Stewardship schemes are likely to encourage farmers to retain hay meadows as a financially viable option. Click here for more discussion on such schemes in England. And there simply isn’t enough money in the kitty to have a significant effect. 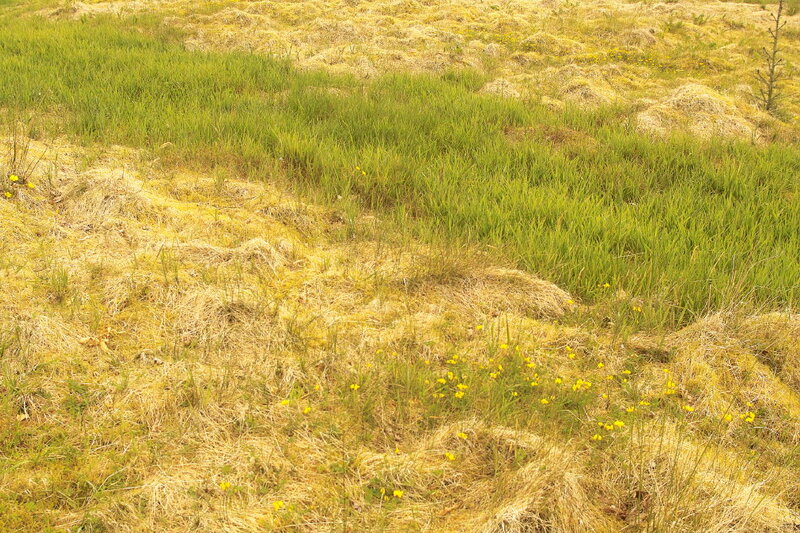 So it does seem that the survival of many of the remaining hay meadows, certainly in this part of the world, will depend on enthusiastic stewards who see a value over and above any commercial decisions in maintaining this natural/man made almost symbiotic ecology, for personal and perhaps shared long term aesthetic and wildlife benefits. 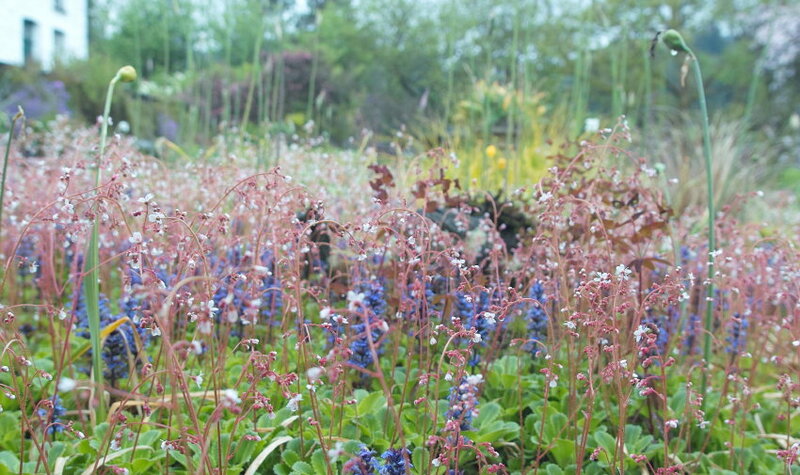 Simply cutting, or even heavy grazing, is unlikely to limit their progress, and rather like our Geranium cultivars in the garden, they are a dominant plant species, out competing pretty much anything else. 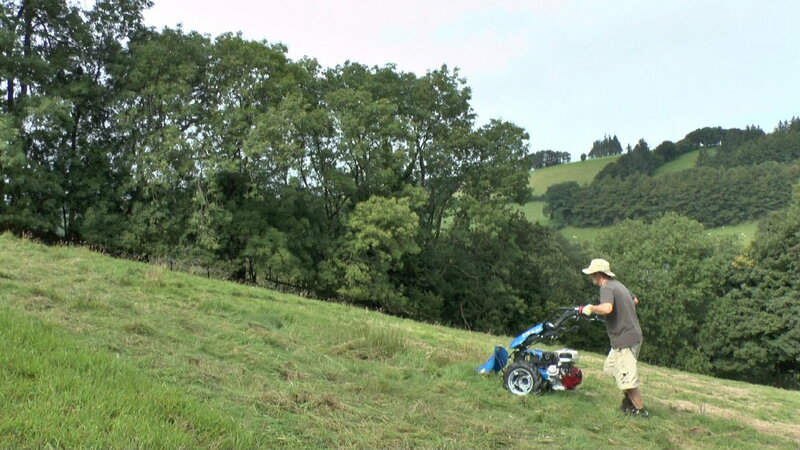 So after much deliberation we have opted this spring to apply a selective weedkiller to the worst sections of our lower meadows, following on from last year’s autumnal, and then an early spring, cut using our BCS 615SL Powerscythe. Several reports seem to endorse rush control in this way as a necessary evil, to achieve diversity going forward. 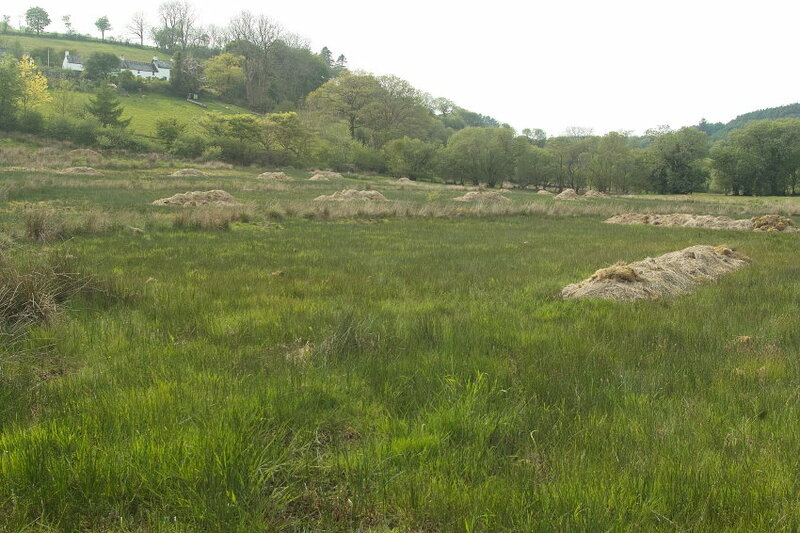 Click here for a link on the status of Welsh Hay Meadows, by the charity Flora locale. 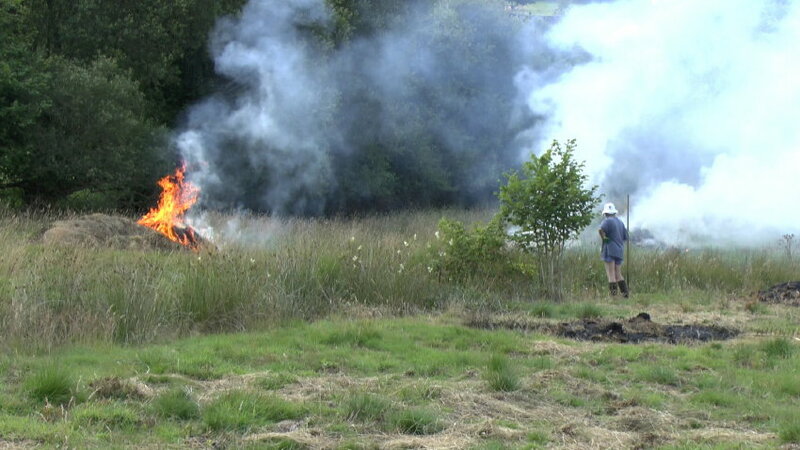 And click here for a project to restore hay meadow diversity funded by the English Utility company United Utilities. 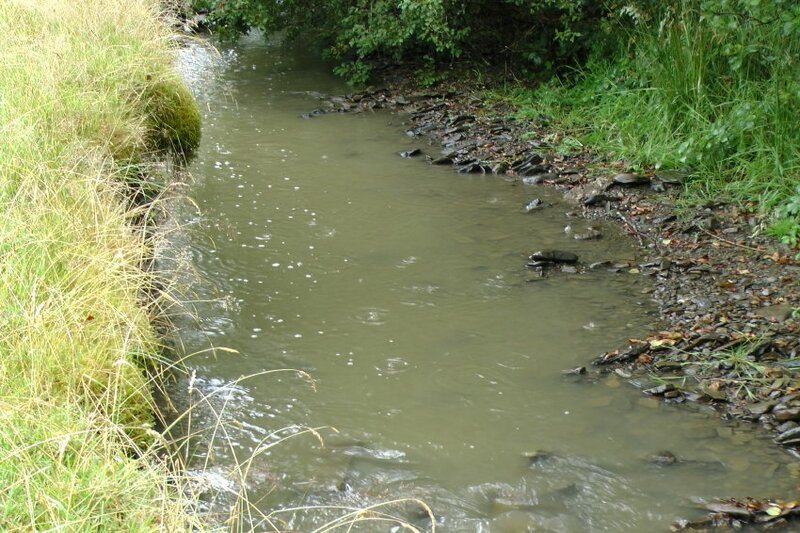 (Interestingly, Transylvania has a very different climate to West Wales with just a third of our annual rainfall, and predictable hotter summers, so my guess is that rushes do not present the same issues there). 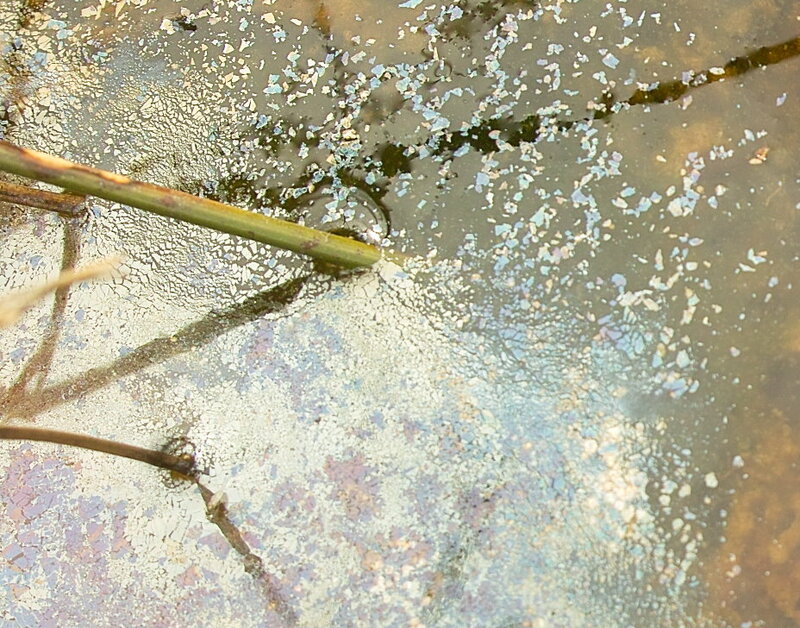 The decision to use a herbicide was made easier by an imminent change in legislation. 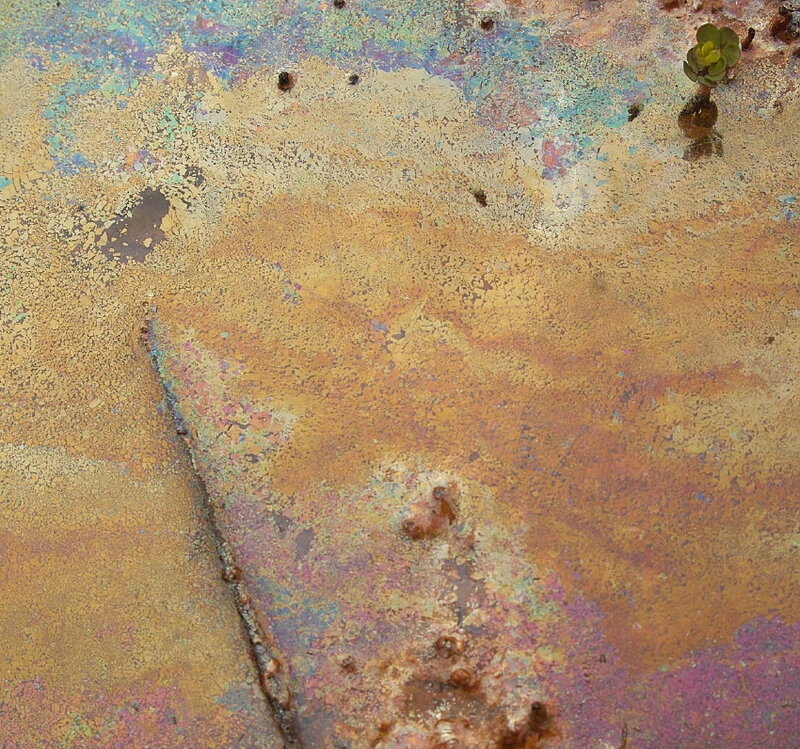 As from 2015, it will no longer be permissible to purchase any agricultural plant protection chemicals without first obtaining a certificate of competence in its application. You will need a different certificate for different means of application. So for us it would require a course at an approved centre, then registration to complete a test, and then taking an exam which would hopefully result in a certificate of competence. The cost of all this would be well over £450, excluding the travel costs, plus possible overnight accommodation. 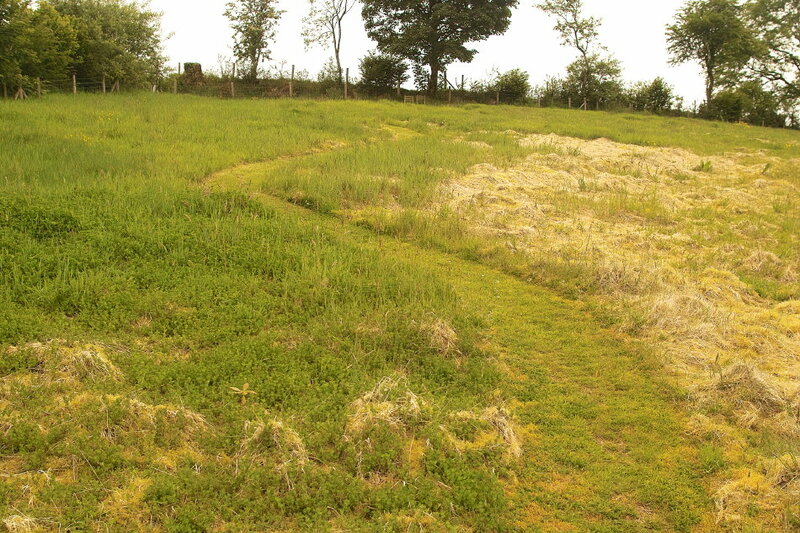 The cost of the selective weedkiller sufficient to treat several acres of rushes is currently about £45. It seems to me likely that very few smallholders would contemplate shelling out this sum. So what would the options be going forward, if you have a rush problem? 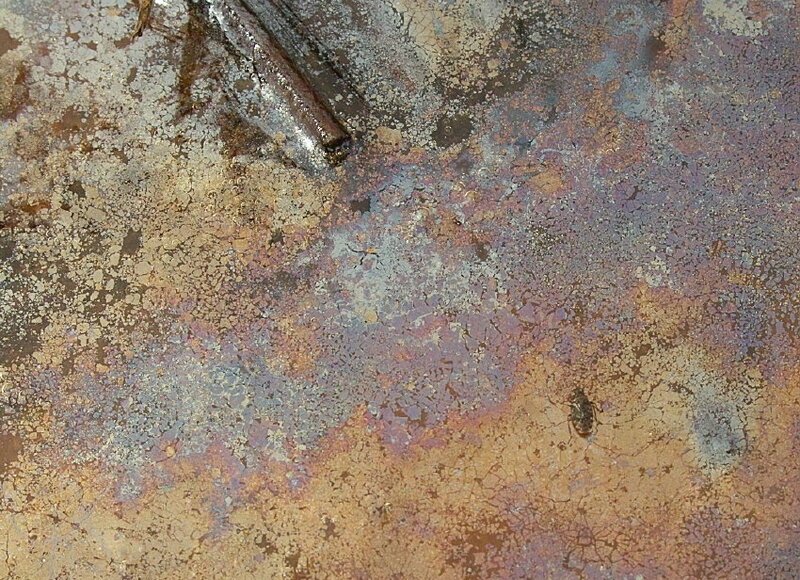 Presumably the ‘powers that be’ anticipate we would call in a suitably qualified contractor to apply the chemical. But one of the things we’ve learned here, is that any weather dependent task may have very limited windows of opportunity to be successfully completed. 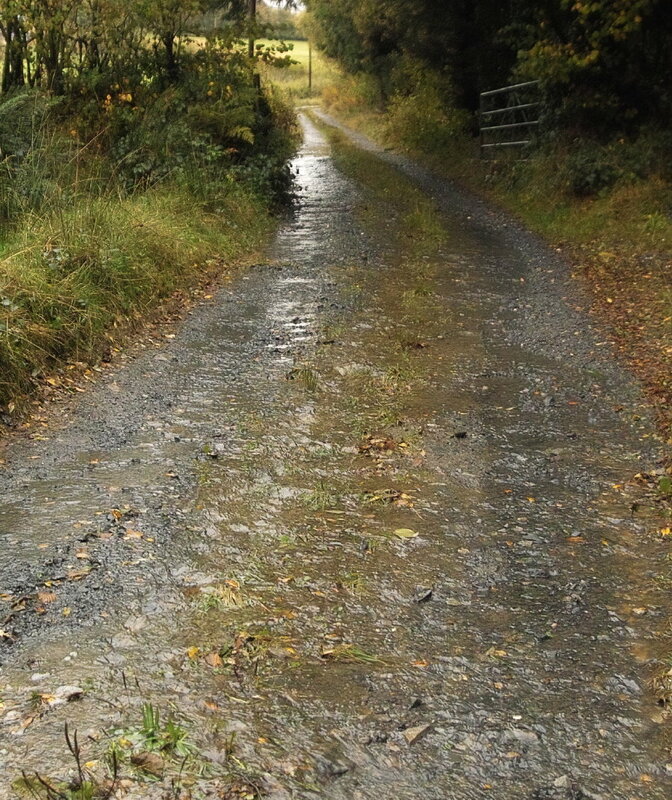 In the case of rush treatment it needs to be applied early in the year-ideally late April/May when there is vigorous new rush growth above surrounding foliage, and you need at least 12 hours without rain after application for optimum success. Even with good weather forecasts, you might only know on the morning that today is the best time to spray. Now ring your contractor, and get him to come within a couple of hours, along with all those other smallholders ?? 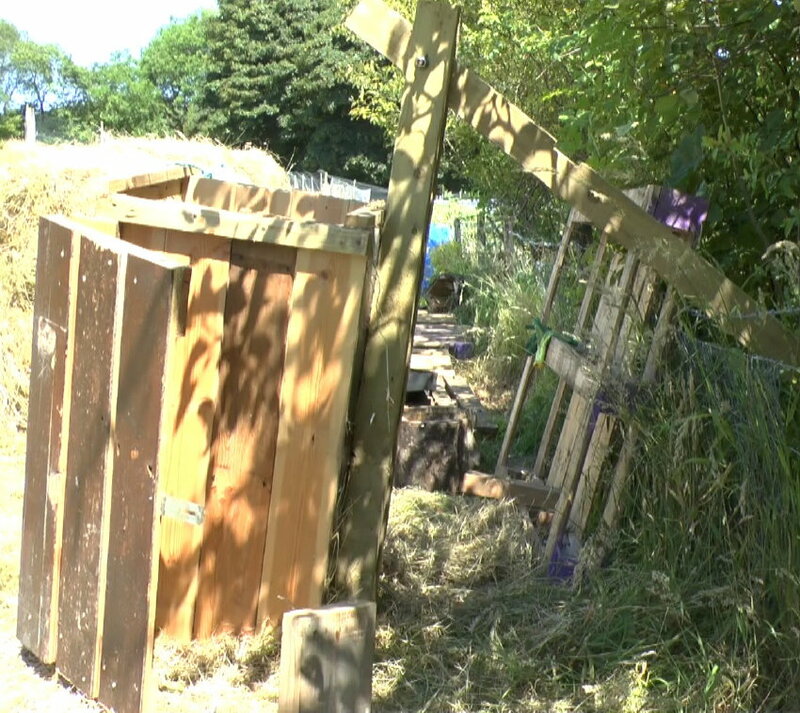 And in our case vehicle access to the fields is inappropriate for much of the year. They are just too soggy. The 2 wheeled BCS 615 SL power scythe scores highly here, being much lighter than either ATV/Quad bike or even worse a tractor and equipment, so little surface damage is created after just a few days without rain. I’ll update in future years just how successful (or not!) our attempts at managing these fields have been. For now, we have grass returning, wild flowers have already colonised the ditches very well so we have plenty of nearby seed to reintroduce, and for the first time in the 20 years that we have owned the property, the fields actually look like damp meadows, rather than rush mono-cultures. Maybe we shall manage to leave these fields to future owners in better nick than when we took over stewardship? 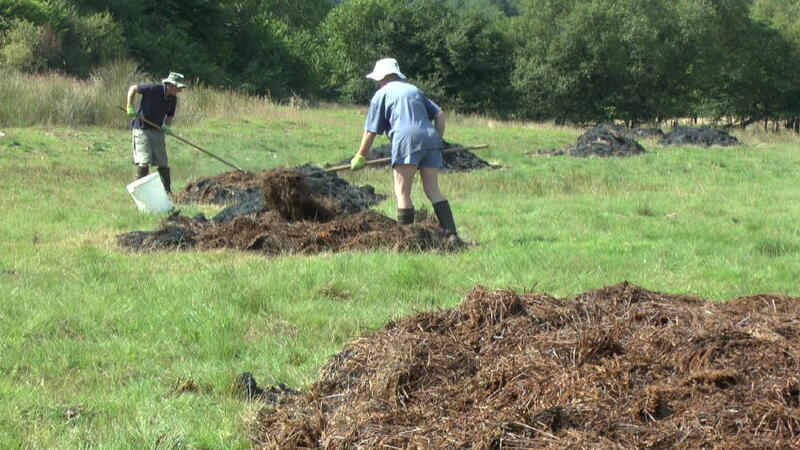 The wonderful hot sunny weather at this time of the year inevitably means 2 tasks occupy much of out time. (Sadly not, as recent garden visitors suggested, sitting on our various garden seats sipping glasses of wine!). 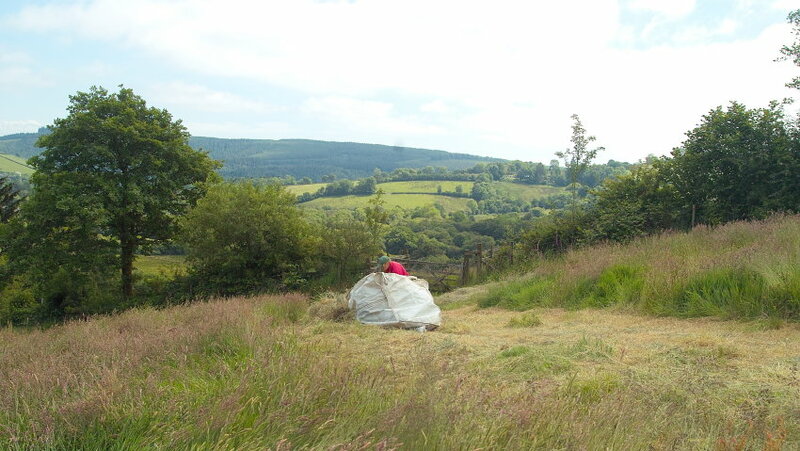 Shearing and hay making. As an amateur shearer the results are best described as patchy, and my lack of practice makes me very slow, but fortunately we have patient sheep who can see beyond the experience, to the relief of a cooler summer ahead. Prompted by an amusing and timely birthday card this year from Fiona’s mother, I opted to try sitting down to shear, and this worked surprisingly well in sparing further back issues, which I guess are the bane of any slow shearer. 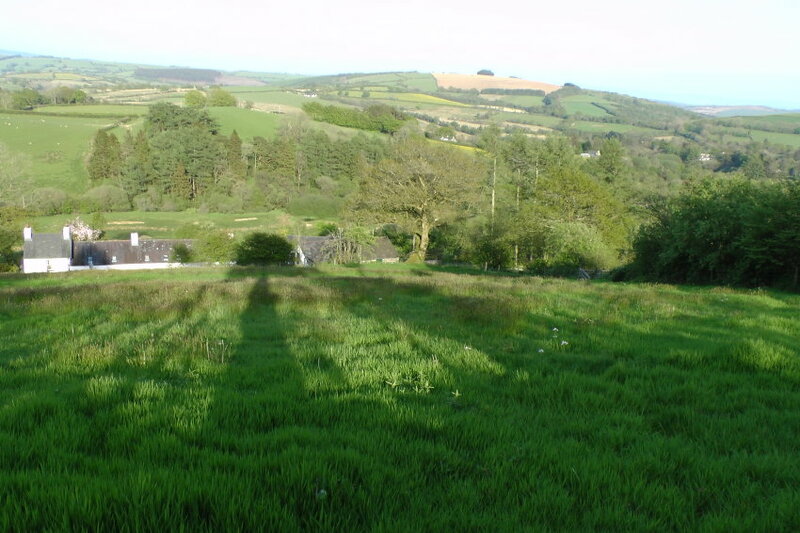 And it was as I moved across the slope with wheeling Red Kite overhead, and the cuckoo still calling in the valley, as the sssshhhhhhhssssshhhhh whisper of dry light long grass stems studded with dessicated golden buttercups and pink sorrel seeds, was gathered and tossed or flicked over, that I wondered about how few folk will ever have experienced this simple pleasure? 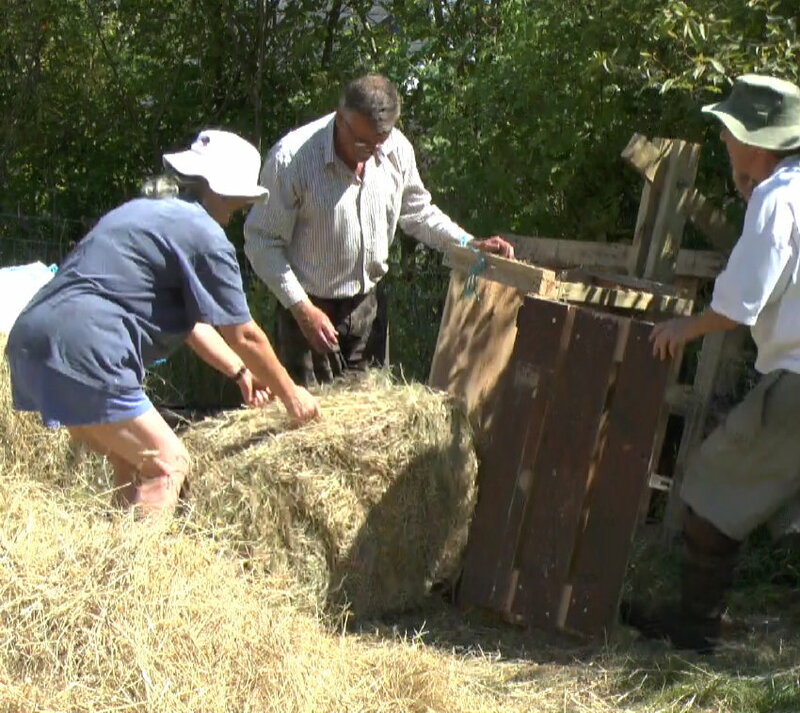 How would you describe that unique sound of dry hay on wooden fork, over baked ground? Or the smell? Do get in touch if you’d like to experience it next year. Many hands certainly make lighter work! 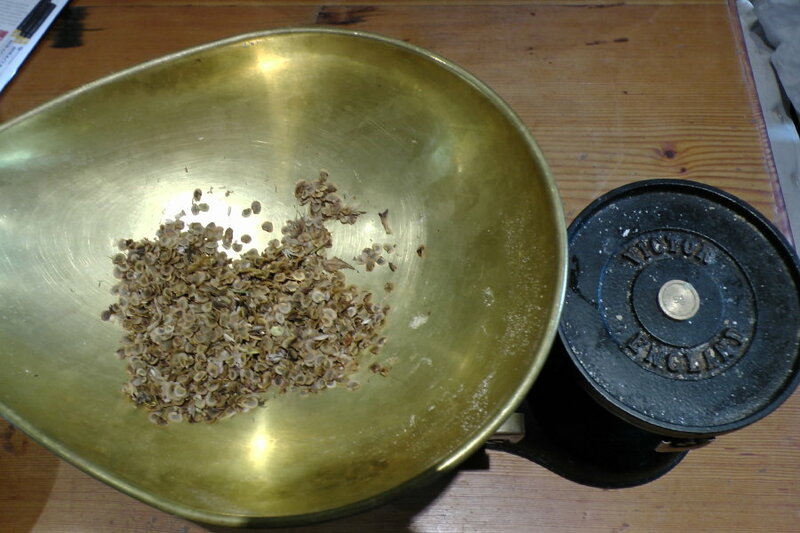 Before and after our trip, on dry days, I’ve been collecting Yellow Rattle (Rhinathus minor) seed to spread around our meadows to add both colour and aid establishment of other meadow flowering plants. On a warm summer evening there’s a simple delight in stooping to gather the seed capsules off the stems in a single upward stripping action. Starting with a just a handful of seeds about 4 years ago, I reckoned I could harvest quite a bit from the clumps of plants scattered around the high hay meadow this year. 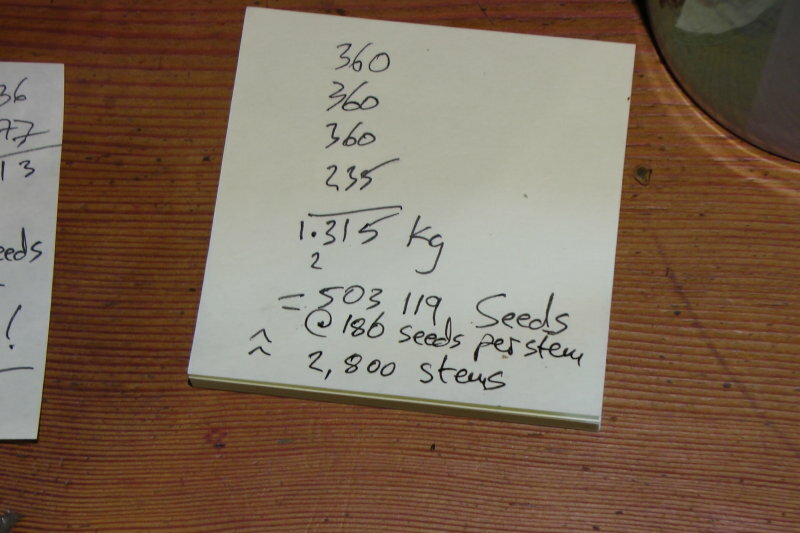 But after winnowing the seeds out with a couple of inherited old sieves, I wondered how much I had actually collected… Weighing it was easy, but how many seeds does that amount to? 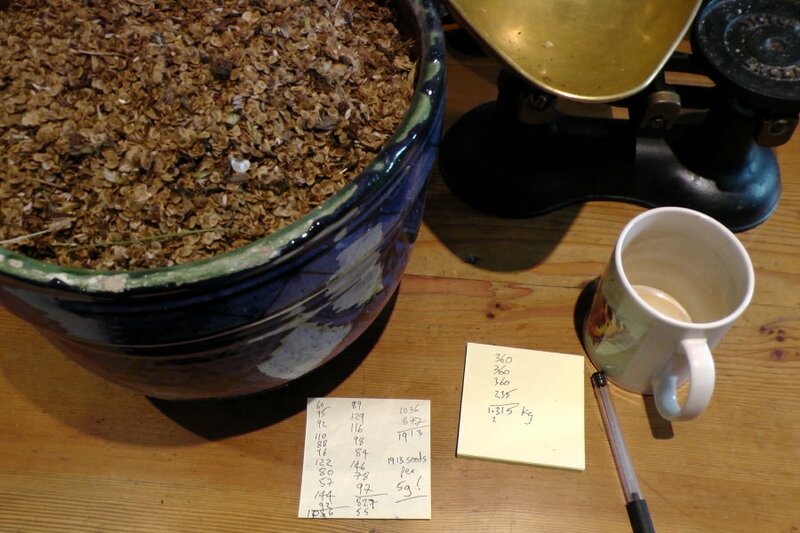 A couple of cups of tea later, and the calculations were finished. About half a million seeds. 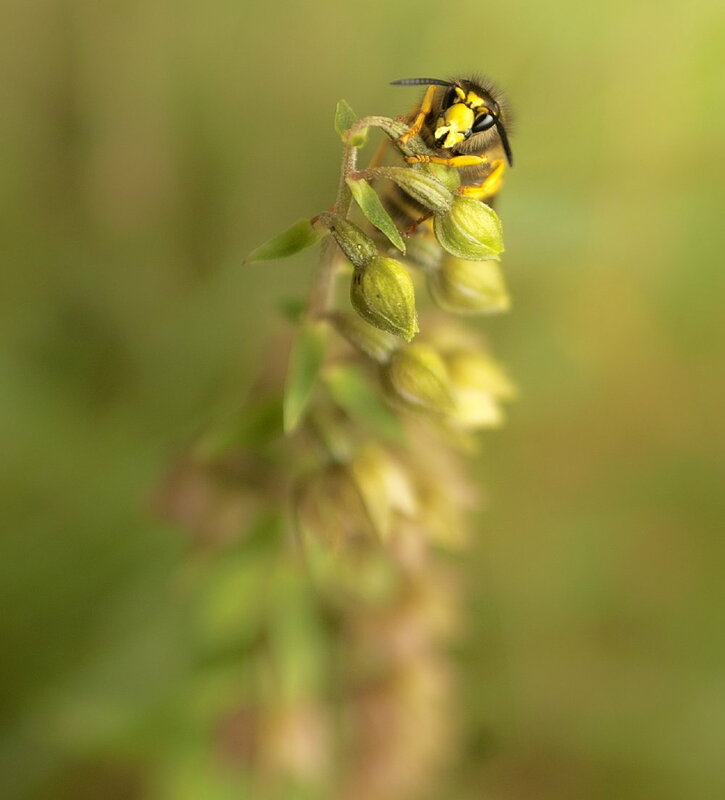 But apparently a Kg of Yellow Rattle seed will cost well over £100, so there is an economic advantage in the patient approach when dealing with such a prolific species. 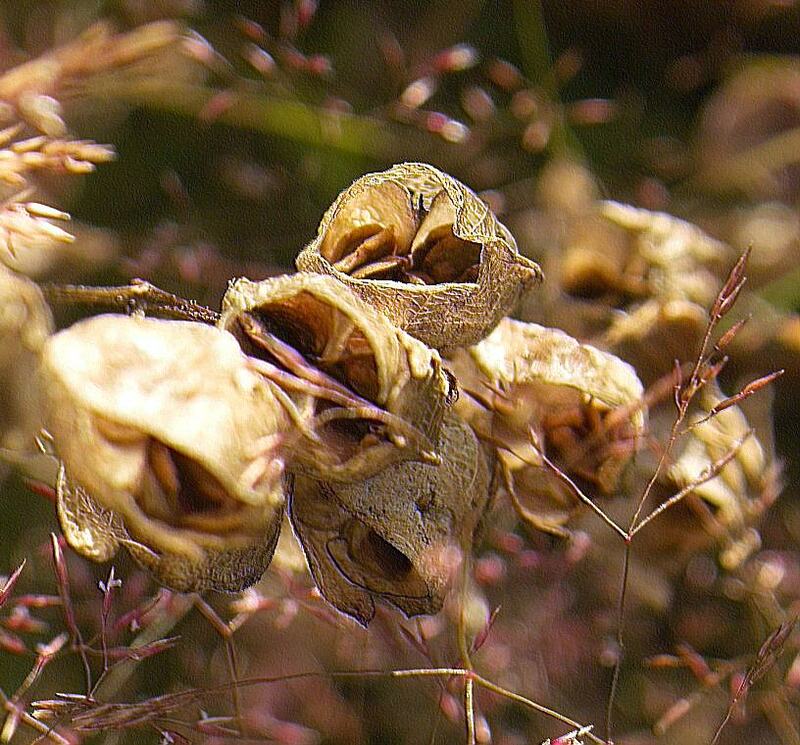 And I hope that by hand selecting the earliest seed capsules, I might eventually select for a population that flowers earlier in the year, which will give us big advantages when deciding whether we can chance taking an early hay crop off the meadows. 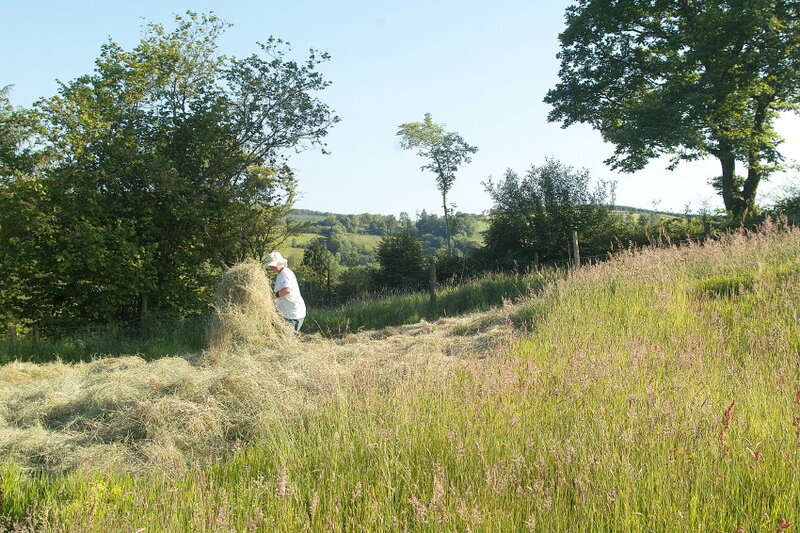 For those locked into environmental land stewardship schemes, there is often a date of July 1st as being the first possible option for cutting hay. This year, having to wait until then would have missed early weather chances, which often are limited, in West Wales. 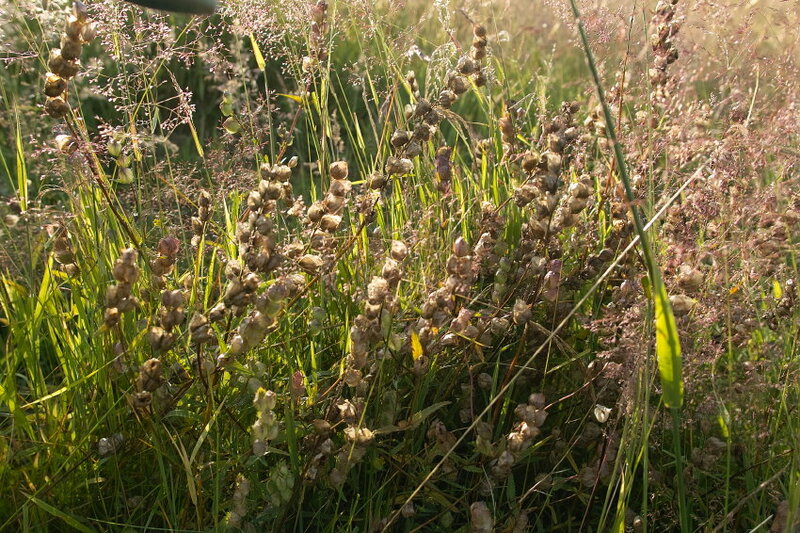 All the above yellow rattle was harvested before July 1st. 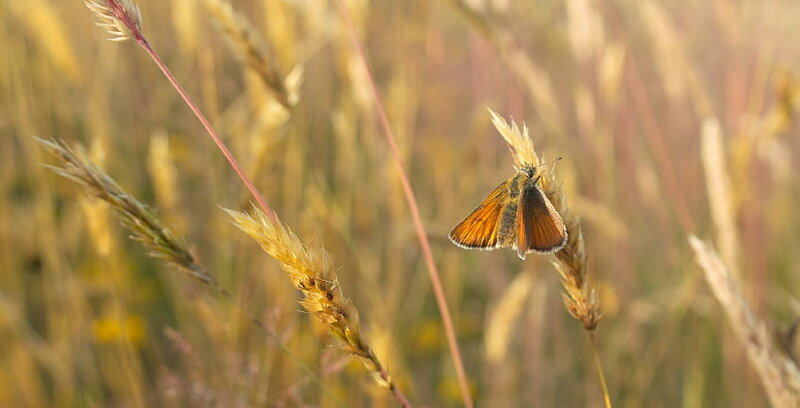 Other flowers set seed later, so the plan is to use marginal or central strips of uncut meadow to allow these plants to flower and set seed, as well as providing plenty of suitable grass species for the common grassland butterflies to use for egg laying. Even the sheep seemed to sense a novelty. Who was this booted stranger? 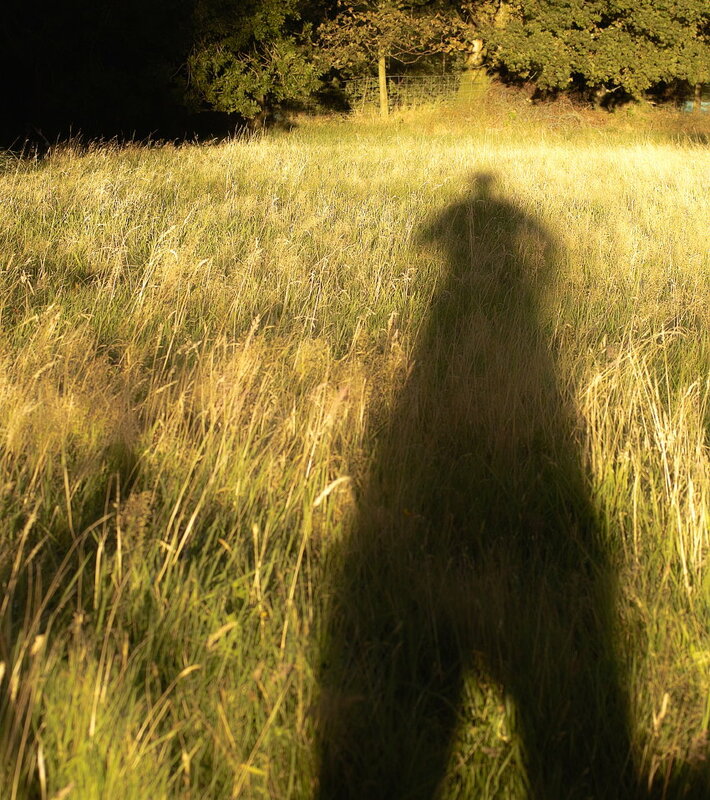 The sounds, shorts, coat and probably smell were familiar, but the black, ribbed dome sprouting from his head rendered him unfamiliar and threatening. No nuzzling up for a head rub today. Scatter and skidaddle quickly with the sense of panic that can quickly seize a group of sheep, and run through them all with telepathic rapidity. 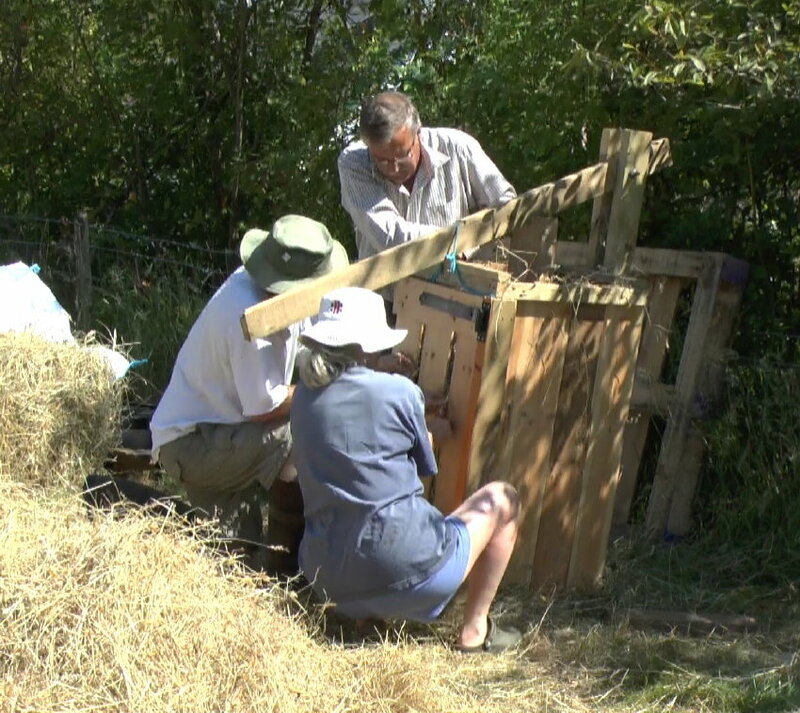 Our final session of serious hay making finished in late July, and I’m devoting a lot of images to capture the hugely impressive manual hay baler that was knocked up by our neighbour and fellow hay labourer for this year, Dave Bevan. 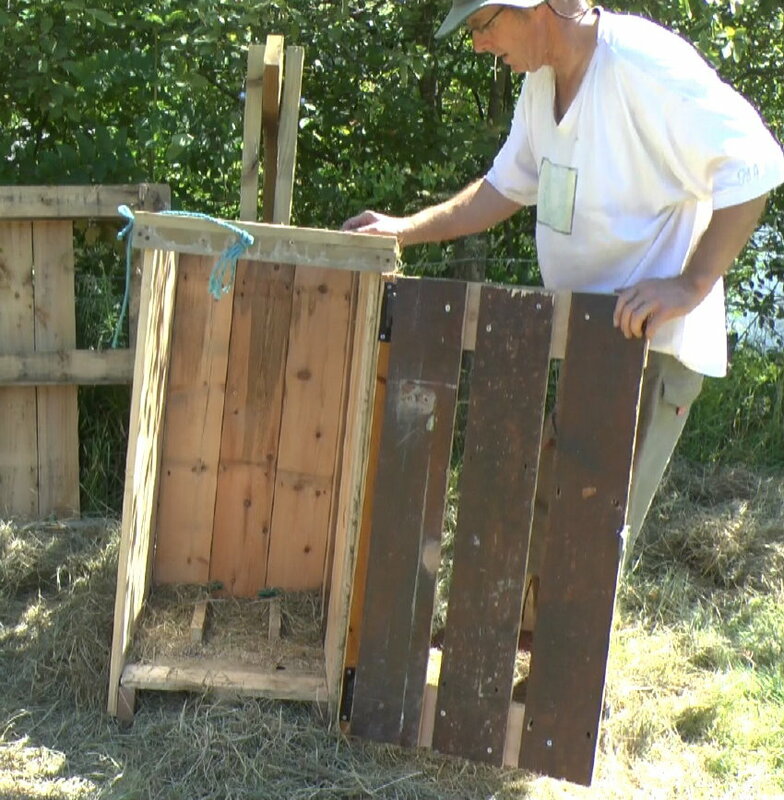 Dave is shown below with us using the baler. 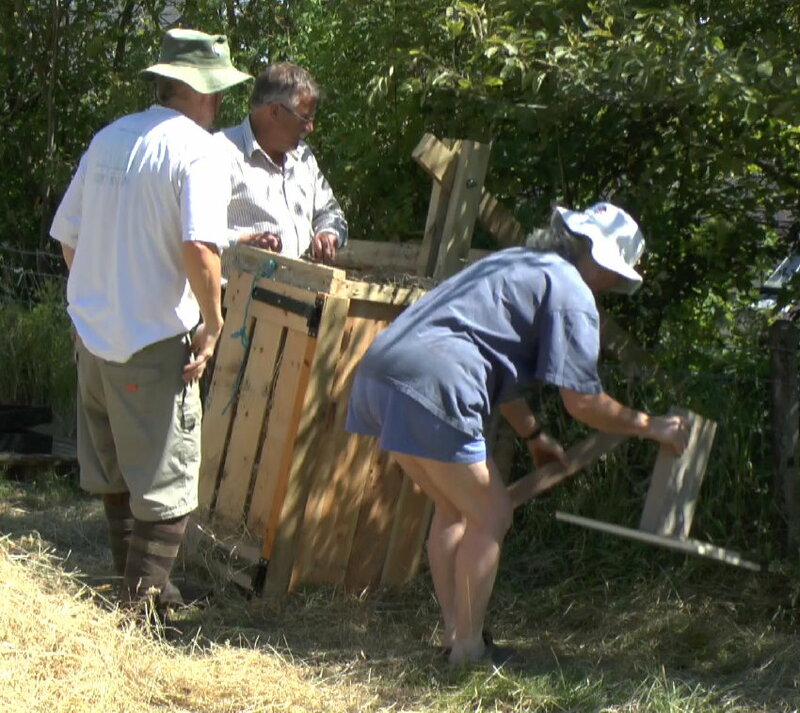 2 people can knock out a bale which is a very passable alternative to old style small bales in just a few minutes. 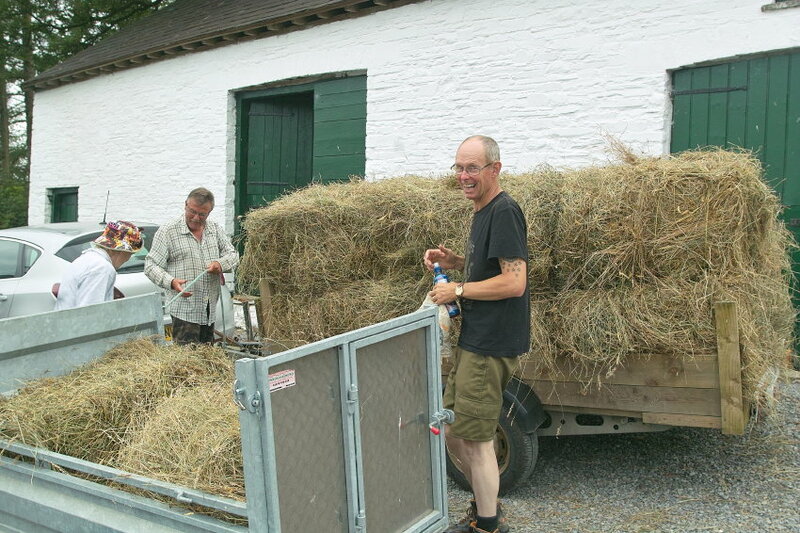 Dave’s bales are just the right size to both fit 6 into my small ATV trailer, and about 8 on the base of a trailer he also knocked up from an old caravan chassis – what a clever chap he is! (The above are time lapse images…there is a simple hilarity in watching the actual process, speeded up – perhaps I can get it uploaded to You Tube sometime). 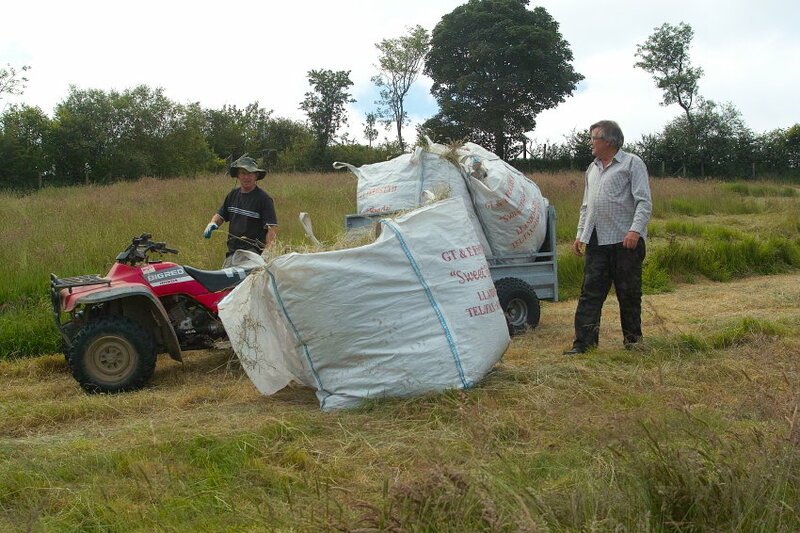 For all the cynics, it is indeed labour intensive, but for managing a small acreage of hay, where terrain precludes big machinery access, and for just in time weather dependent processing, its a really brilliant little near zero cost baler. 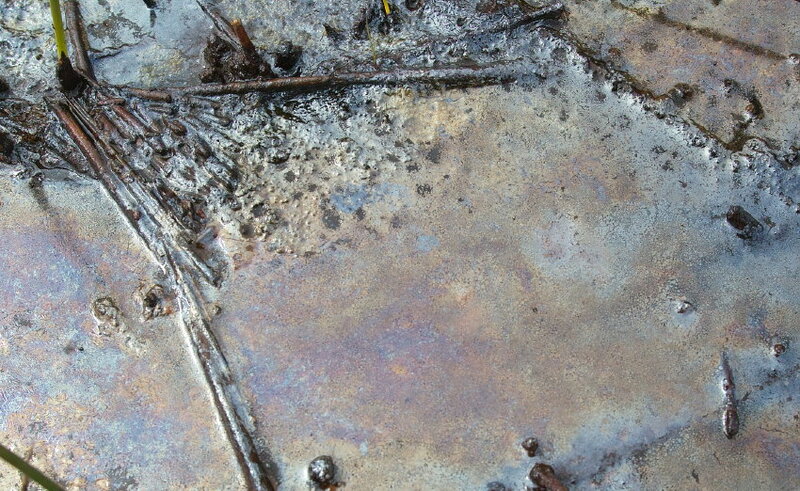 Leached out, decades old, decayed detritus. Memories of previous existence. 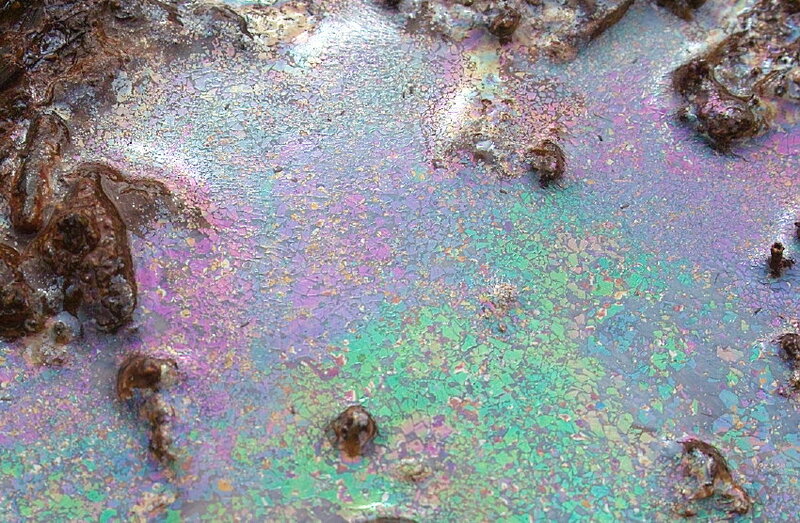 Dusts rainbowed over muddy sludge. 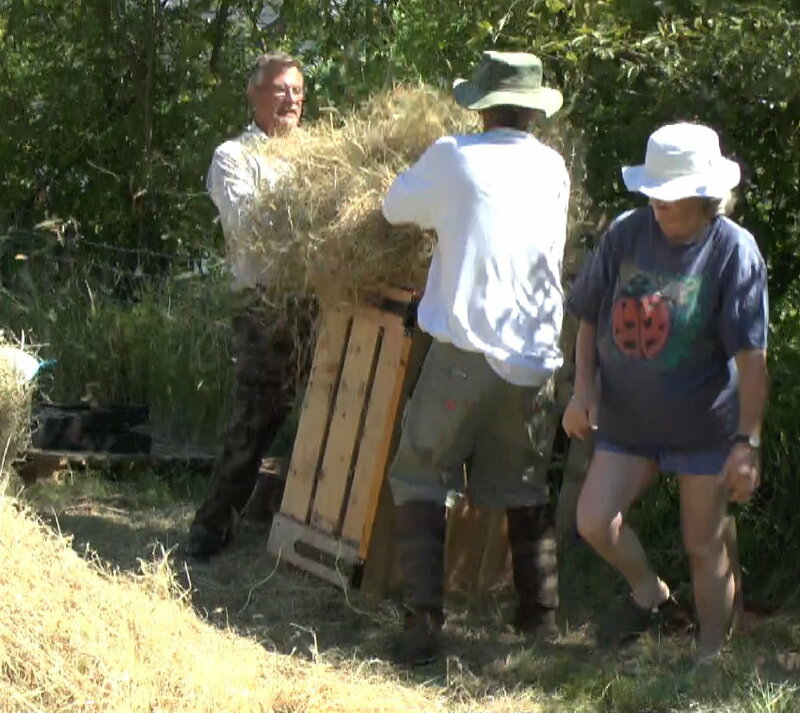 I thought that this concluded ant swarm events for 2014, having had the first obvious swarm event of black ants at the more usual time of the end of July, whilst hay making. 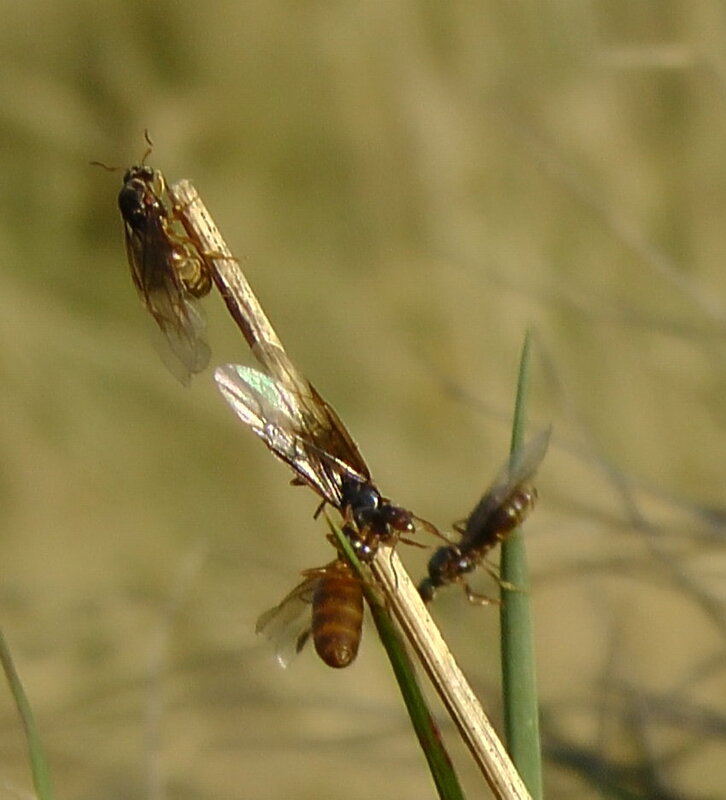 However I happened to wander into our High meadow 3 days ago when the Yellow Meadow Ant, Lasius flavus, had decided that NOW was the right time to swarm. 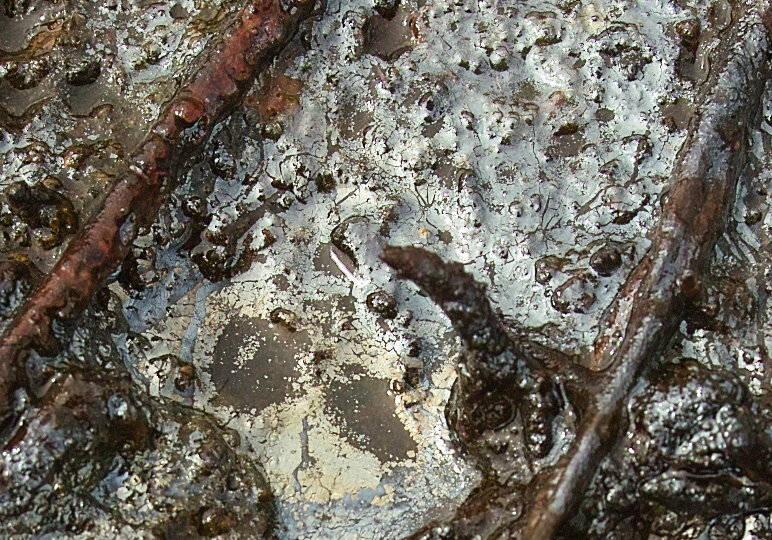 Swarming of most ant species is usually very tightly linked to favourable weather conditions, so that predators are overwhelmed by the sheer numbers of above ground insects energing from multiple nests, and the winged form of the ants have the best chance to mate with genetically different groups, and disperse to set up new colonies. Even so, the mortality of young female queens is huge, though still not enough to dent the fact that the biomass of all the world’s ants currently exceeds that of all humans. 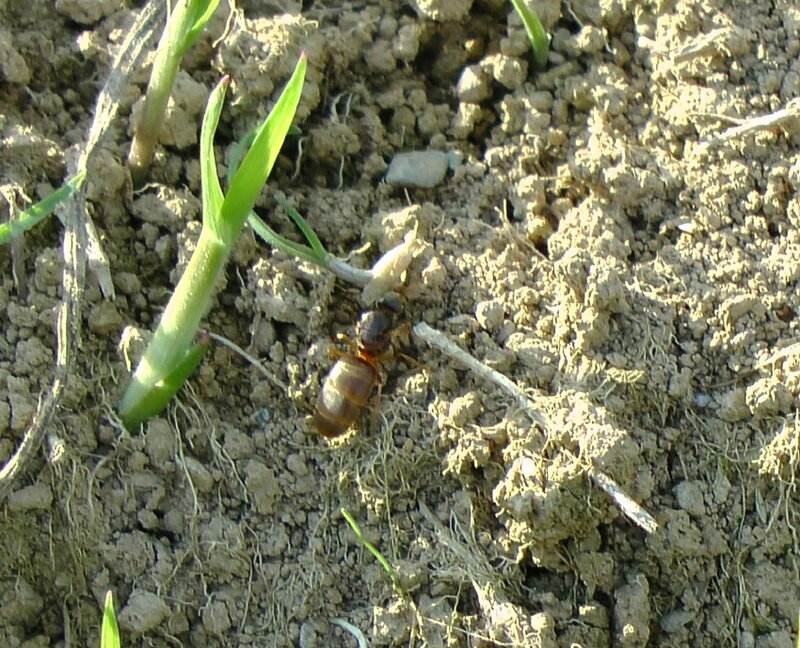 But since queens can remain active egg layers for up to 15 years, only the odd one needs to survive to ensure species success… Lasius flavus are the most common ant hill forming species of meadow ants in the UK. 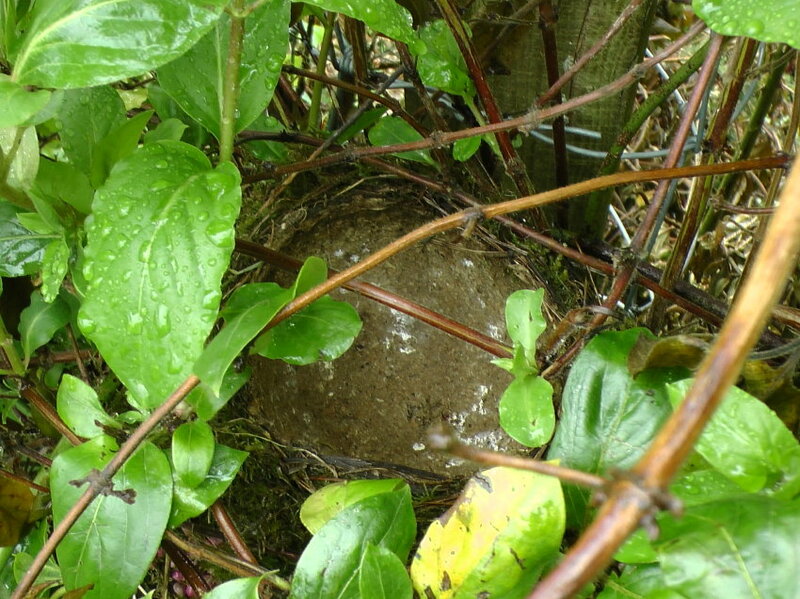 Very large above ground nests can form over years, (about a litre of soil per year is shifted above ground, giving a hint at an ant hill’s age), but the ants themselves are rarely seen above ground. 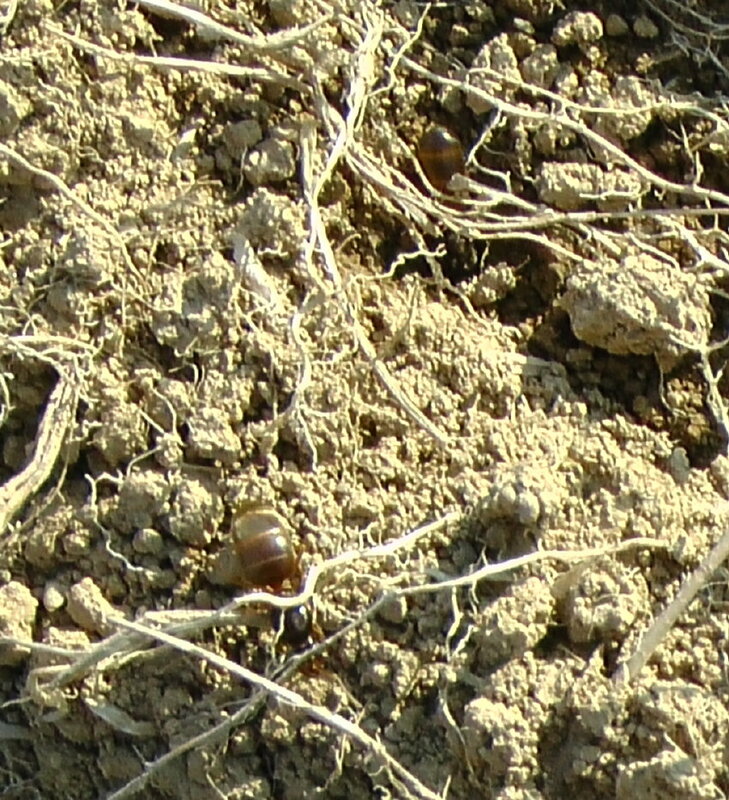 Unlike many other ant species, they rely on a symbiotic relationship with a very small number of species of root feeding aphids, kept in special chambers below the soil surface in the nests. 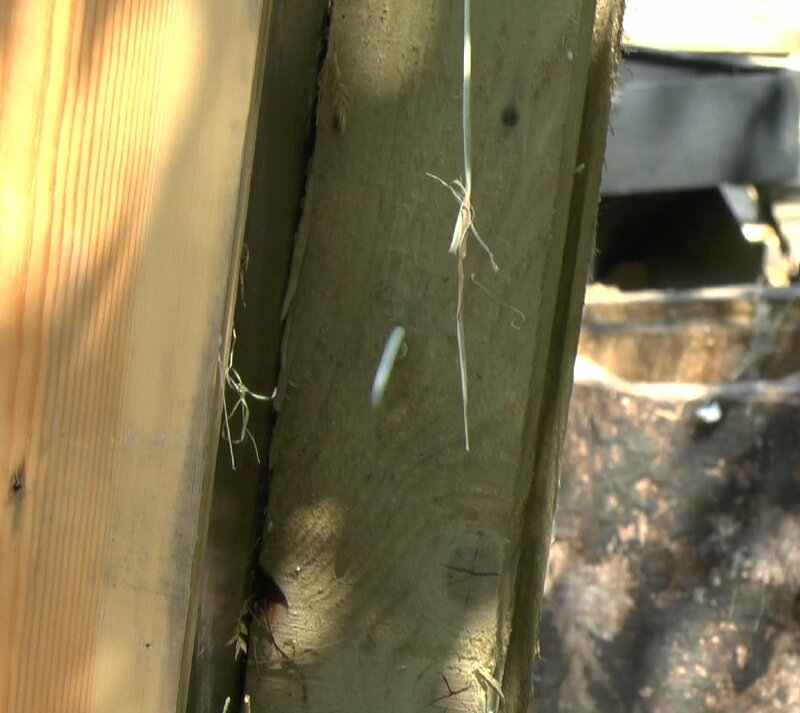 The ants eat some of the weaker aphids as a protein source, and also eat the aphid’s sugary excretions as a carbohydrate source, within a mini ant created environment managed with almost agricultural like husbandry efficiency. 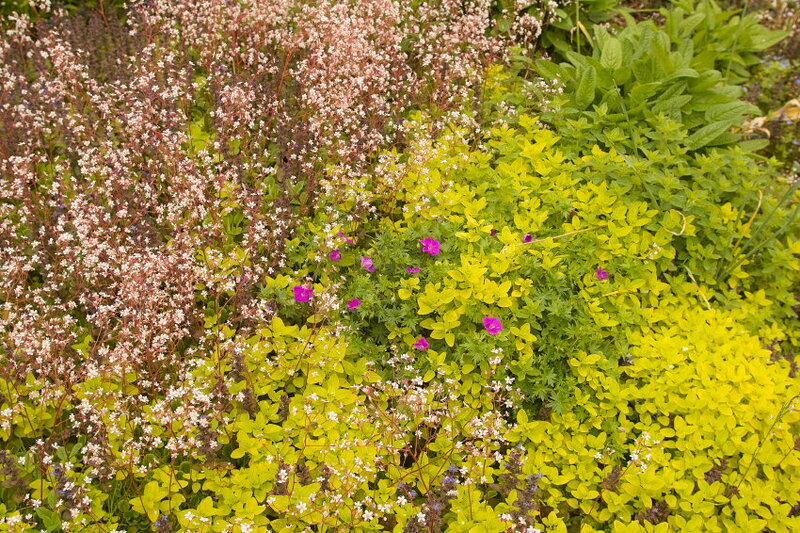 And by so doing, create unique beneficial effects on the surrounding soil and vegetation.Click here and here for more. 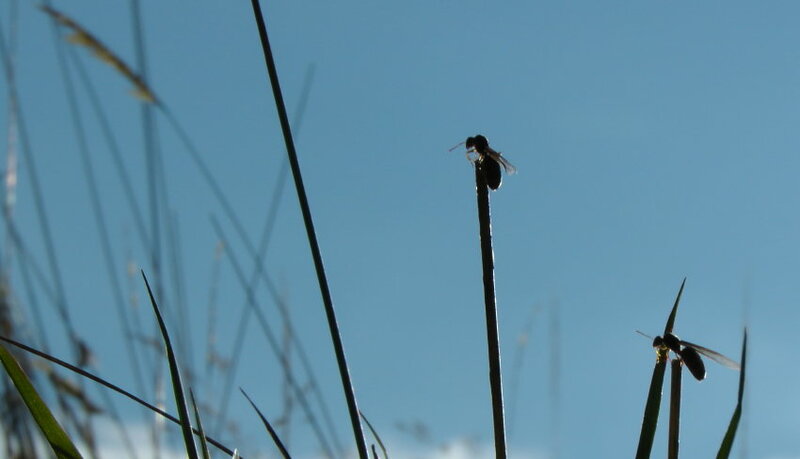 Our largest ant hill was covered with mainly winged virgin queens, slowly making their way up the tallest grass stems… There were far fewer obvious winged males around, and even the occasional much smaller and wingless worker ant… But none of the queens seemed to be flying. Had I missed this? 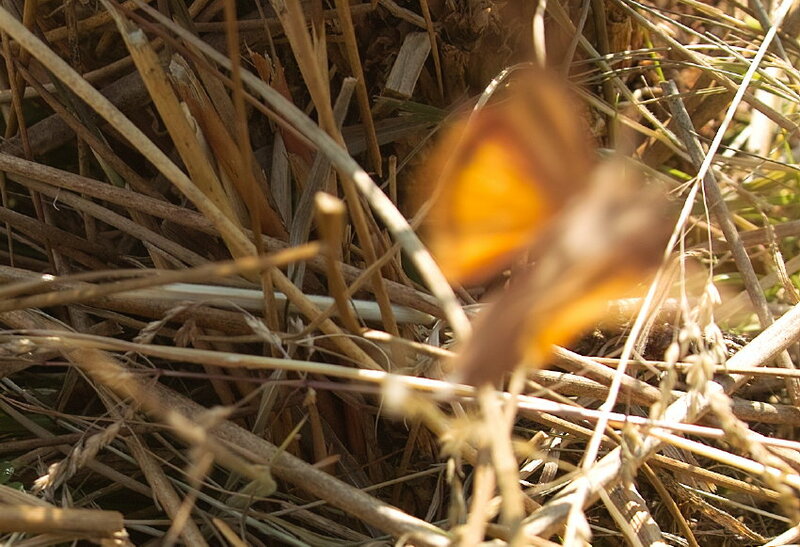 Were all the queens already mated, since this was quite late in the day? 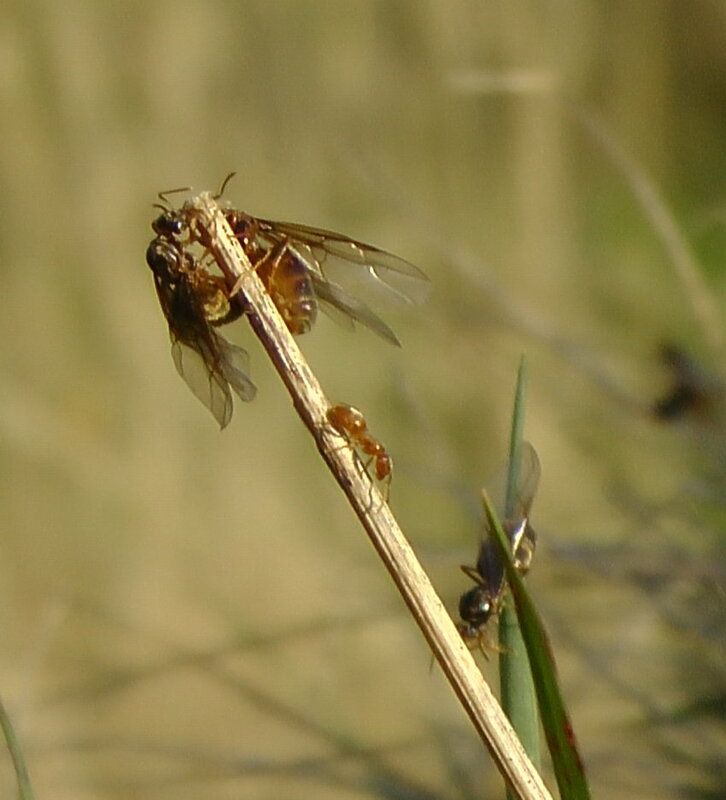 Maybe this is why I saw so few winged males, since mating is so violent that the male ant dies almost immediately afterwards. 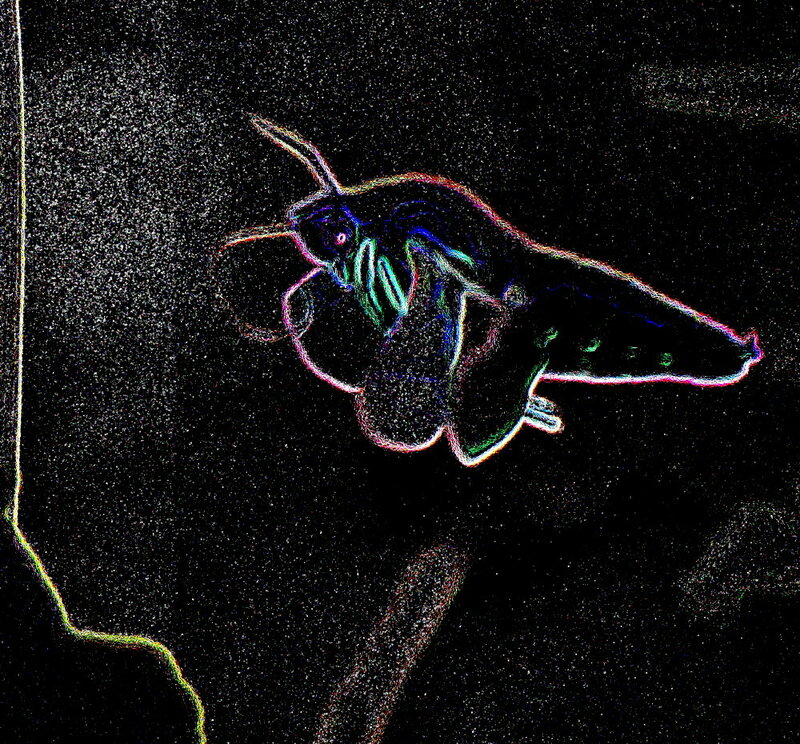 Click here for a bit more on basic ant anatomy. 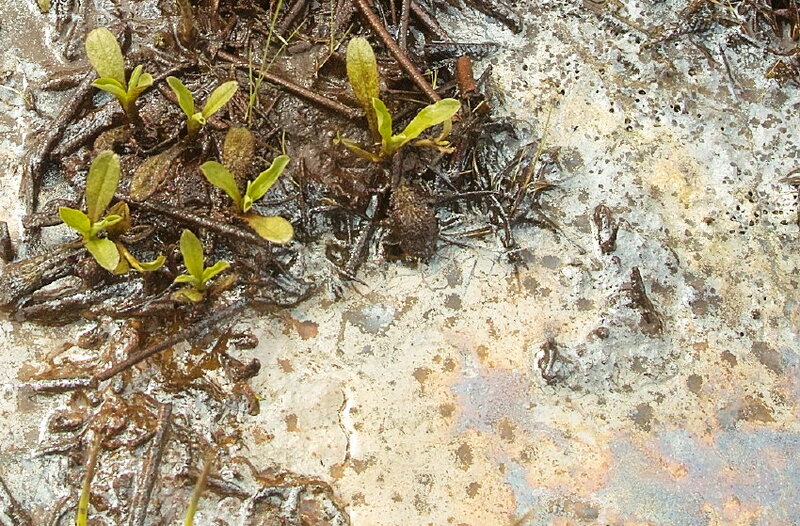 The following day, the same ant hill scene was completely ant free. The annual mating ritual was completed. 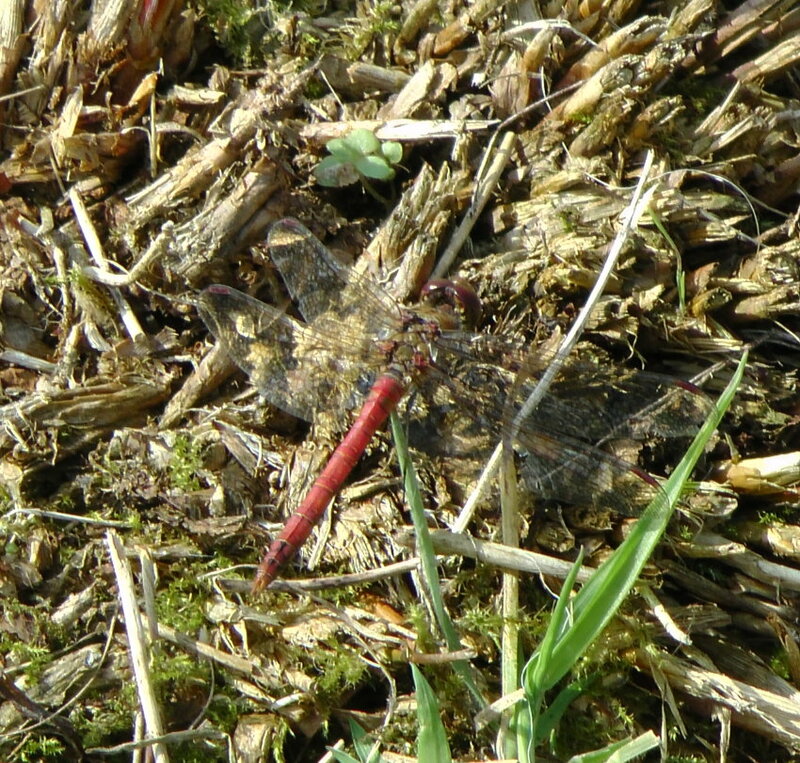 Whilst clearing a section of one of our lower meadow ditches a couple of weeks back, I’d spotted a joined pair of red and yellow dragonflies dipping repeatedly along the narrow peaty ditch for egg laying. I was interested that the pair stayed linked for this – straightened out from the wheel configuration of copulation, but with the upper male seemingly in control of the flying, whilst the lower female hammered her ovipositor beneath the surface at appropriate points. 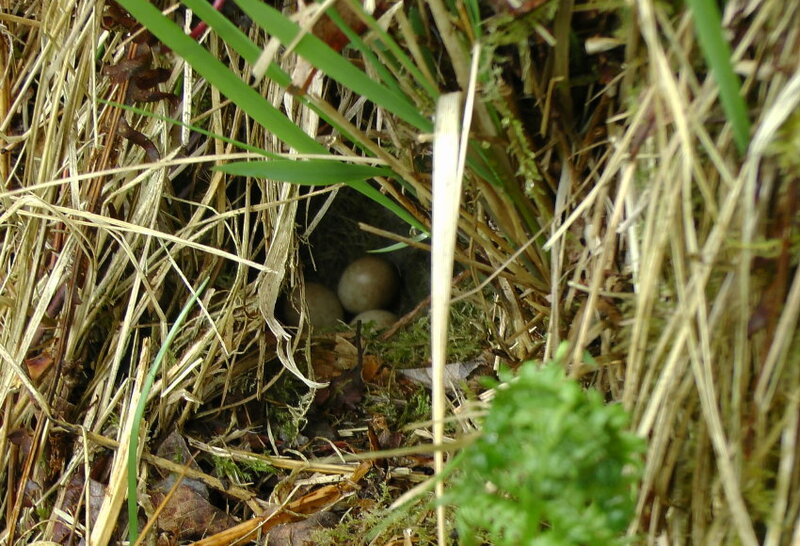 Needless to say I didn’t have my camera with me, so the following day after collecting a couple of eggs from the poultry and placing them in my shorts for safe keeping, I picked up the camera and ditching hoe and headed back down for another hour or so of ditching effort. 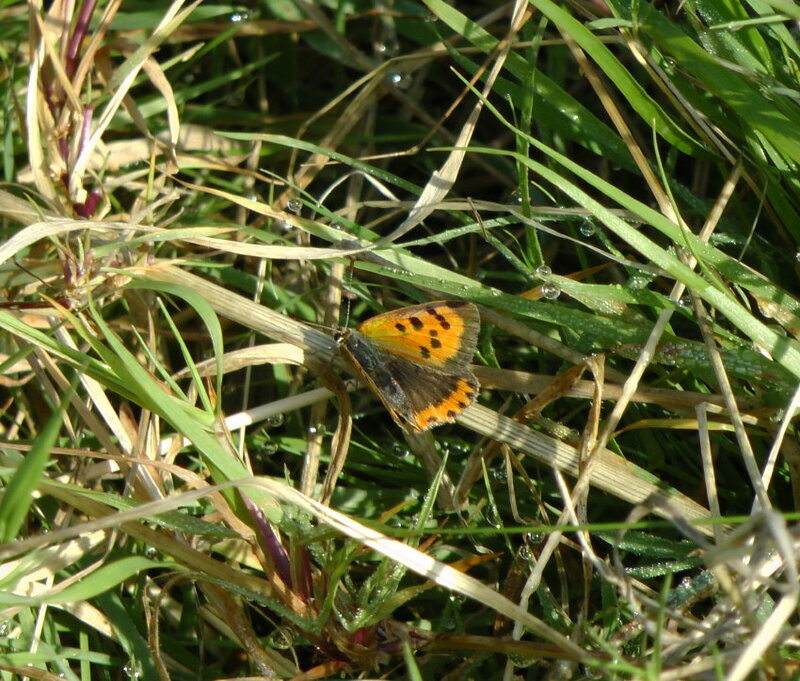 A Small Copper butterfly appeared, always a delight… With the sun rising, and the sweat falling I headed for the upper pond to see what Dragonflies were still around. 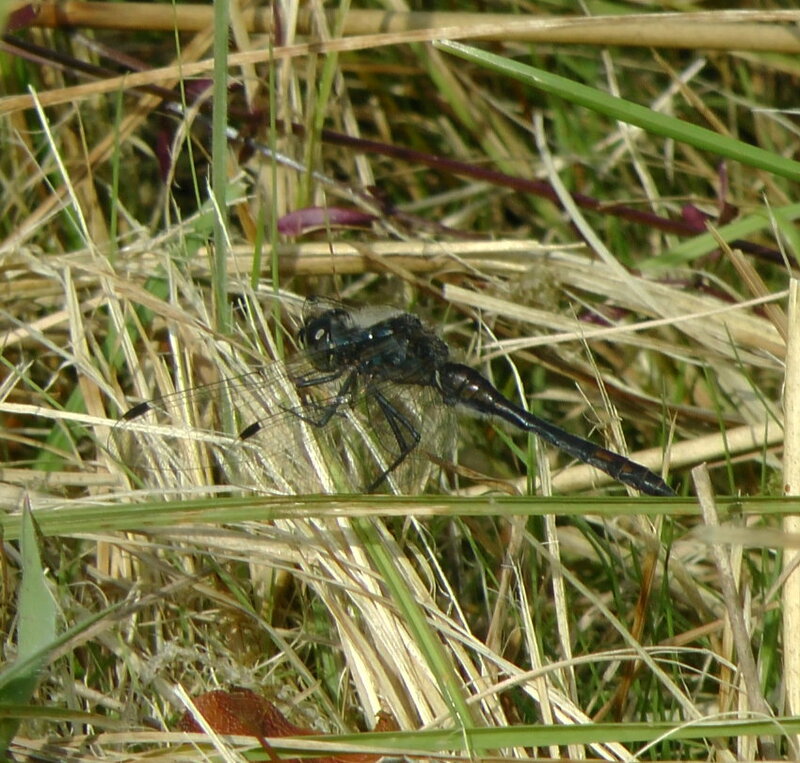 Have you ever tried photographing a Dragonfly? The problem with using this is the delayed shutter release when operating it in still capture mode. 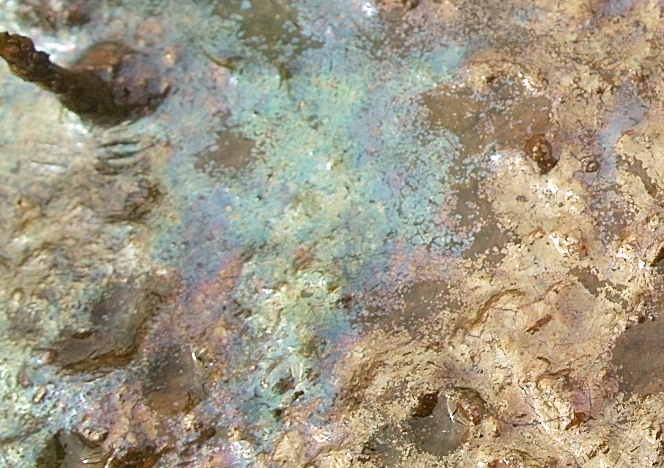 So I hoped for at least a few usable images if I took enough in the first place. 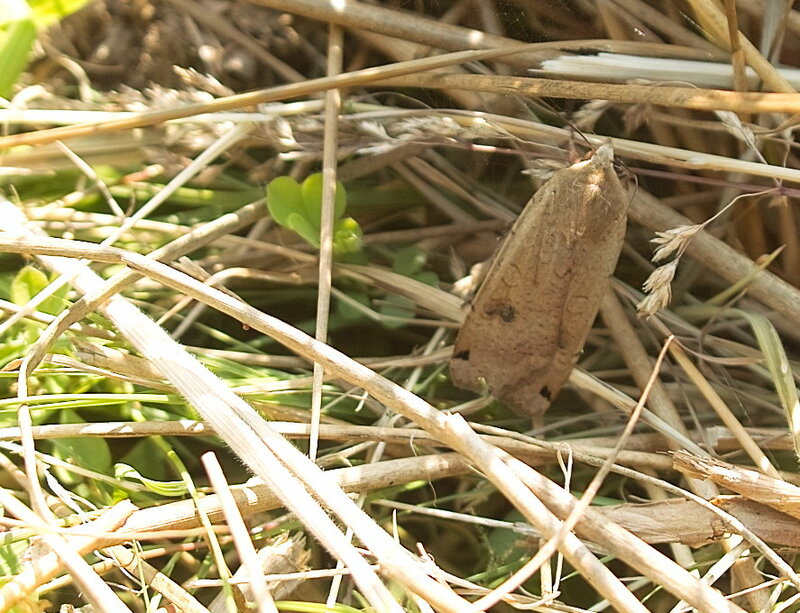 But after crouching for several minutes to get the right angle to capture an insect against a background where it would be more visible, my knees complained, so I opted to lie on one side on the still slightly dewy damp grass. 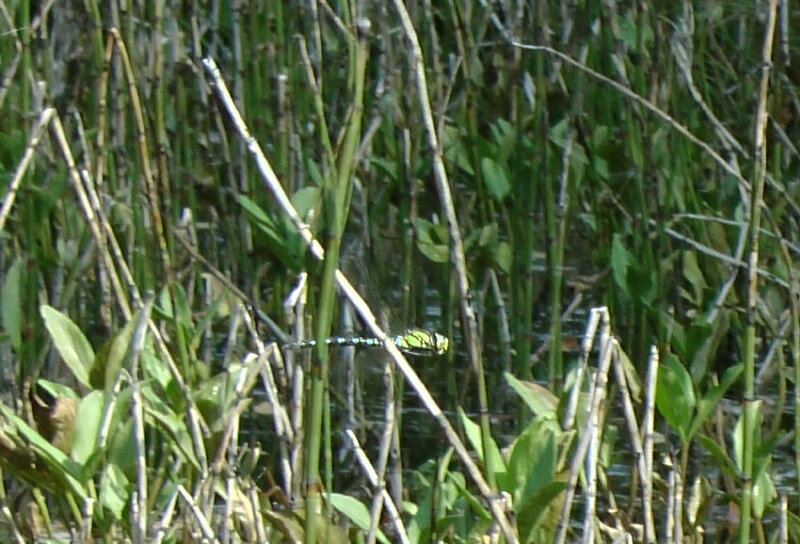 Much more comfortable, and easier for my hands to hold the camera still, and basically wait for a patrolling dragonfly to fly within the general area of where the camera was pointing. Click the shutter, and hope. 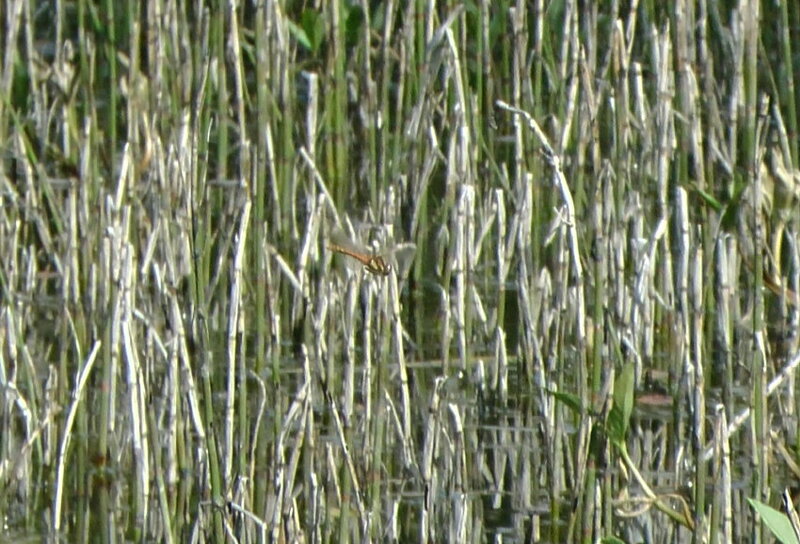 Another quarter of an hour or so, and I reckoned I’d maybe got one or 2 shots where the dragonfly was actually photographed in the frame. 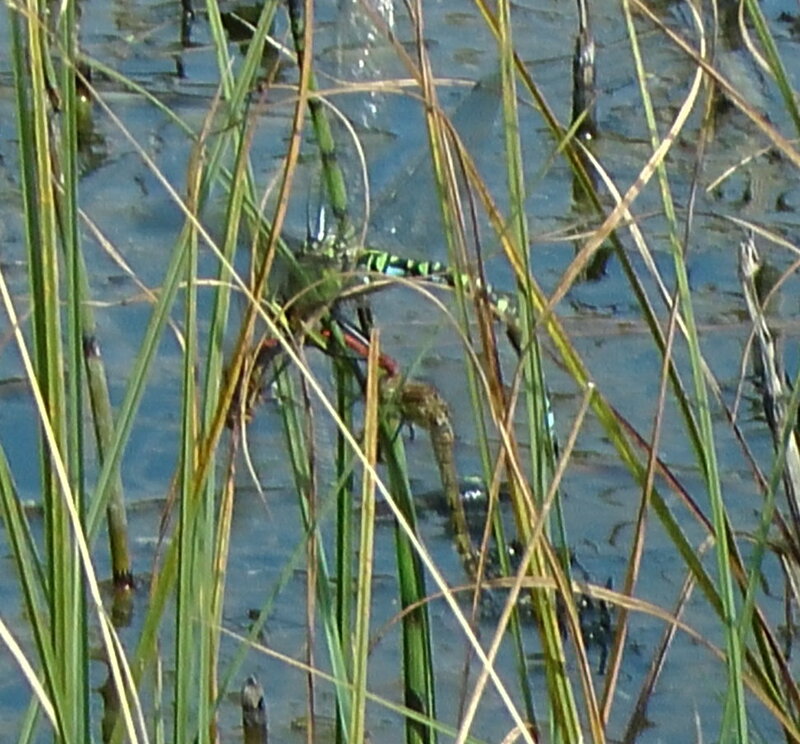 (Only later on screen was I able to work out what some of the species were… Common Darter -male and female, Black Darter and Southern Hawker).